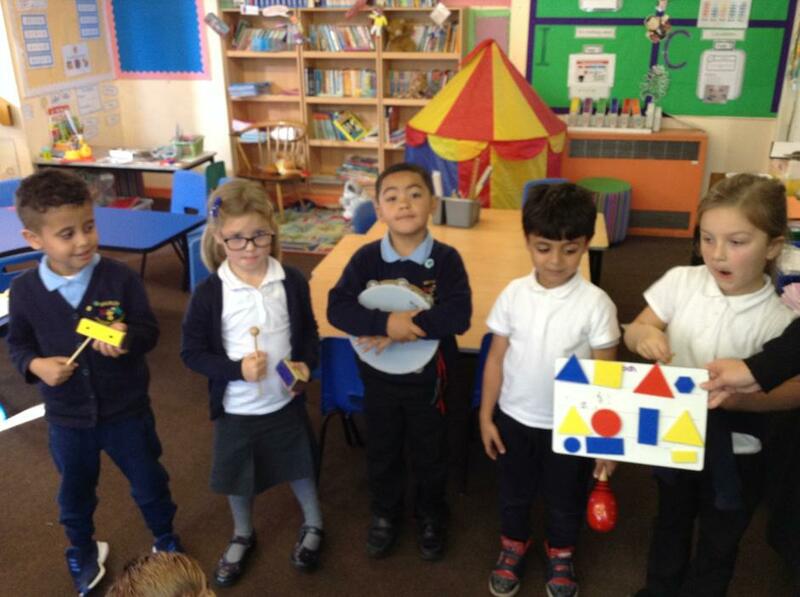 The children have been learning how many sides, corners, whether a side is straight or curved and whether the sides are the same length with these four shapes. 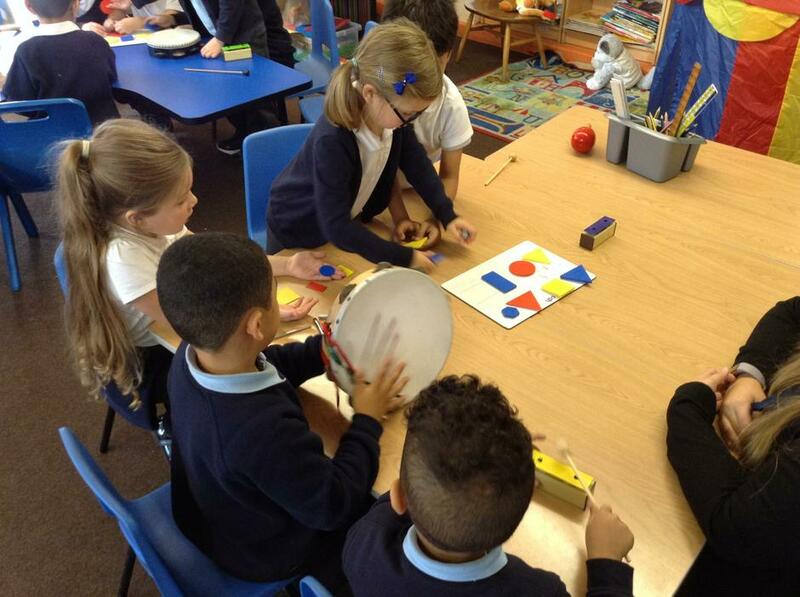 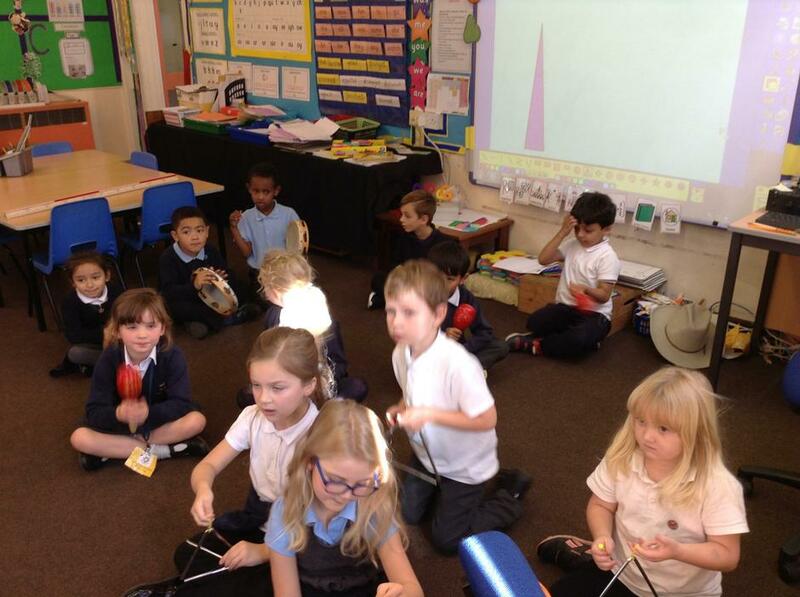 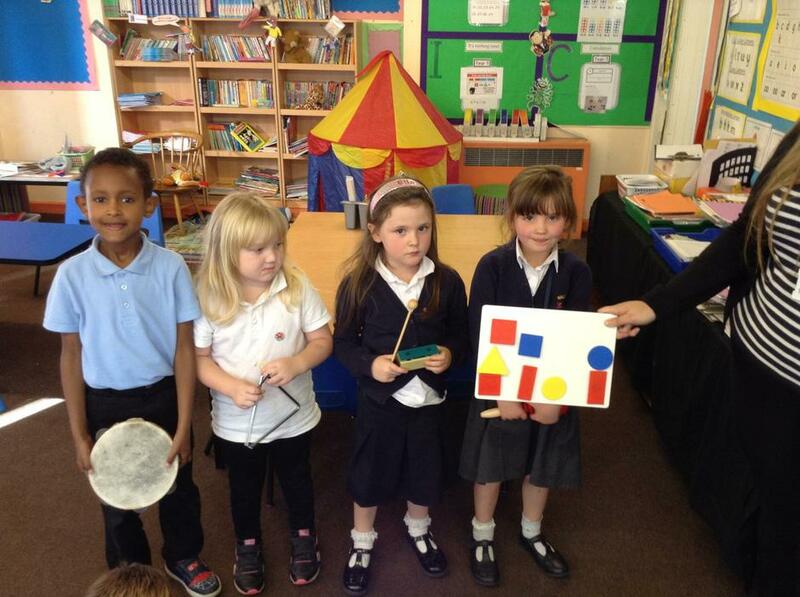 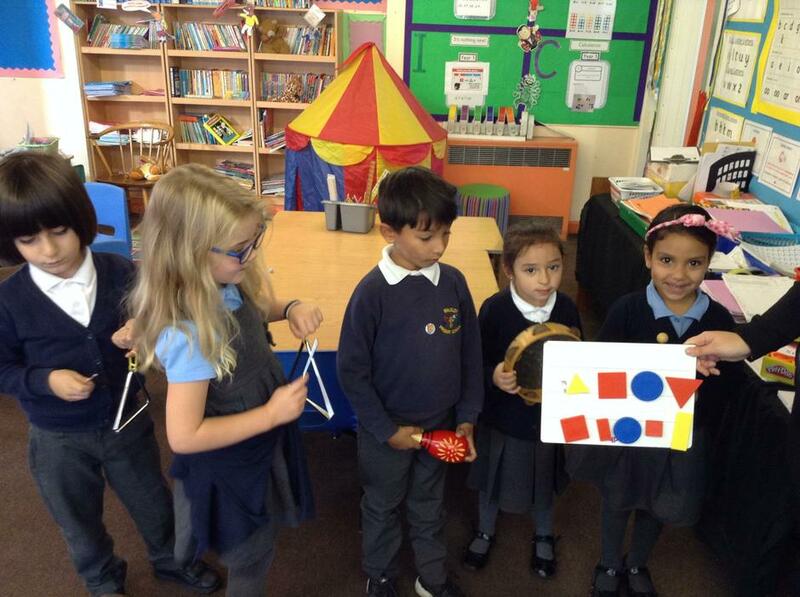 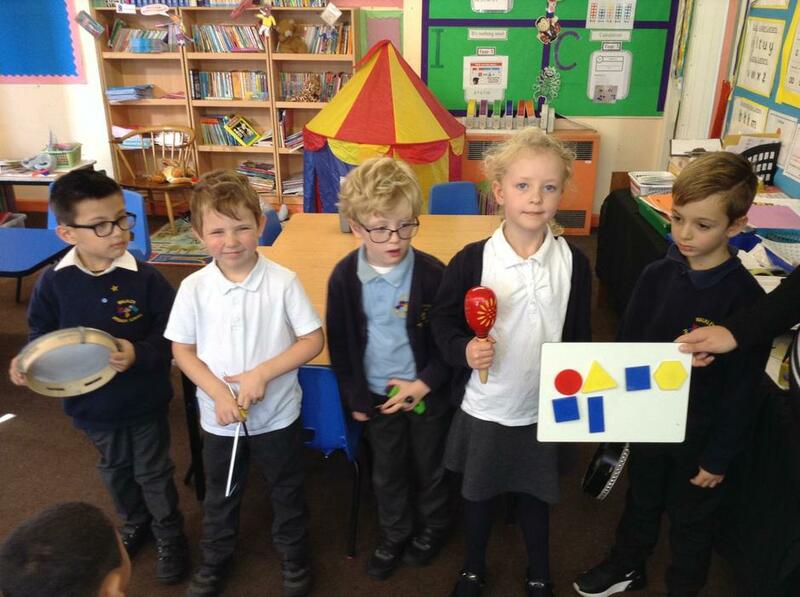 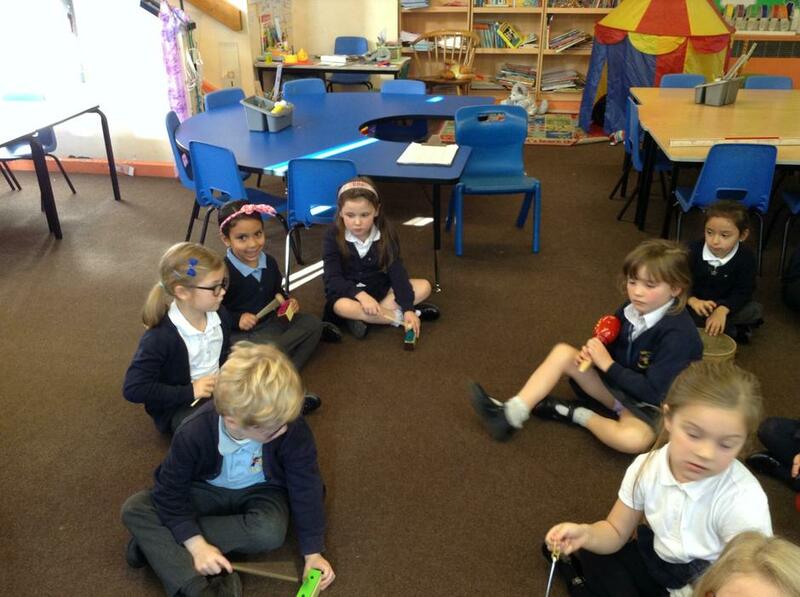 To make our learning more fun and incorporate some music, we decided to represent the shapes with musical instruments and start our very own shape orchestra. 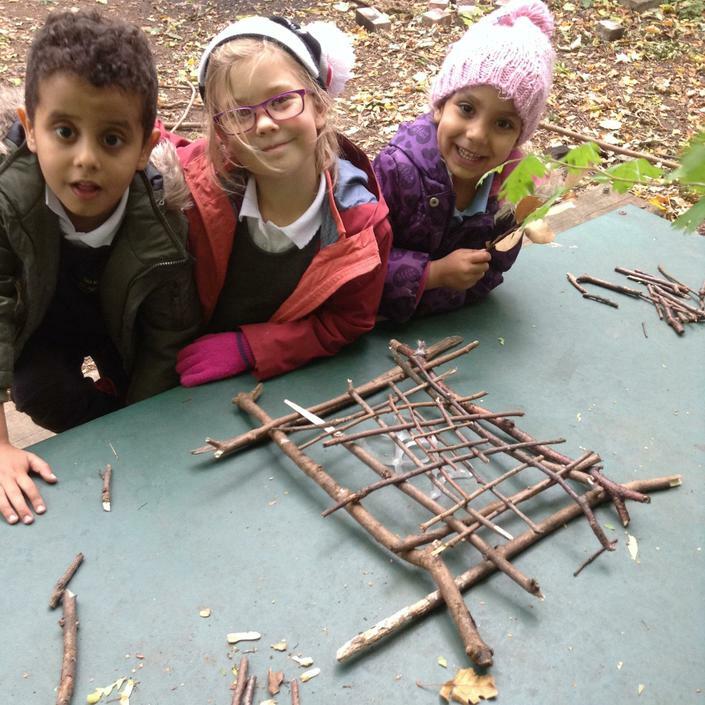 After learning about environmental artists such as Andy Goldsworthy and Chris Drury using woodland materials to build and create 3D art and sculptures, we decided we would build our own twig sculptures. 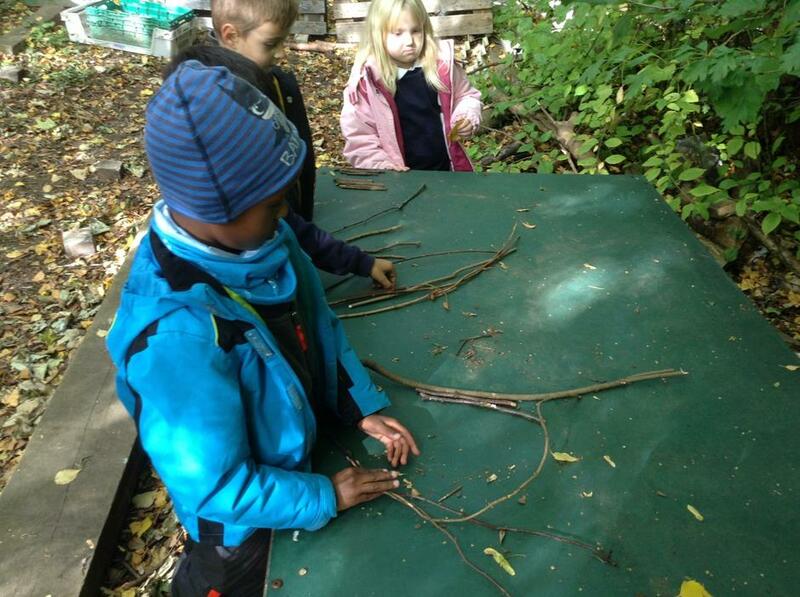 To do this we would need twigs from long to short. 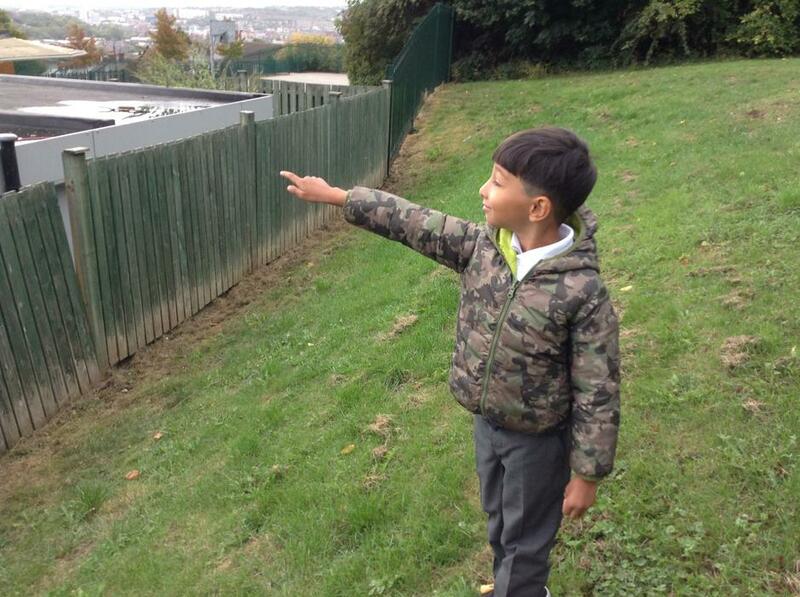 This was a perfect opportunity to show our skills in comparing and describing lengths. 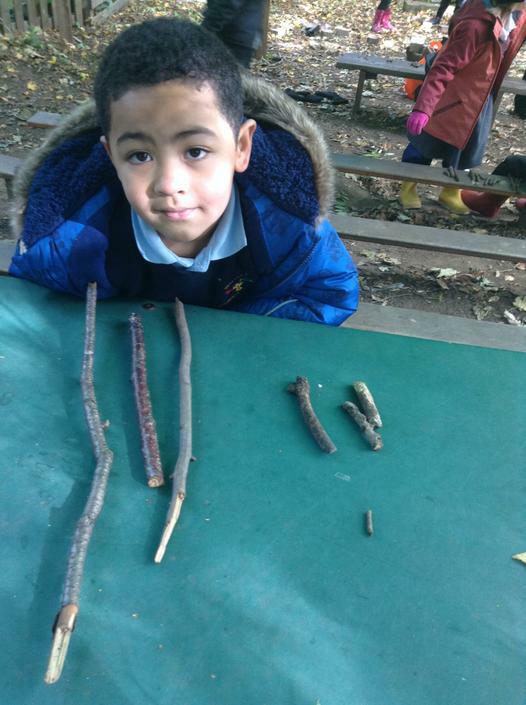 The children were able to describe longest to shortest and when questioned, could describe which were longer and which were shorter. 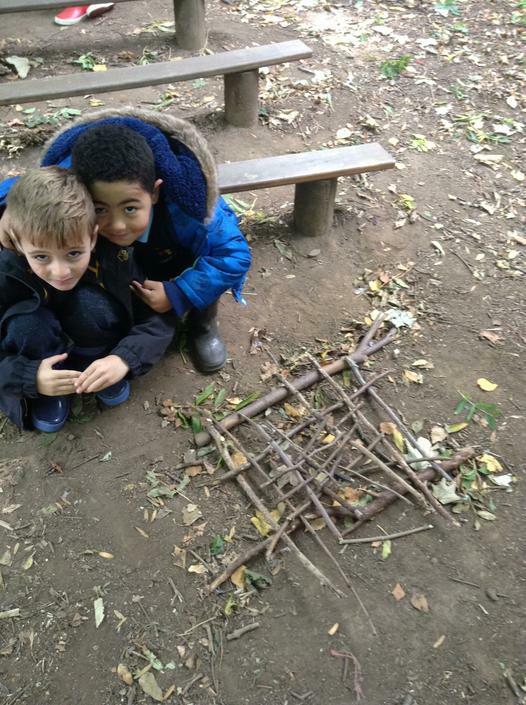 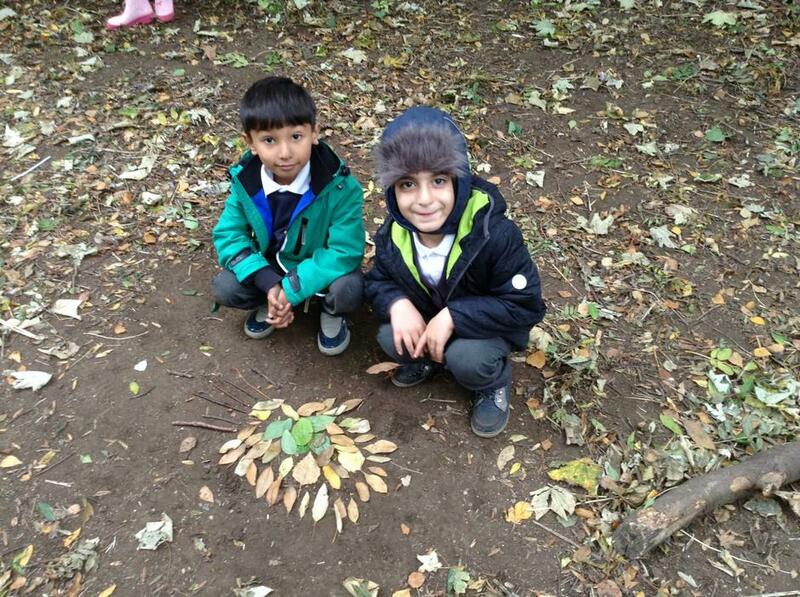 We looked at some work by environmental artists such as Andy Goldsworthy and Chris Drury who use natural woodland materials to build and create 3D art and sculpture in the woods. 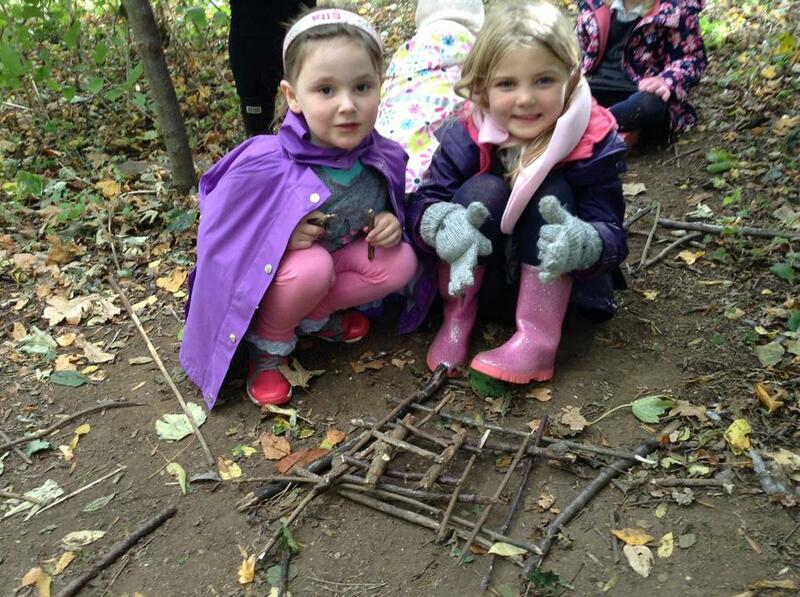 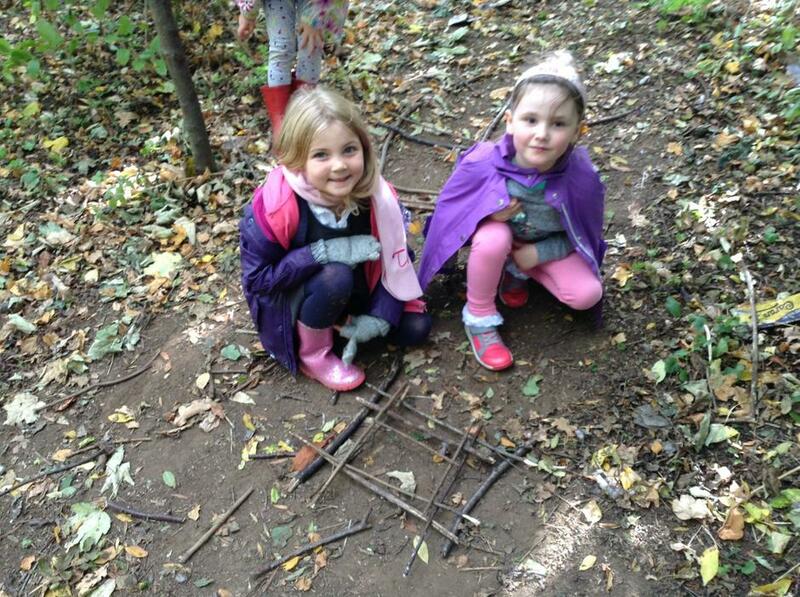 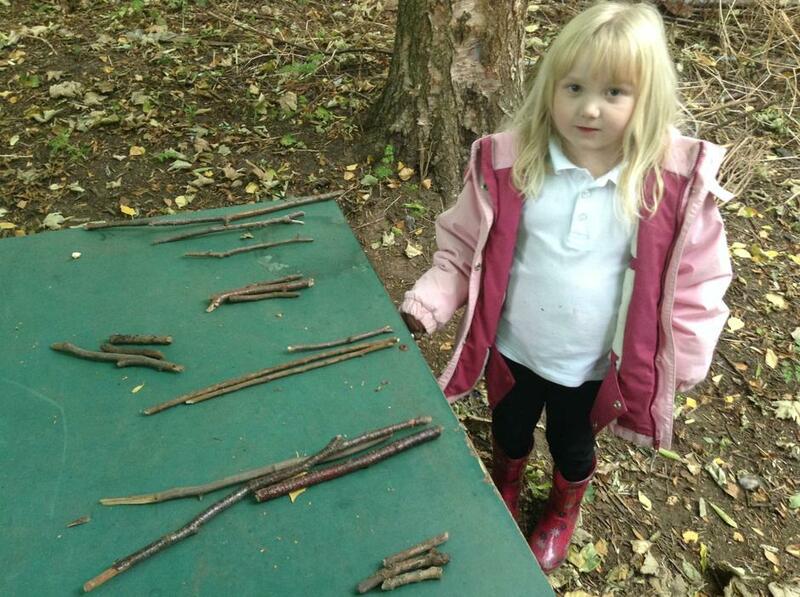 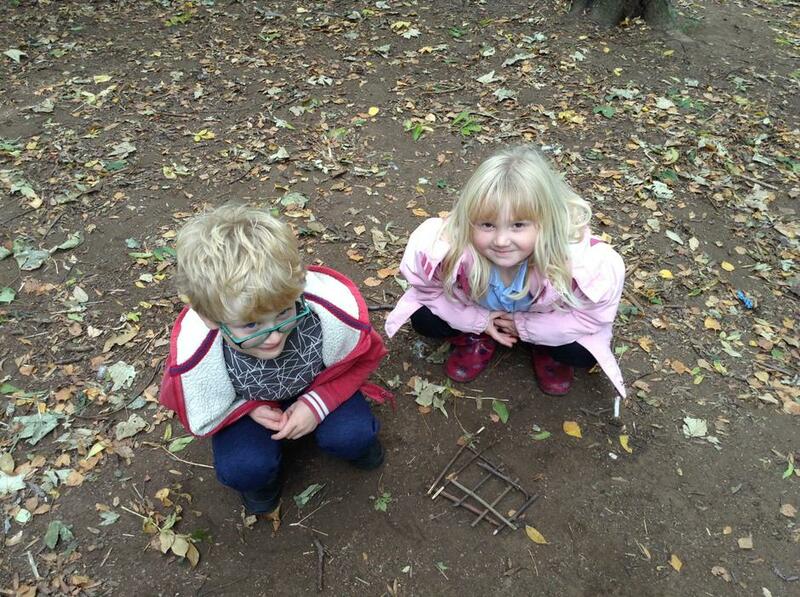 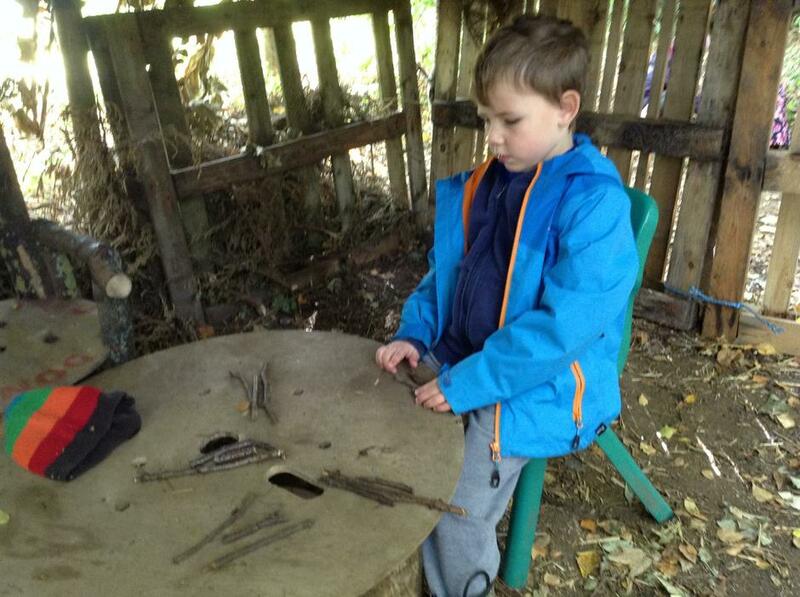 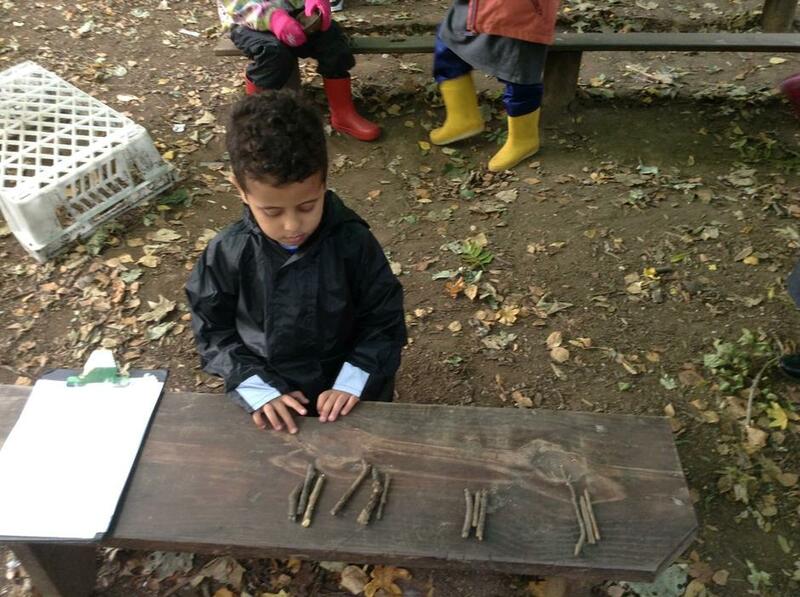 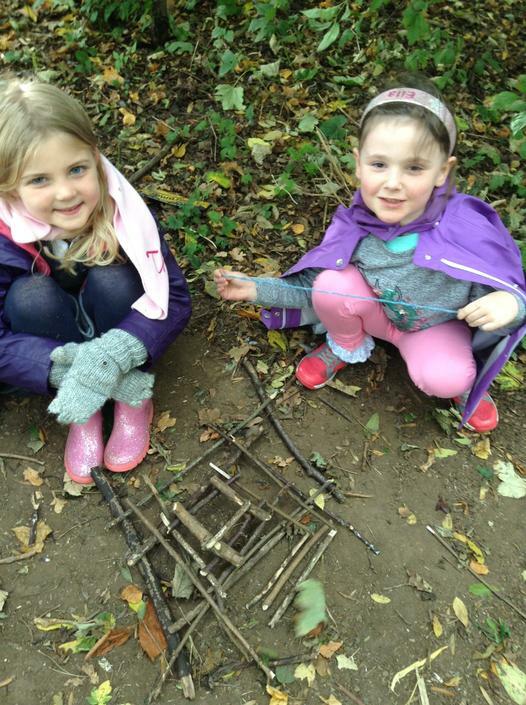 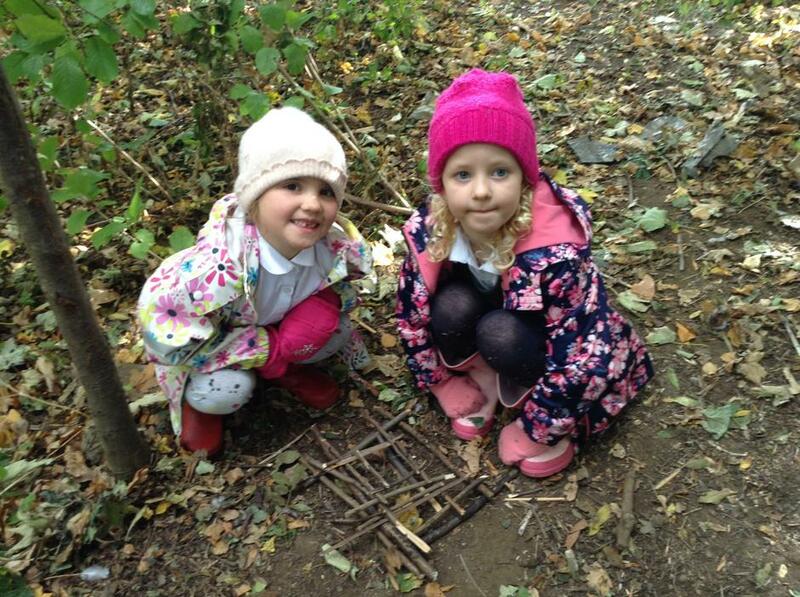 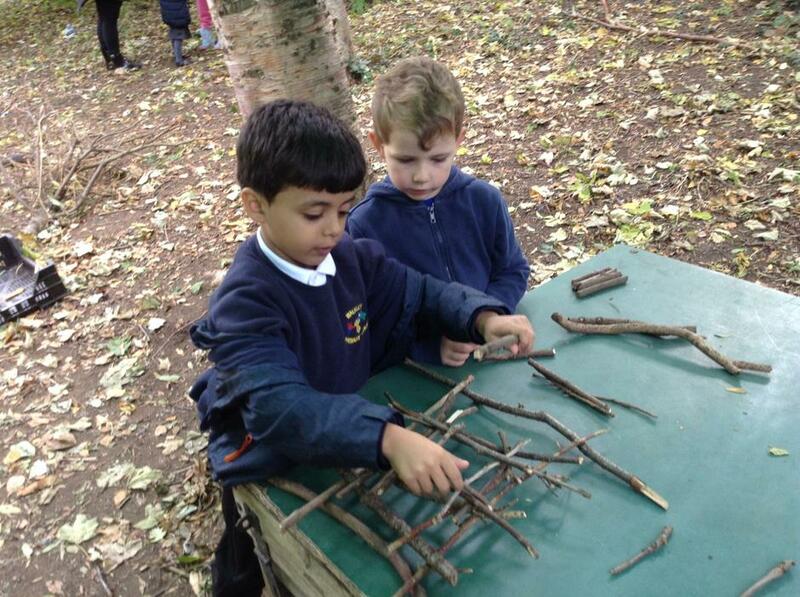 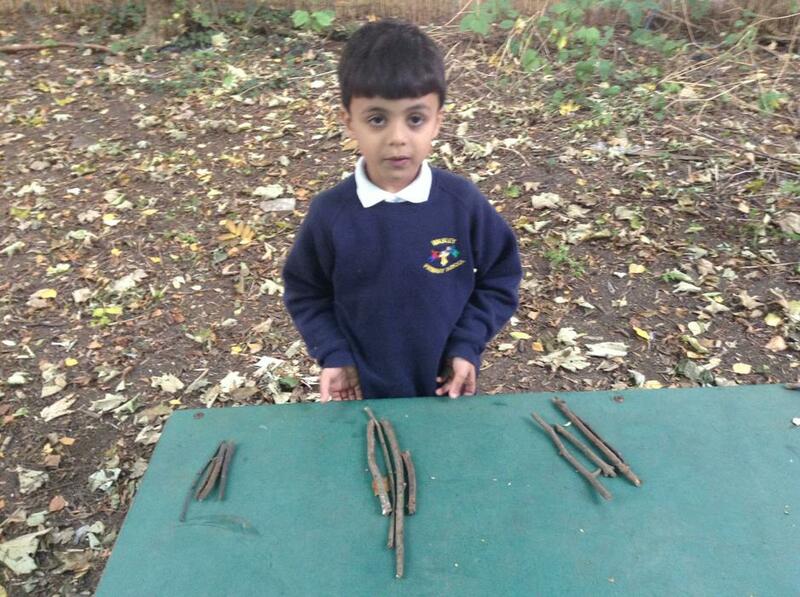 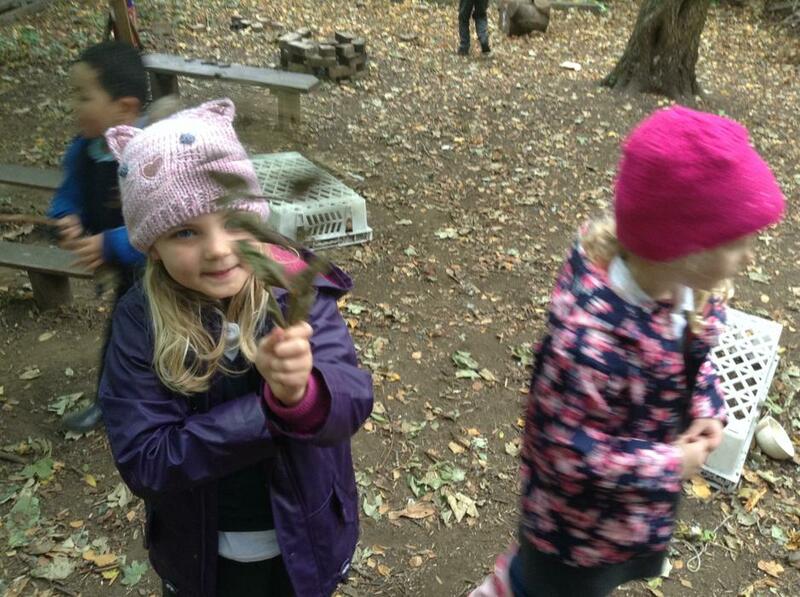 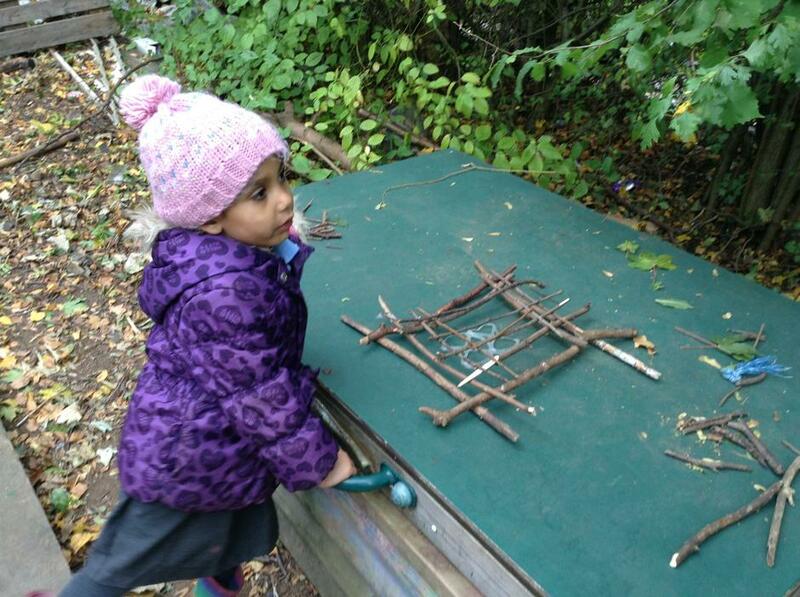 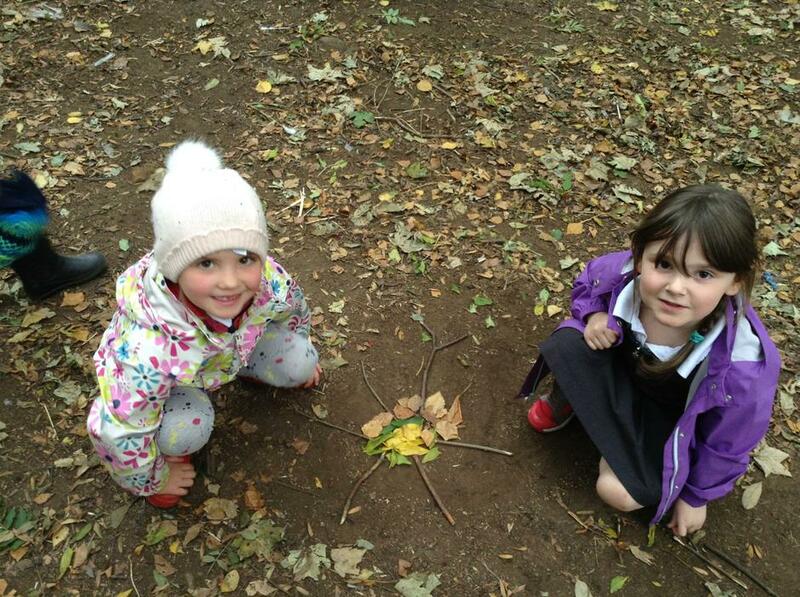 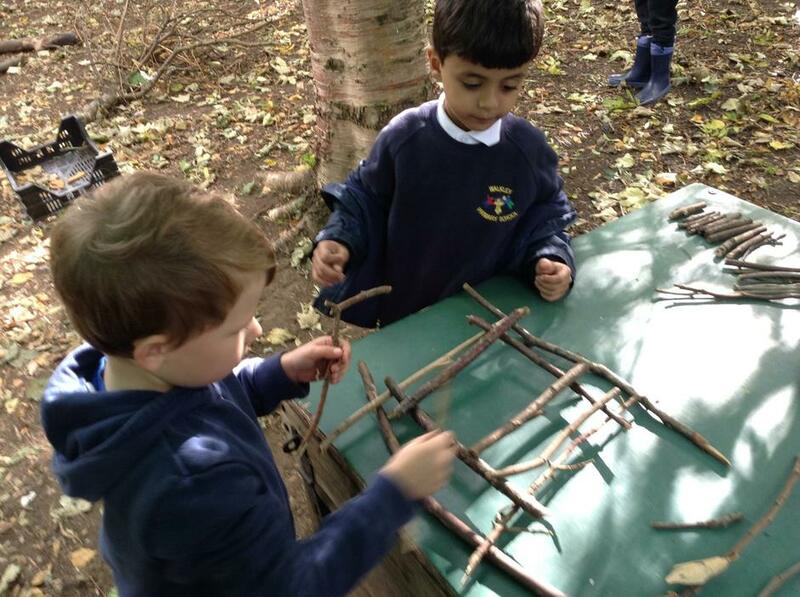 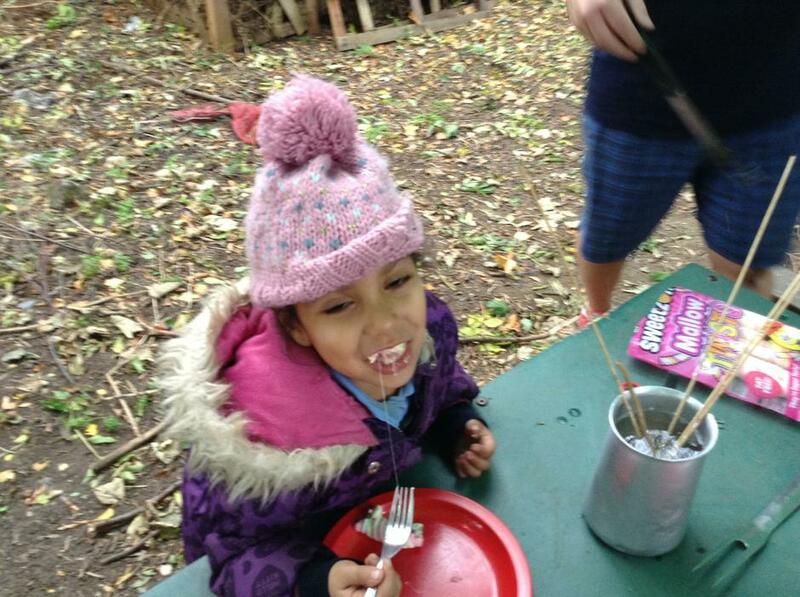 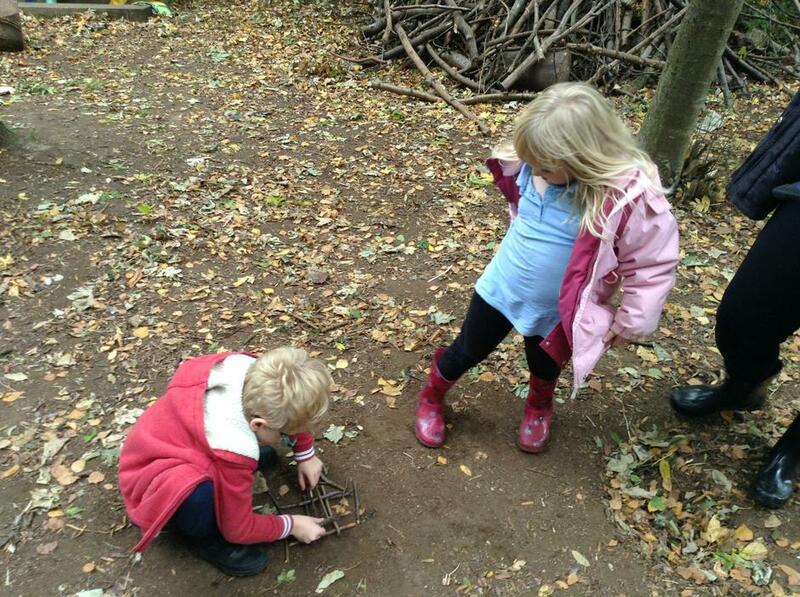 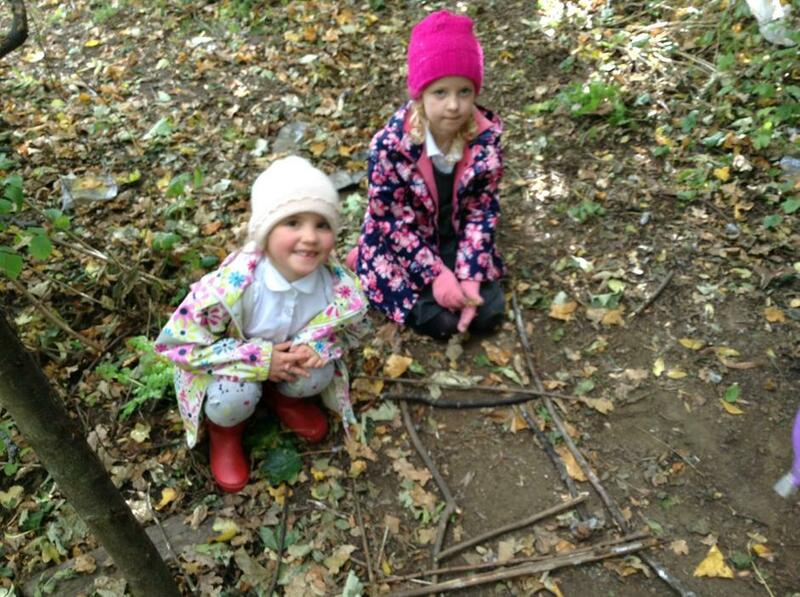 The children were given the task of building their own twig tower sculptures in our forest school. 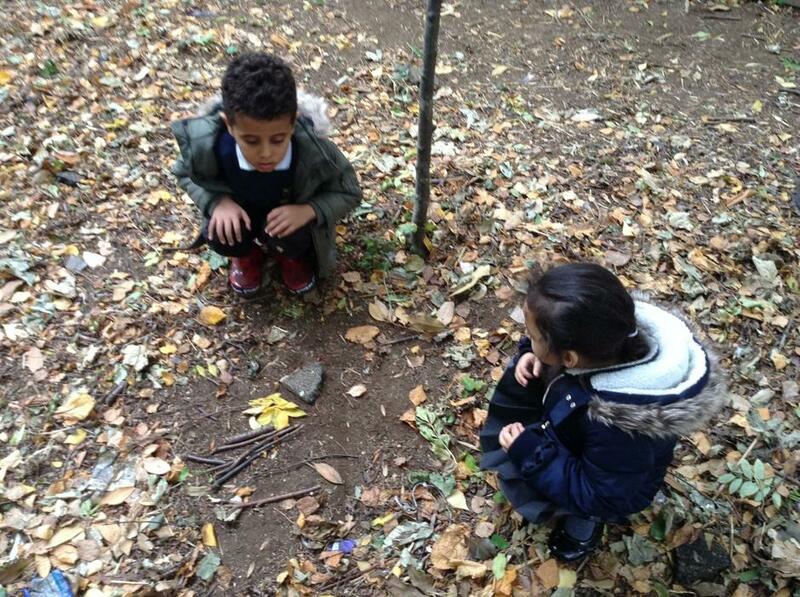 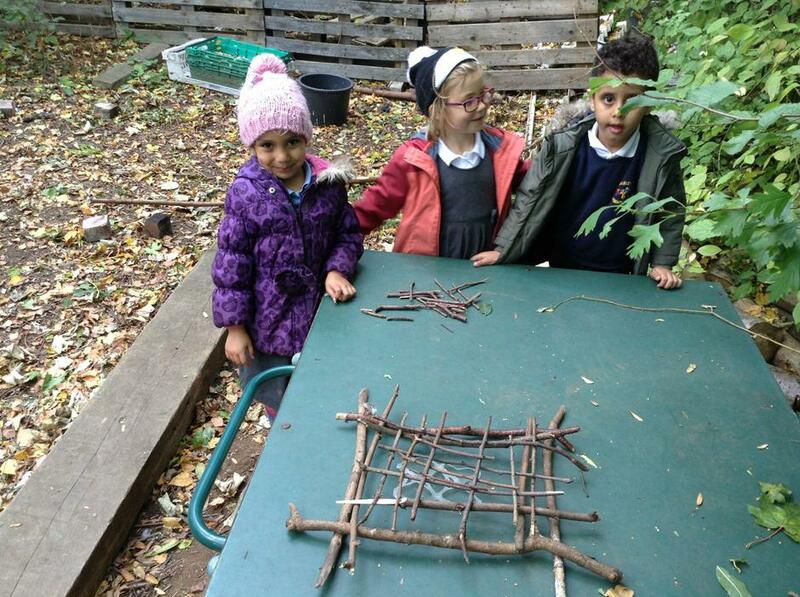 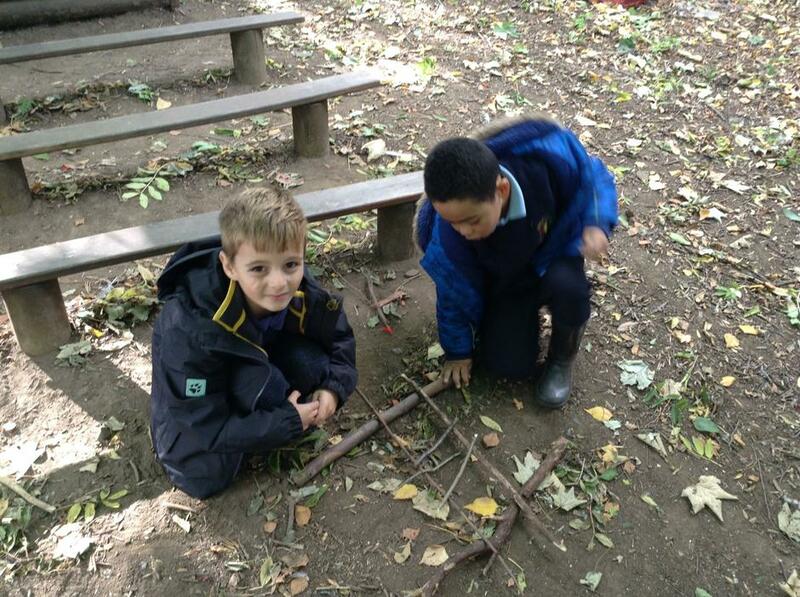 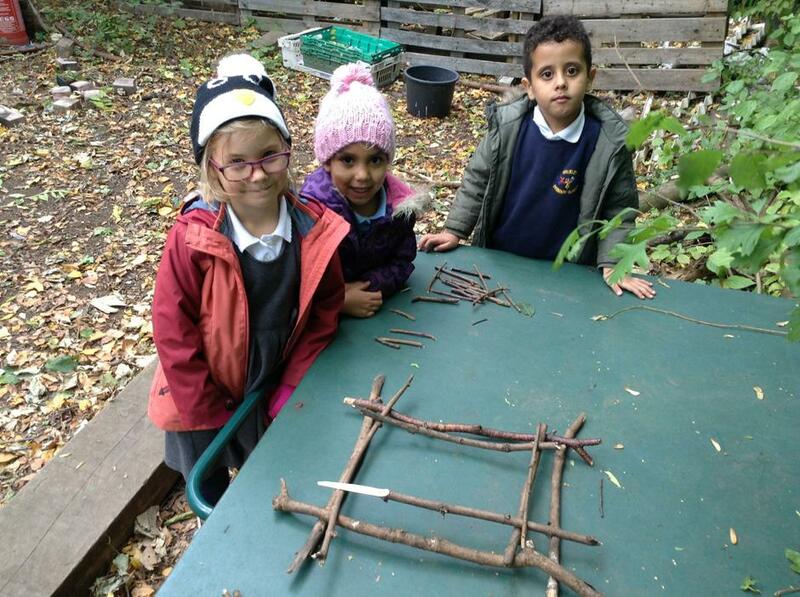 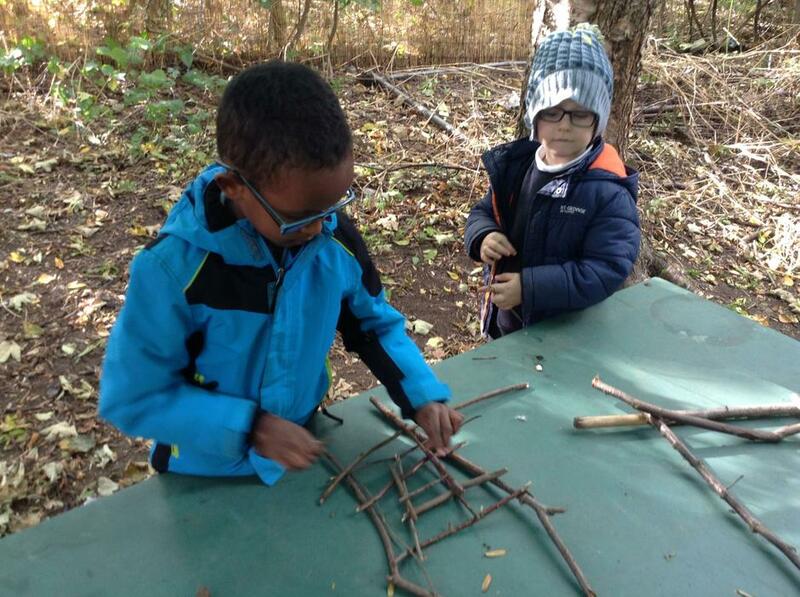 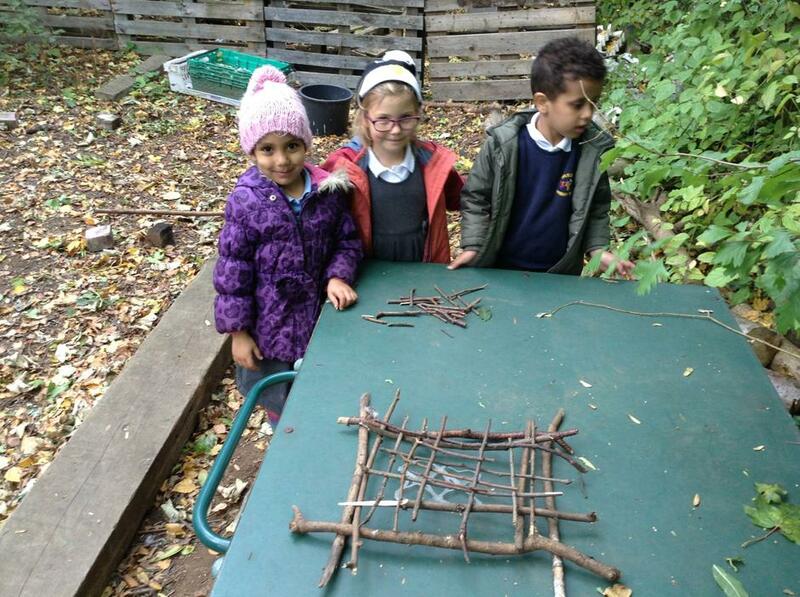 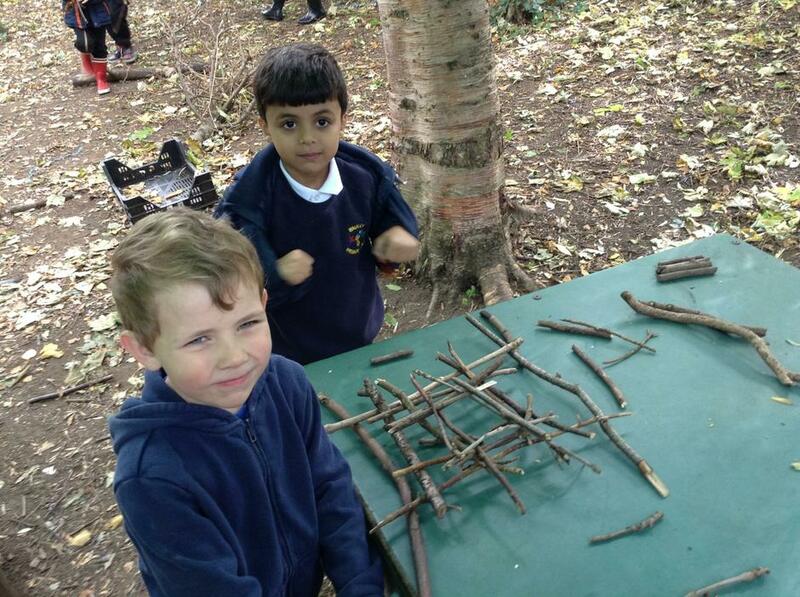 They were encouraged to gather some twigs, ready to create their twig towers. 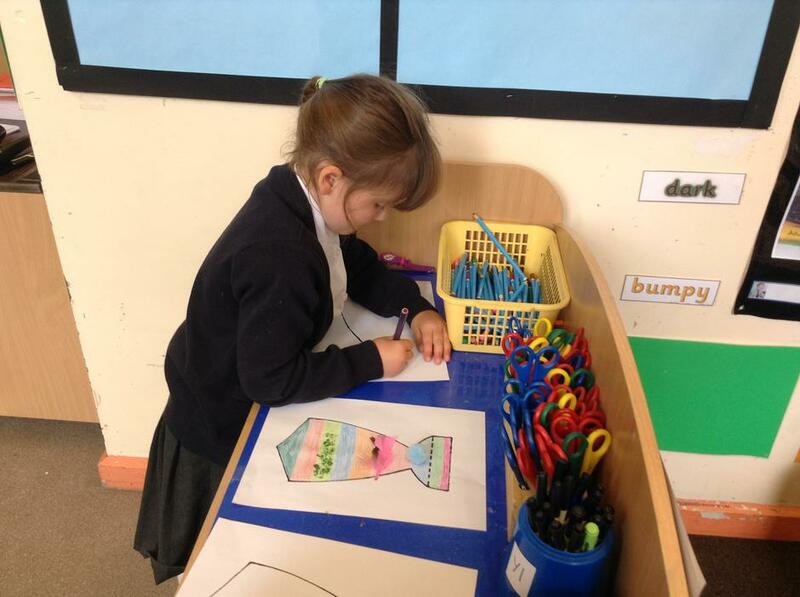 It could have a square base, a triangular base or be of their own designs. 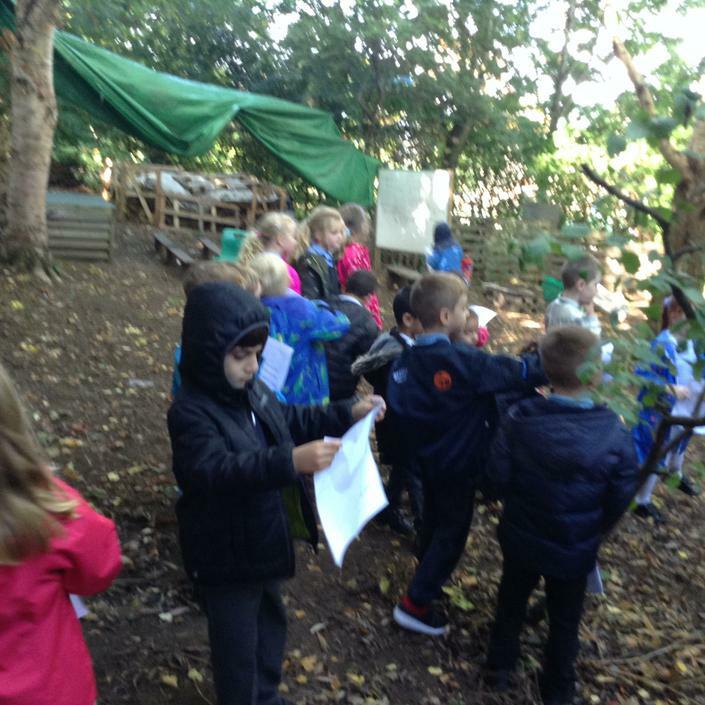 Although we have had only three days, we've fit a week's worth of activities in! 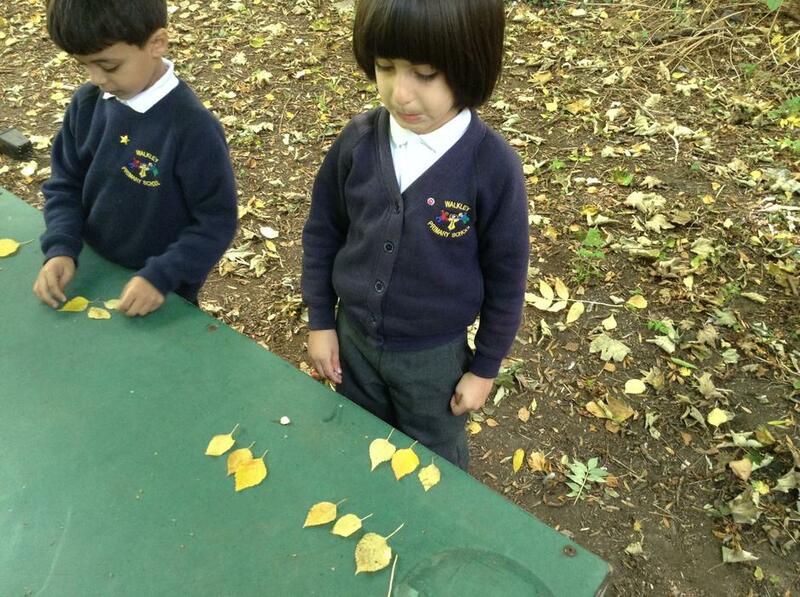 Multiplication Step 4: I can find the total number of objects. 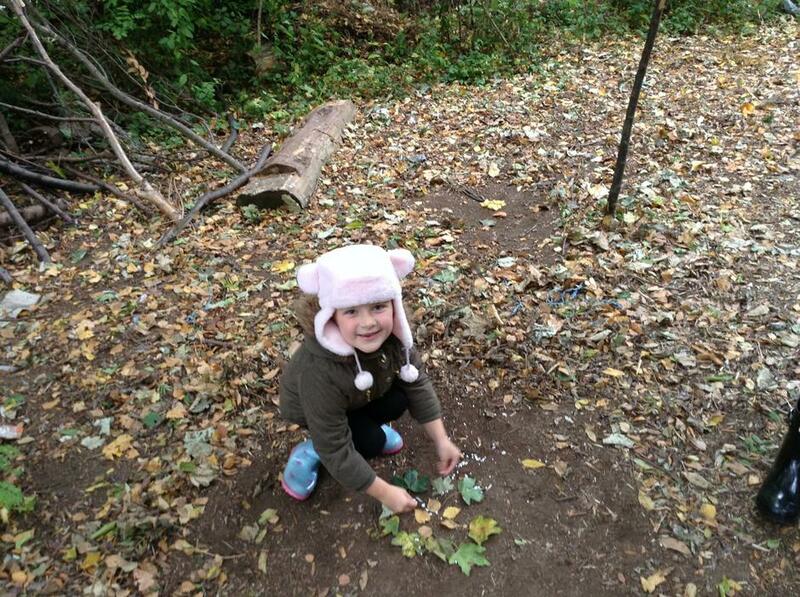 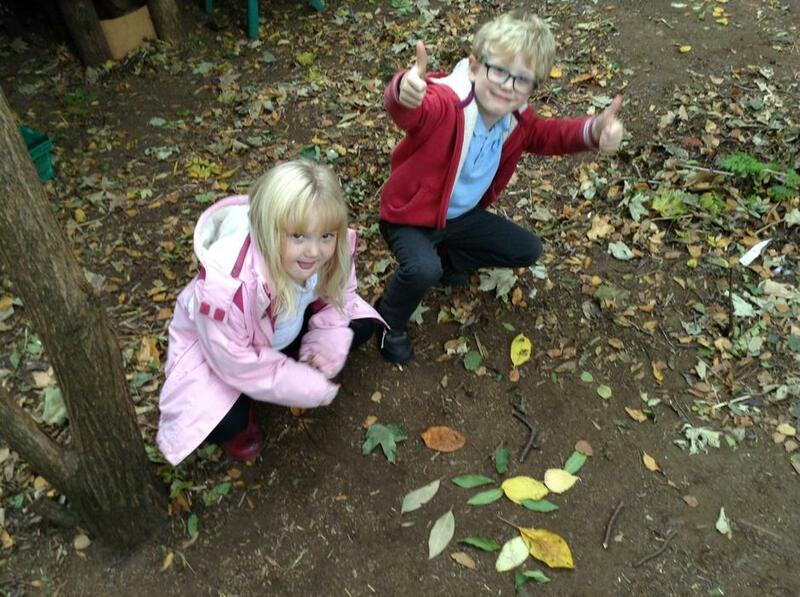 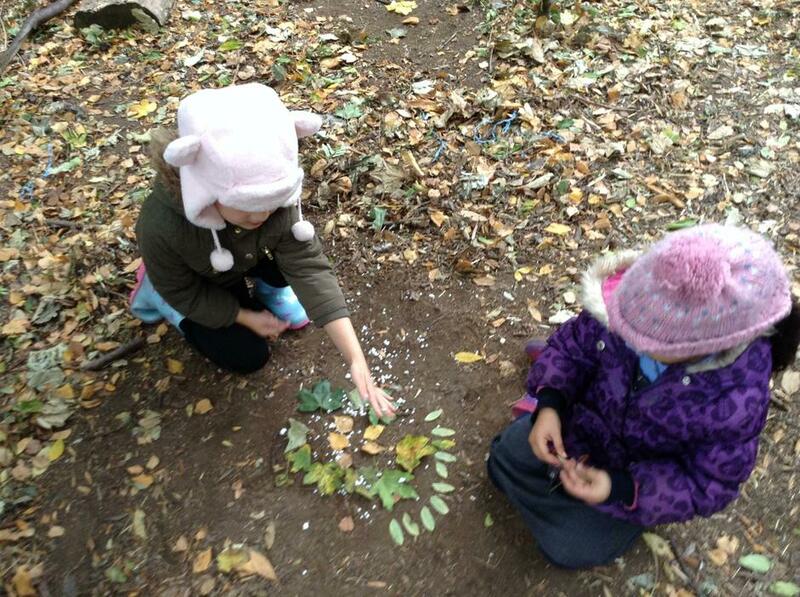 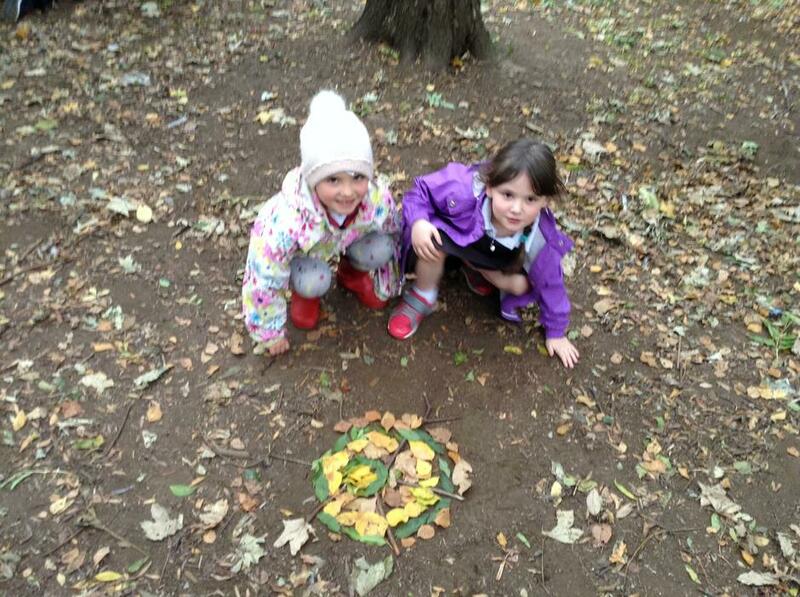 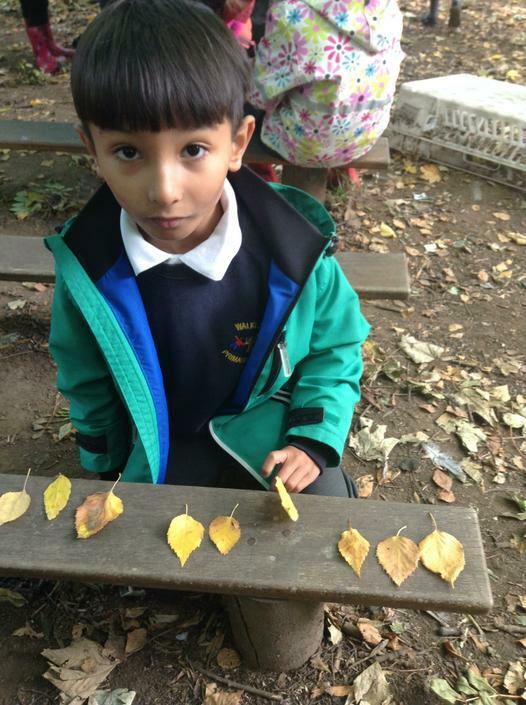 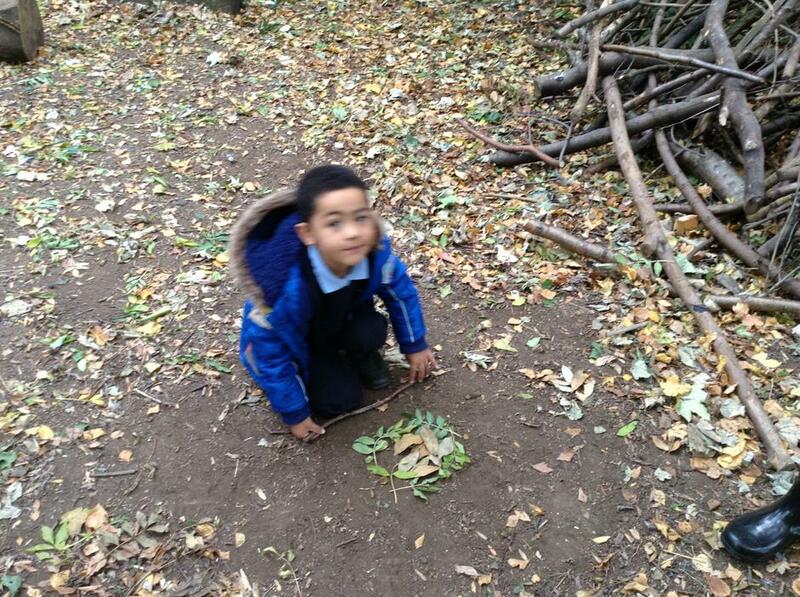 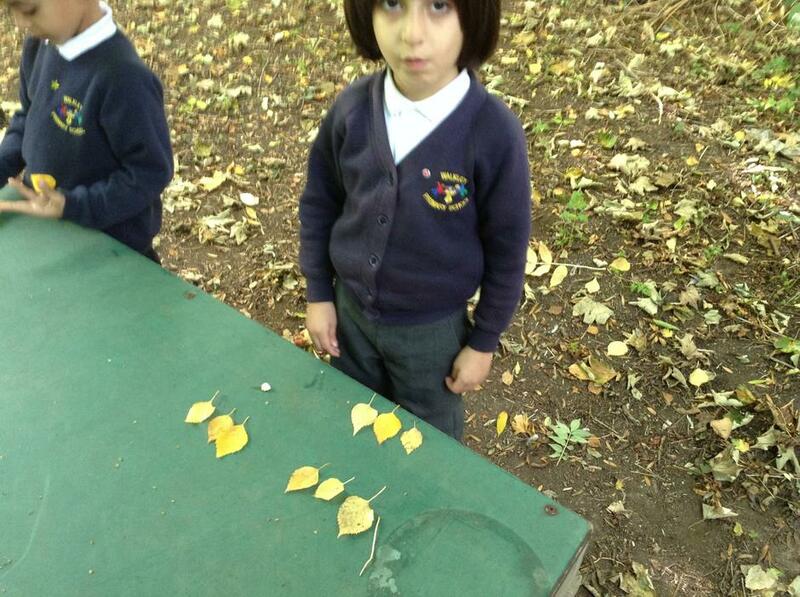 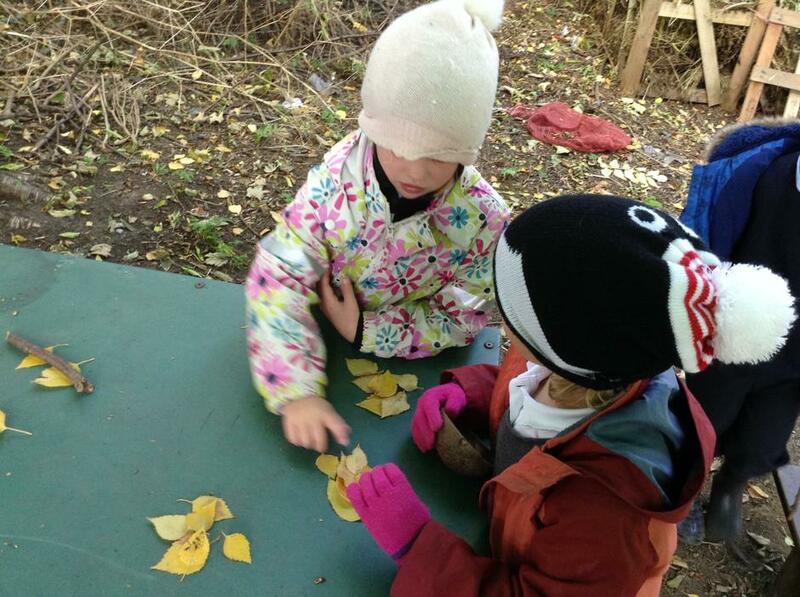 The children collected leaves and sticks in order to make groups and work out multiplication problems. 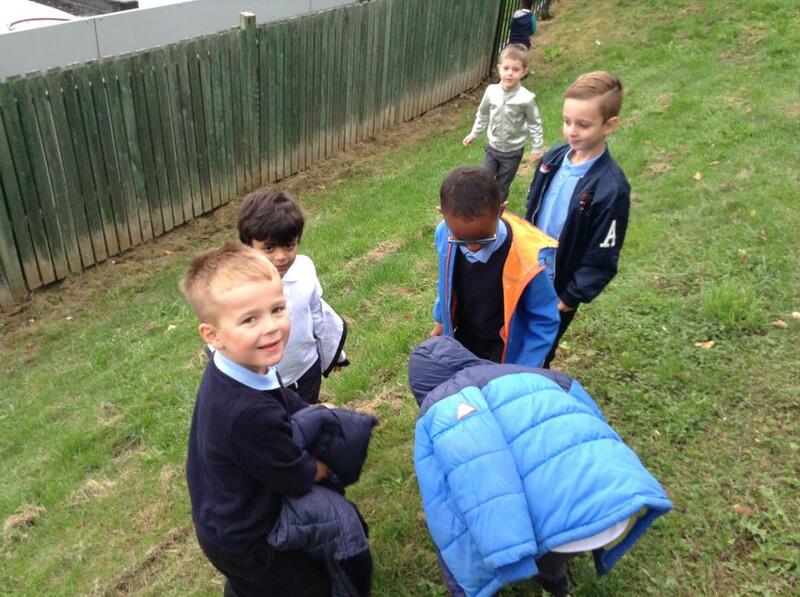 "It gets colder and colder." 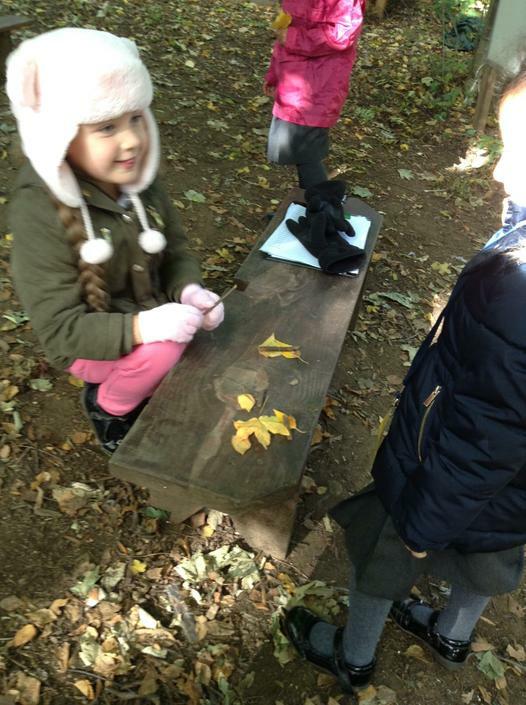 "Conkers are a sign of Autumn." 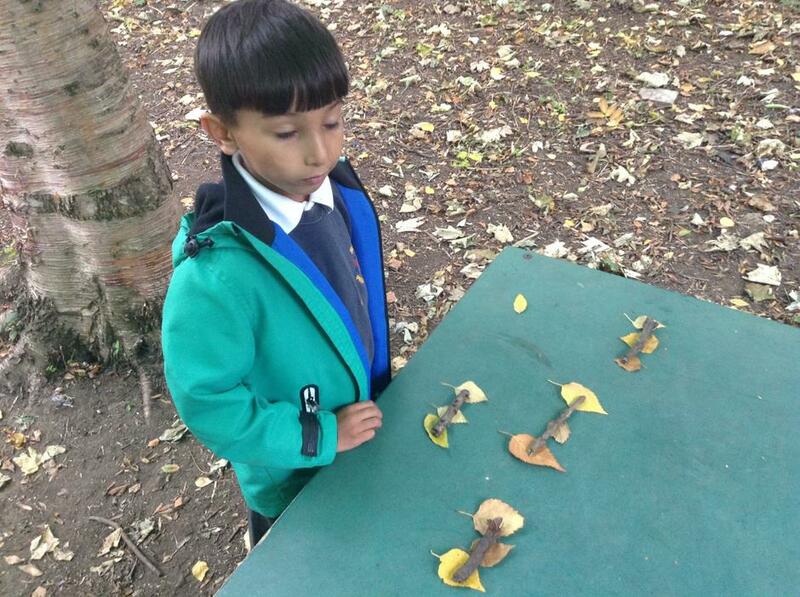 "The leaves fall off the trees." 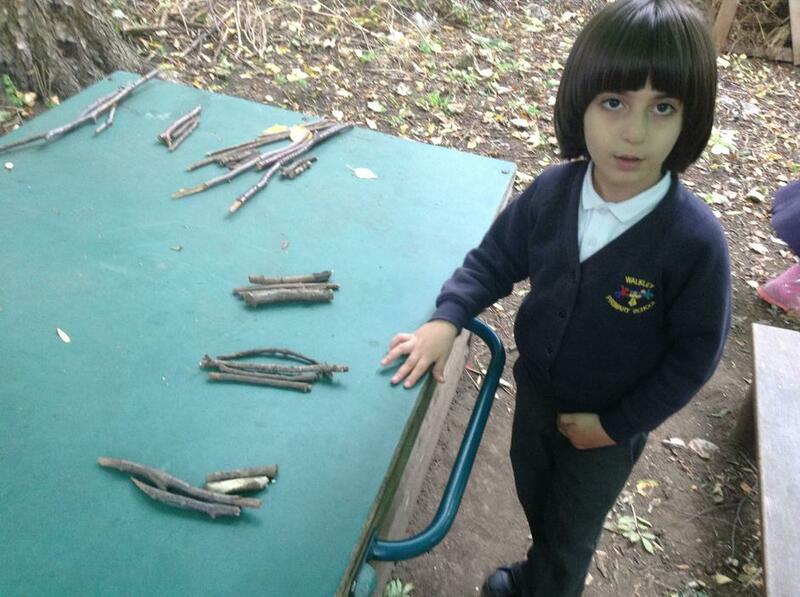 "When it's windy, sticks get blown off the trees." 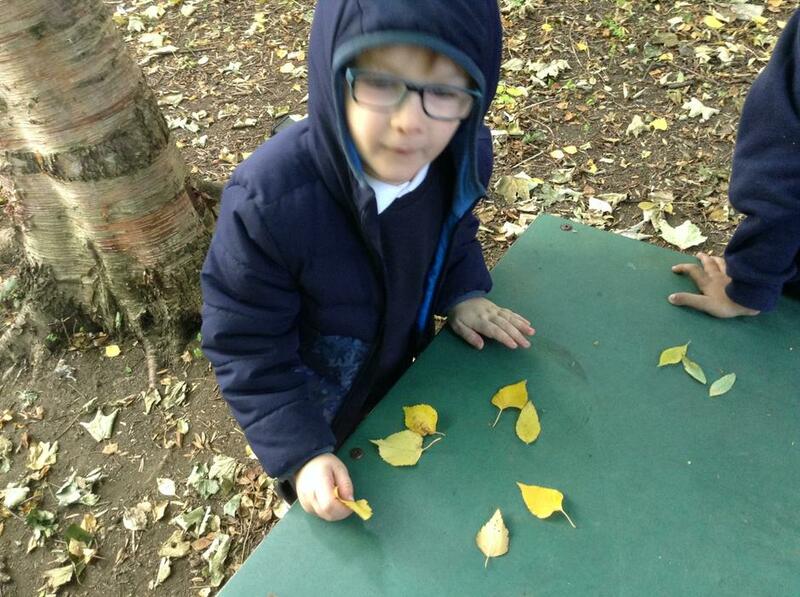 "The leaves turn yellow and fall down." 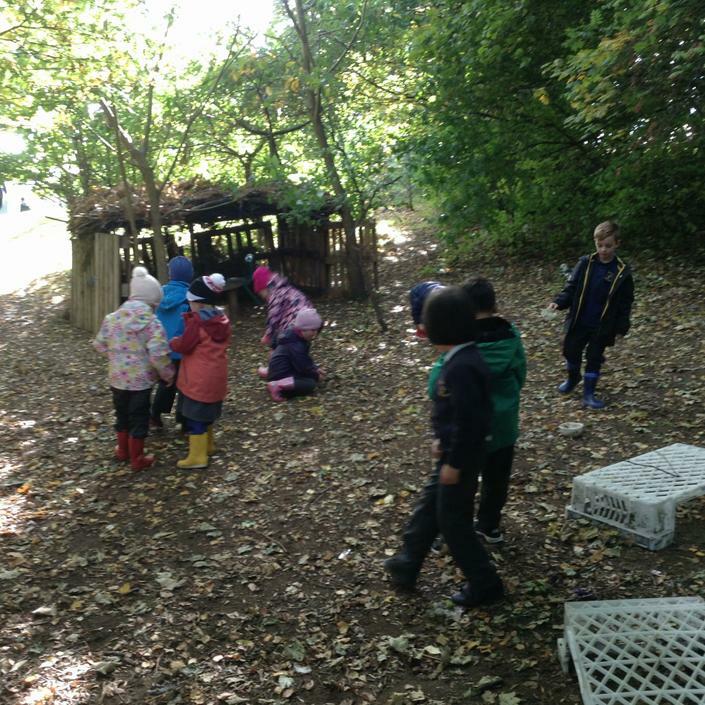 "Some animals hibernate." 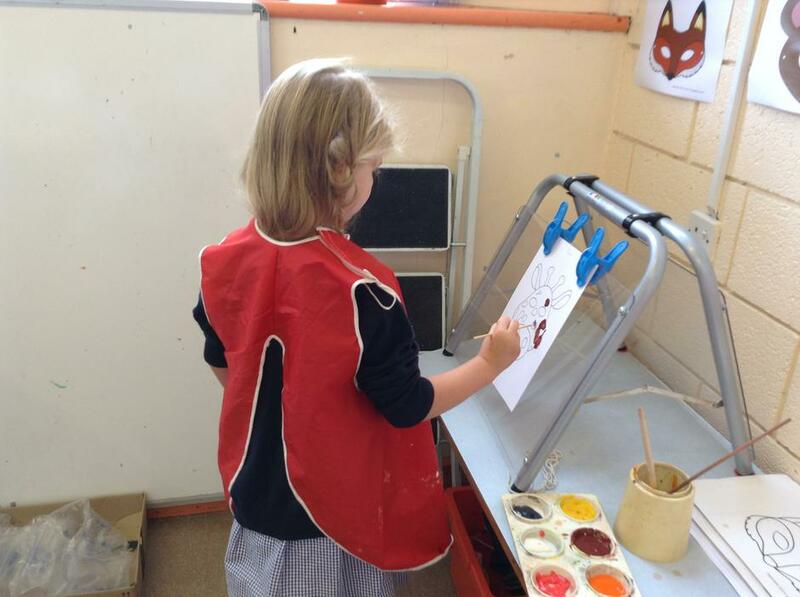 "The animals' fur gets thicker." 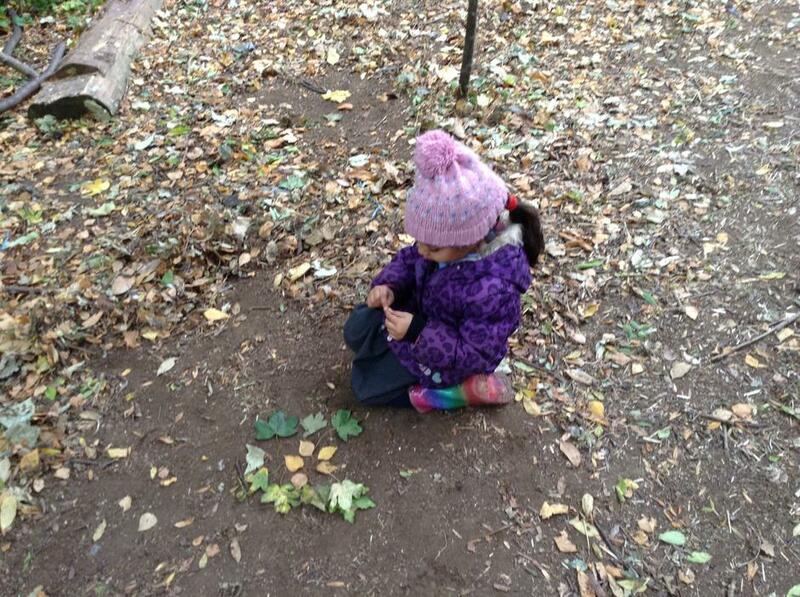 "I found lots of acorns." 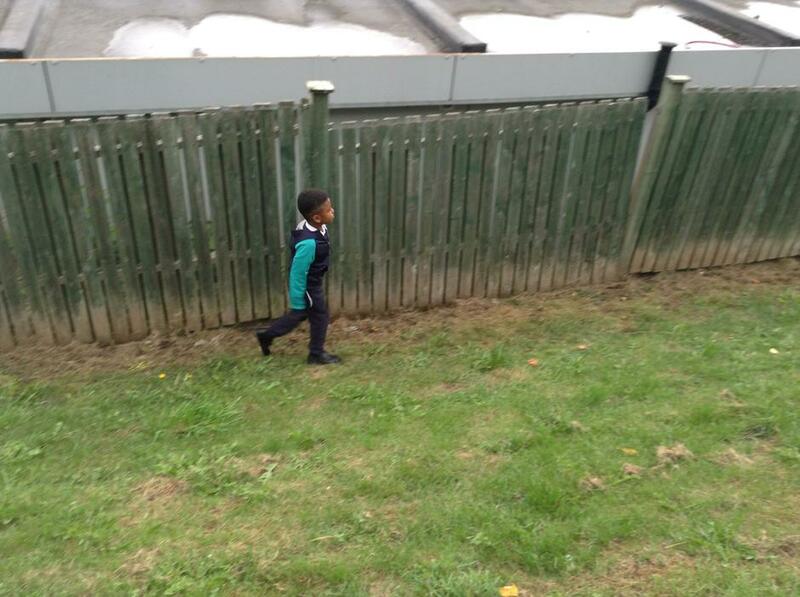 "Sometimes there's snow." 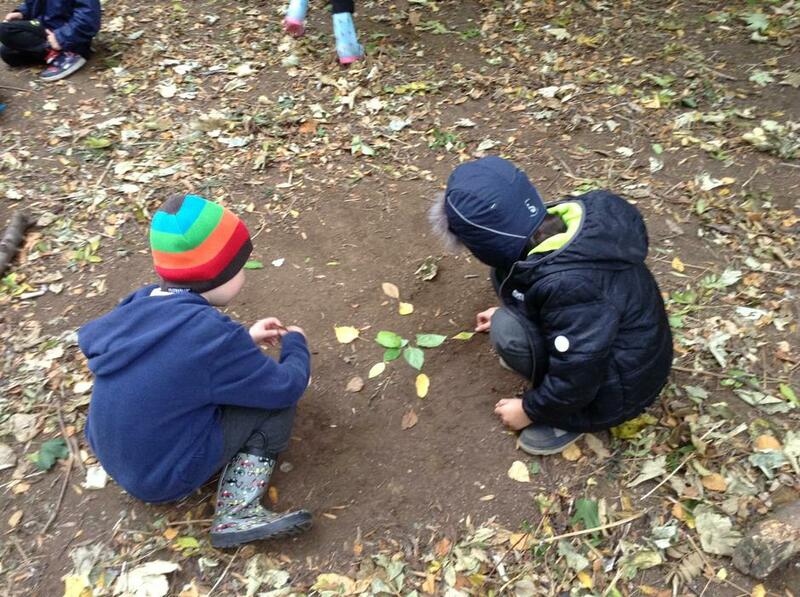 "Hedgehogs hibernate." 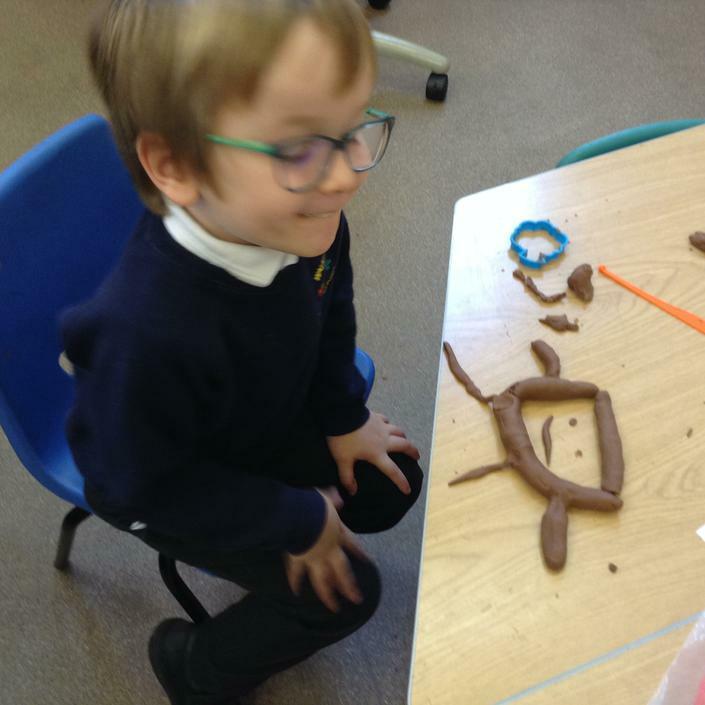 After seeing a trailer for Meadowhall's Gruffalo experience from two years ago, the children decided we would create our own Smartest Giant in Town show. 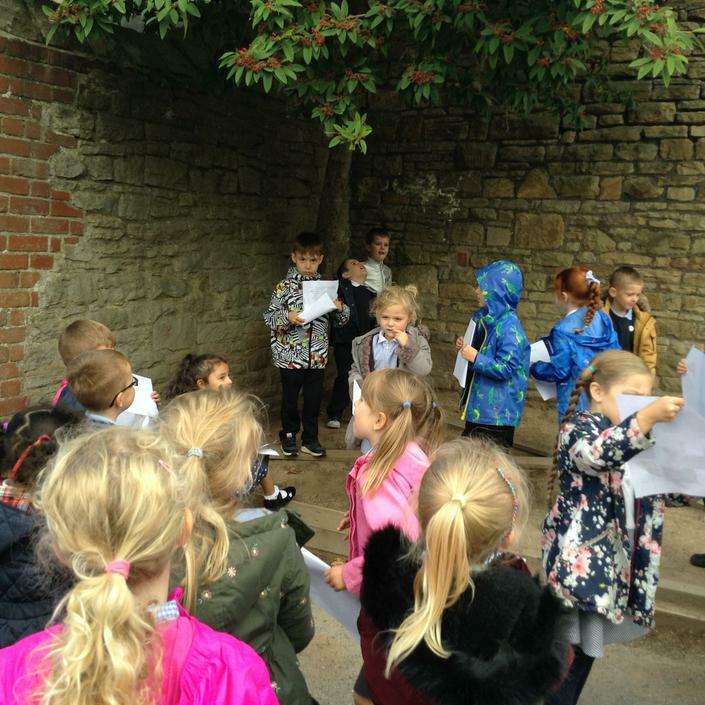 We have planned a list of jobs that we need to complete in order to run a successful show. 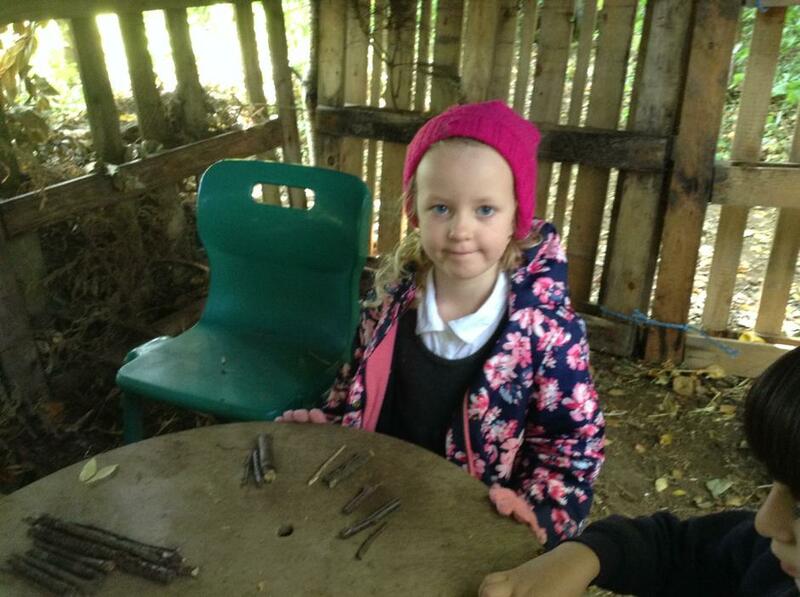 One of the first jobs was to make lots of crowns for our audience to wear during the show. 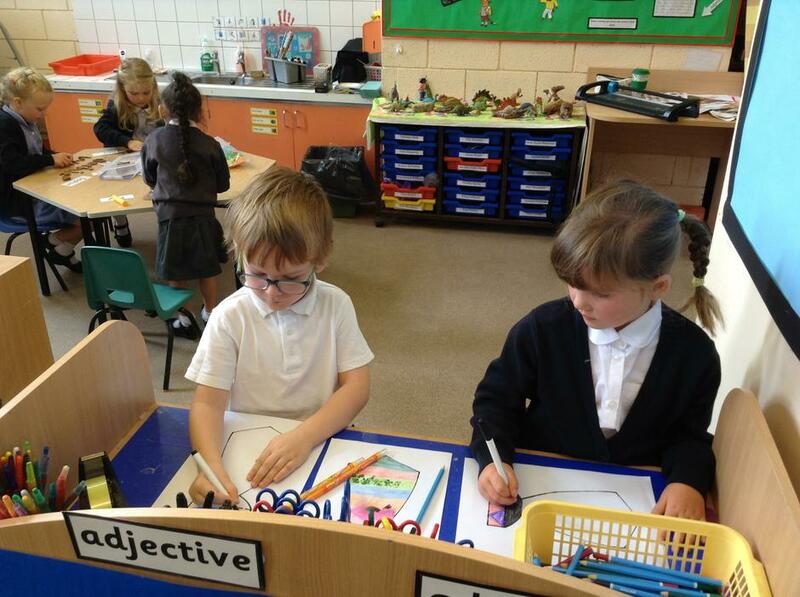 In the Giants we have started our guided reading cycle. 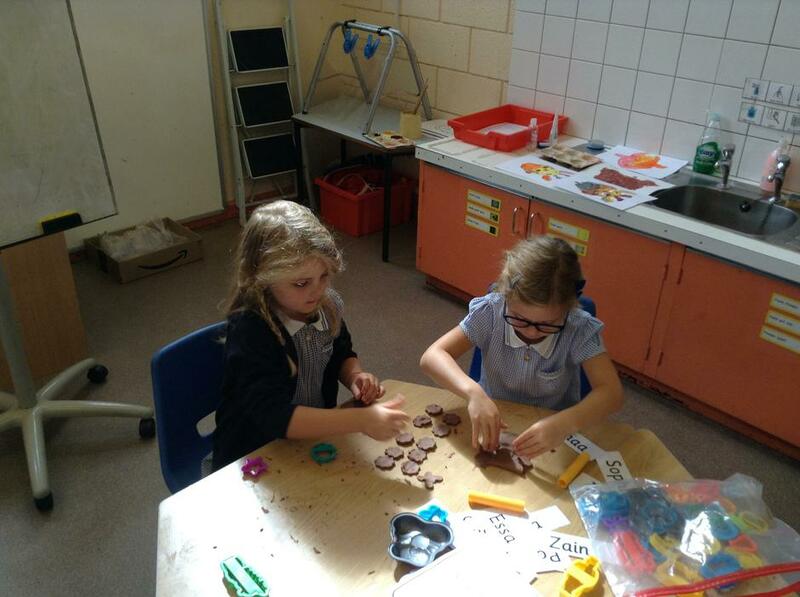 Usually year ones won't begin this until after Christmas, but the attitude to learning in KS1 is so positive that we felt it was time to challenge the children and encourage independent learning. 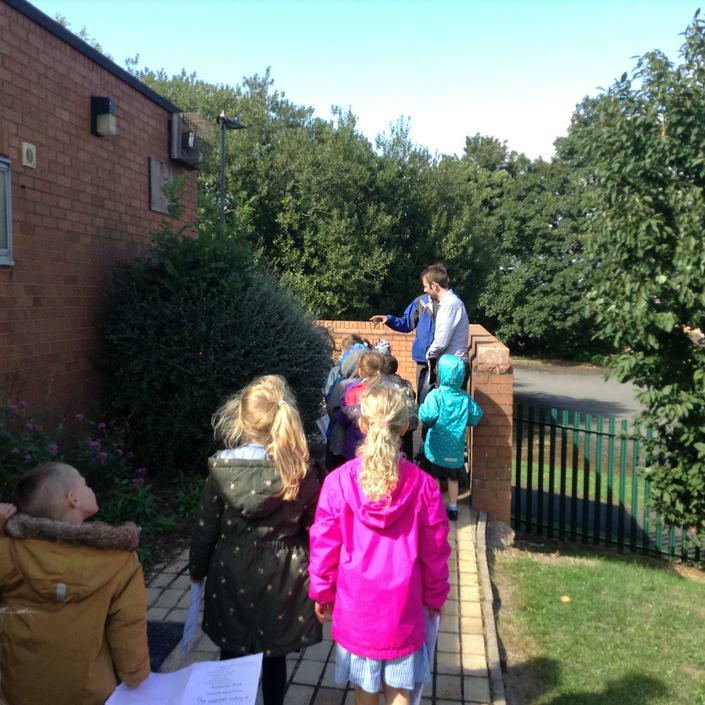 This week has also been momentous because the children have exercised their democratic rights and voted for the school council. 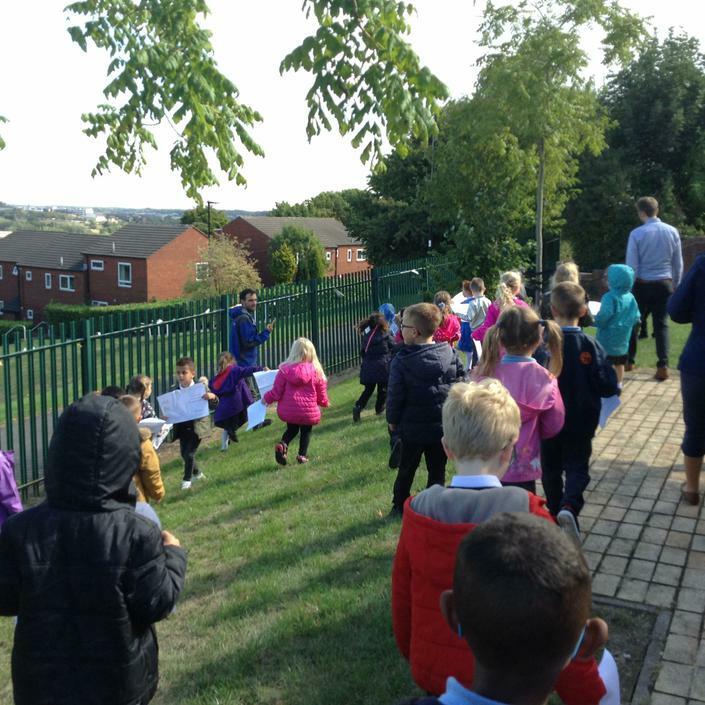 Not only have we voted for which year sixes are members of the main council, but we have also voted for our class representatives. 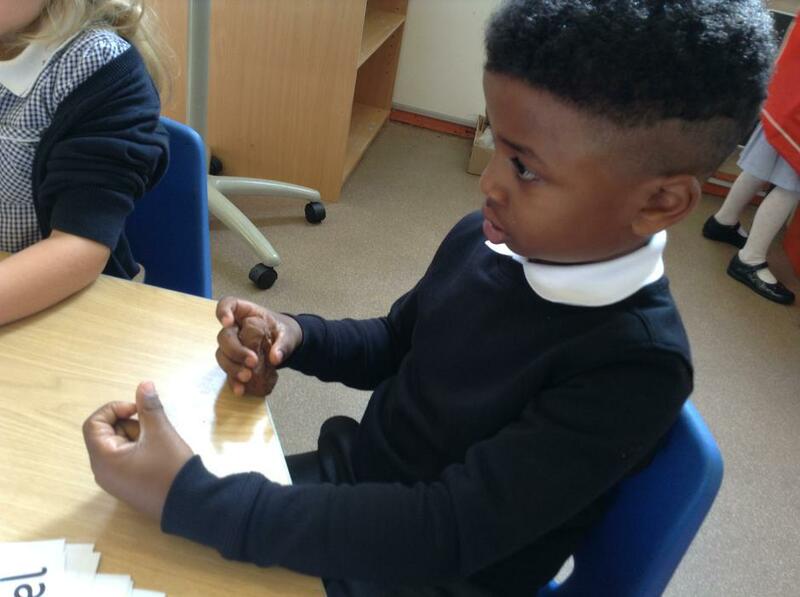 Congratulations to that boy and girl who will be working hard to represent us and bringing us back news from their very important meetings. 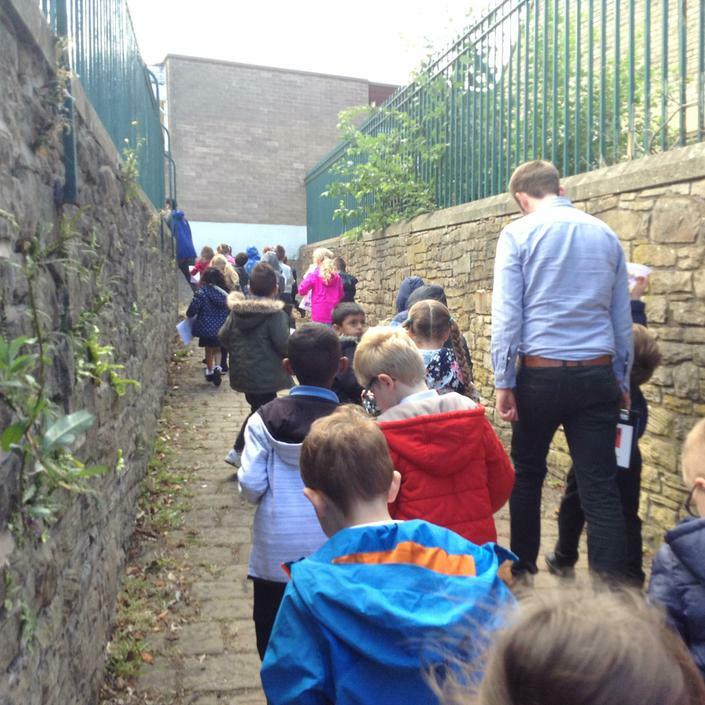 First we waited for our chance to vote. 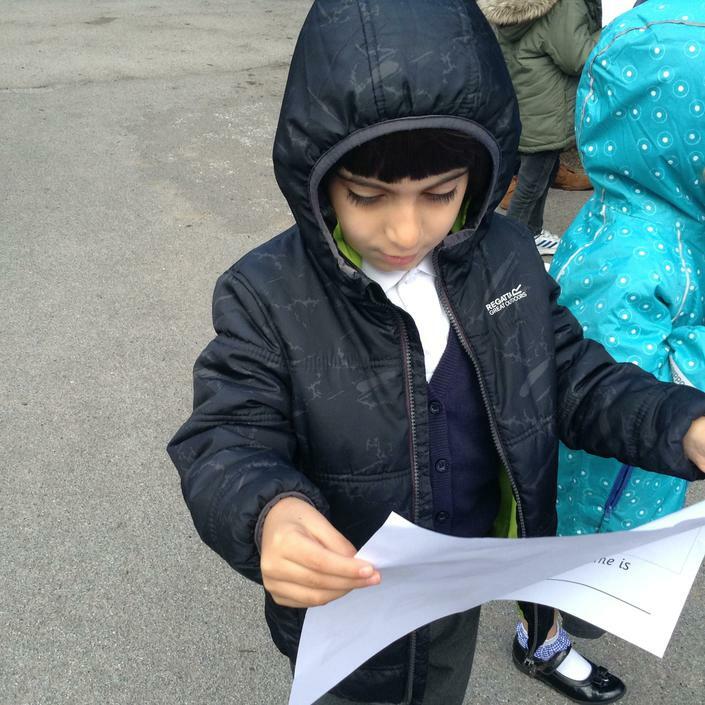 Then we received our voting slips (or voting blocks). 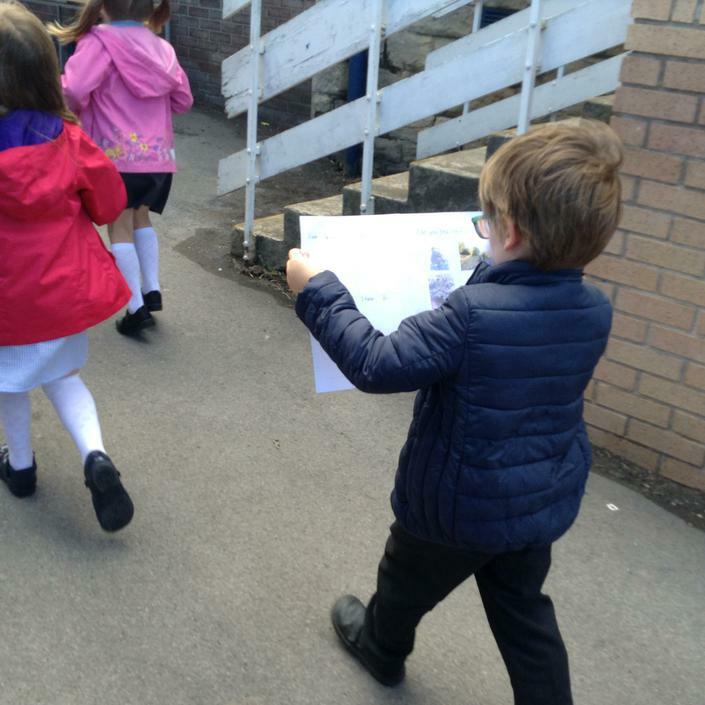 Finally we followed the footsteps and with the help of the special voting assistants, we put the blocks in the baskets of our preferred candidates. 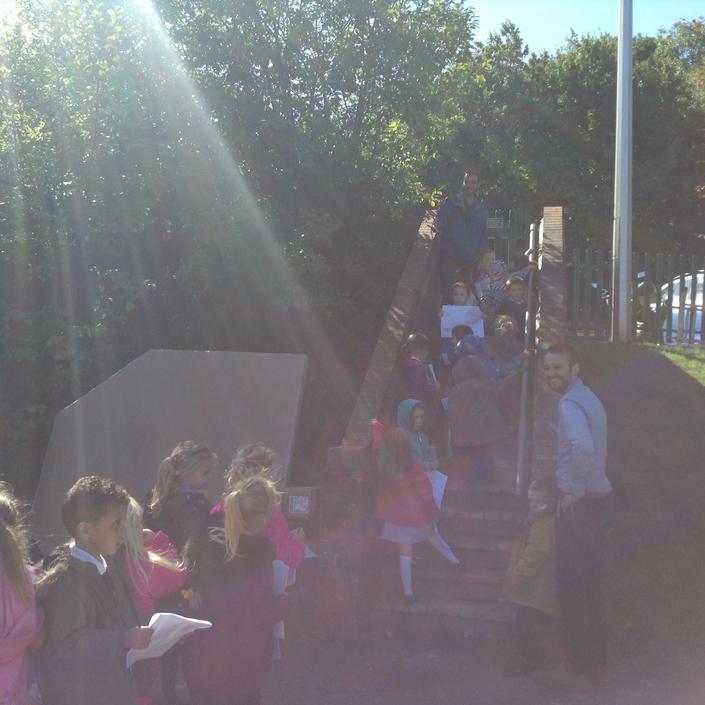 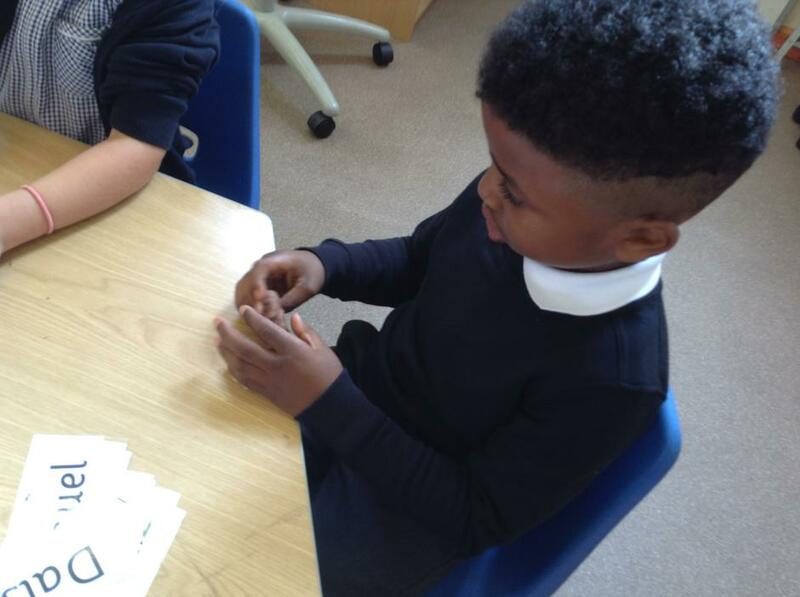 On Fridays, in order for me to plan our lessons for the week ahead, Mr Murphy teaches the children in the afternoon. 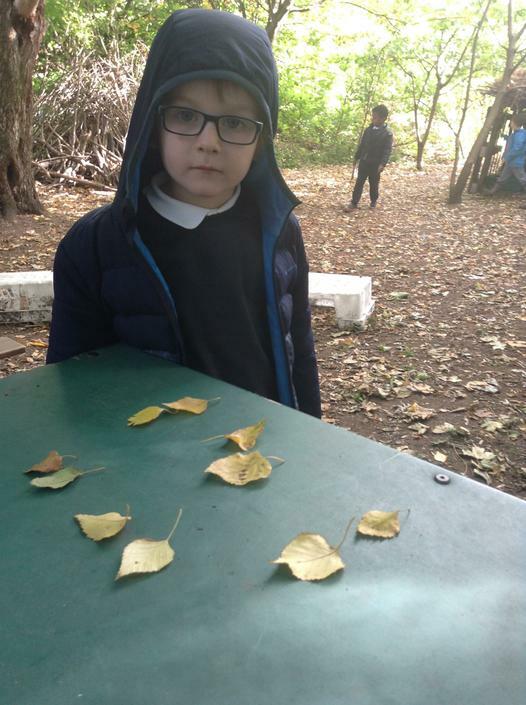 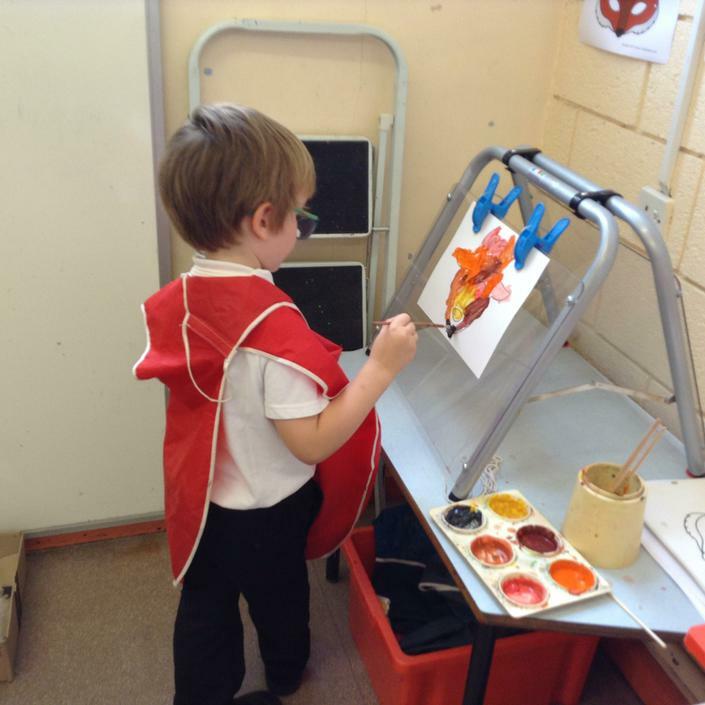 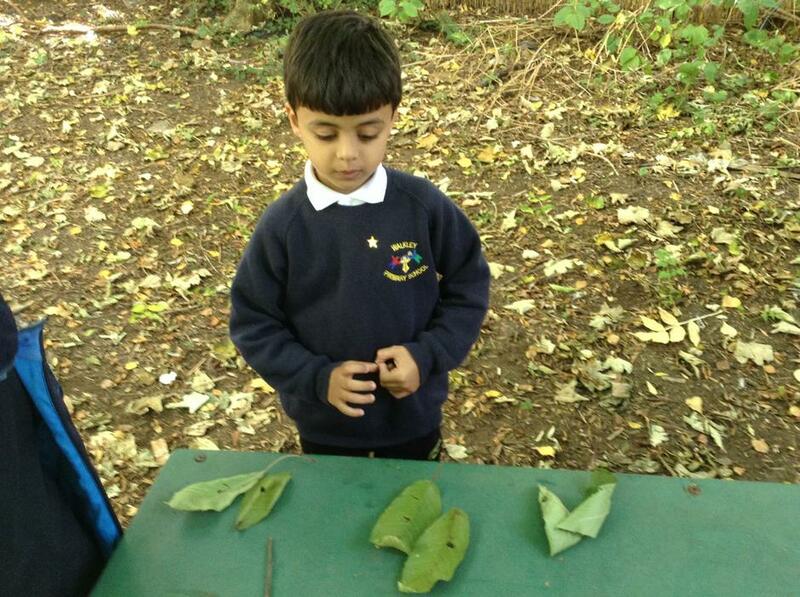 He has been focussing on science and specifically the topic of the seasons. 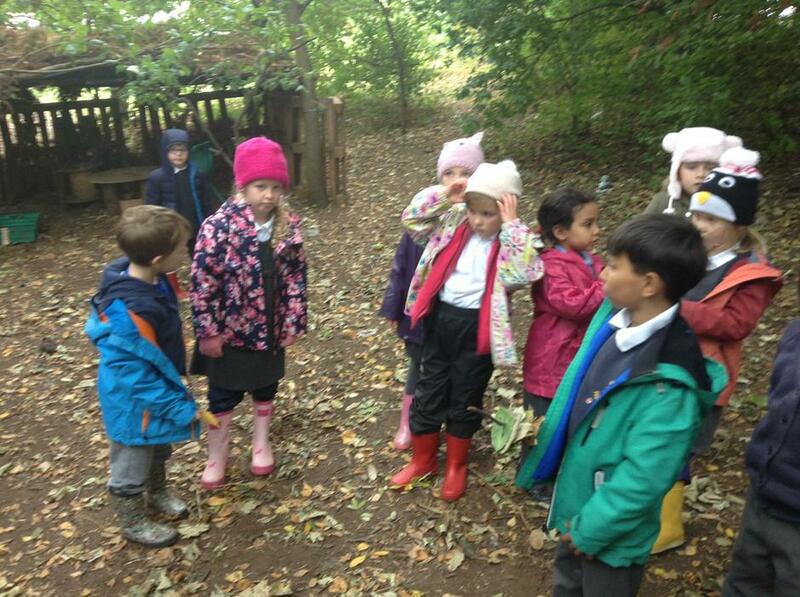 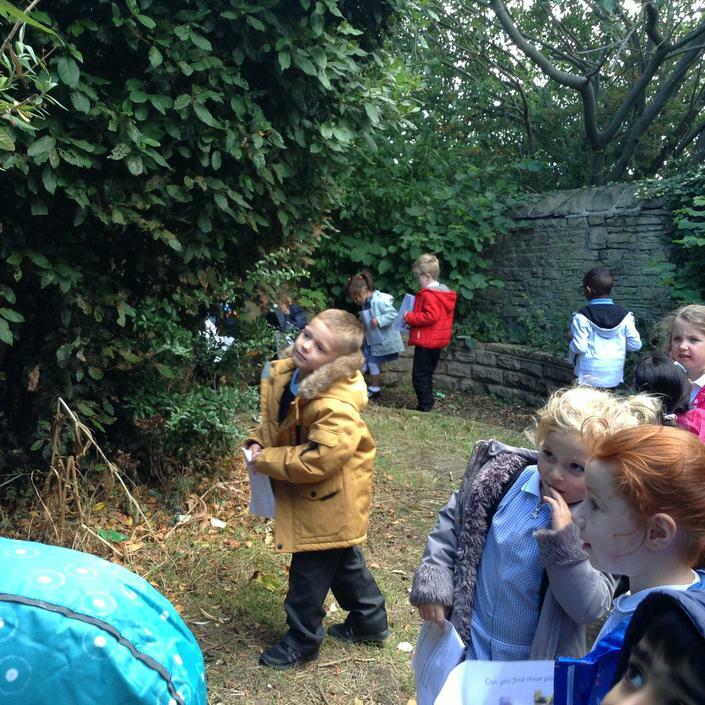 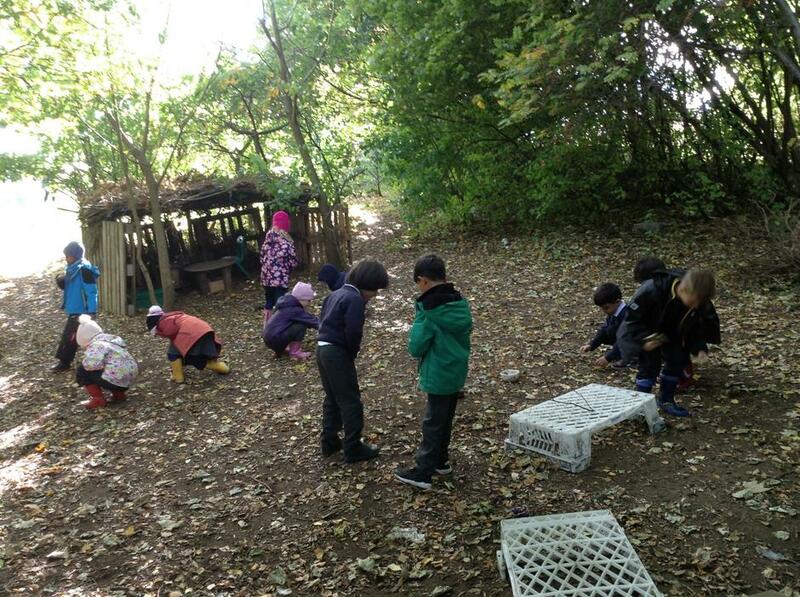 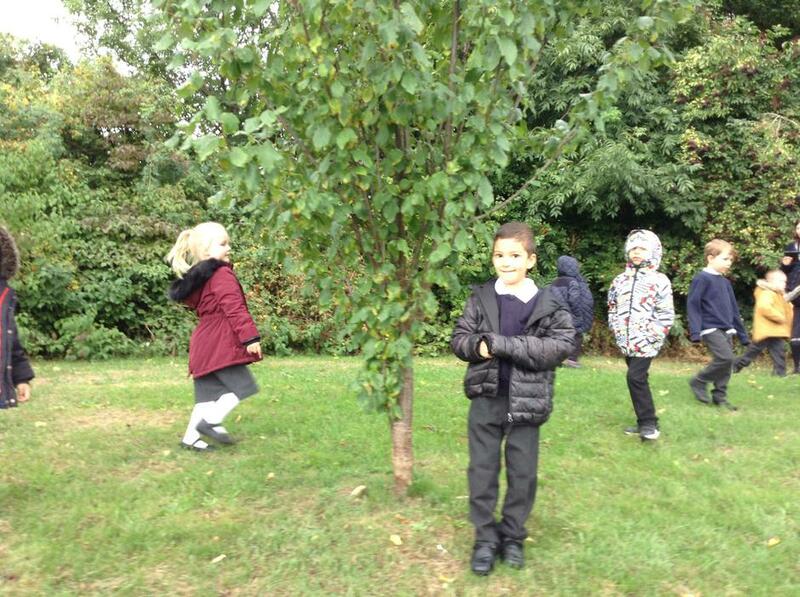 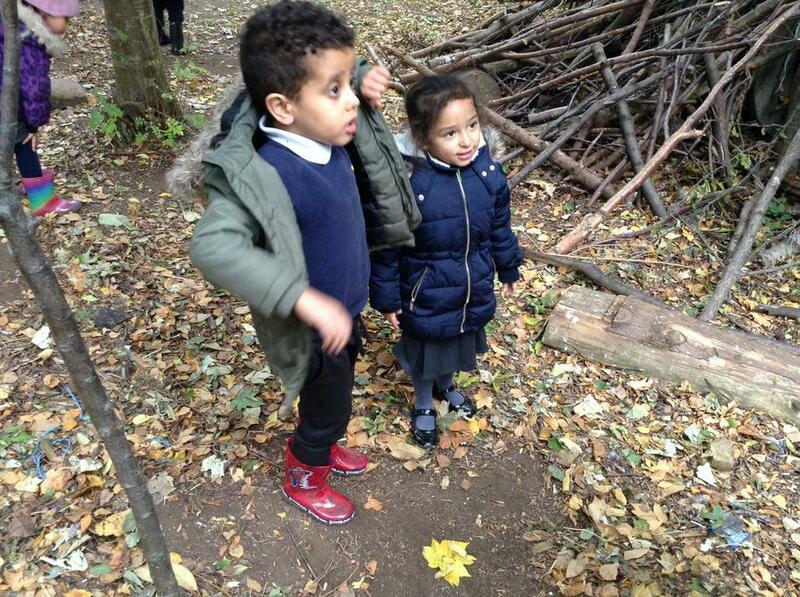 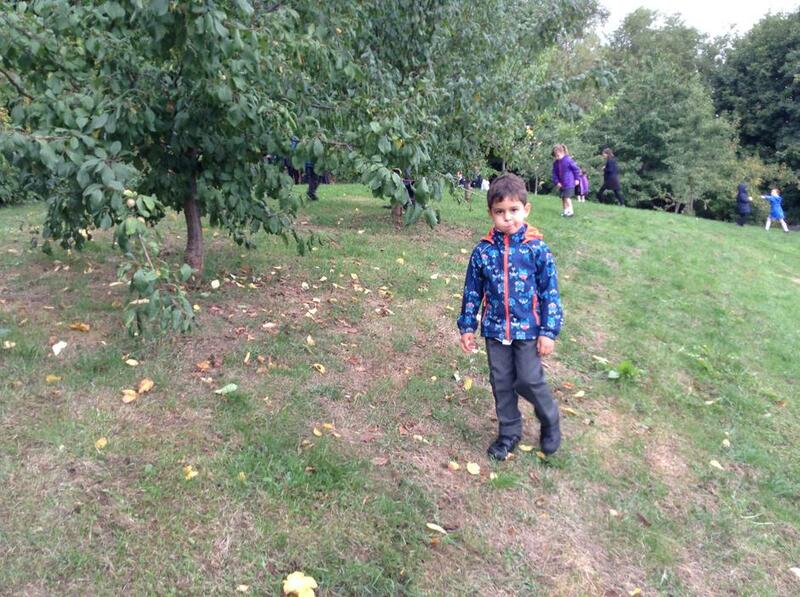 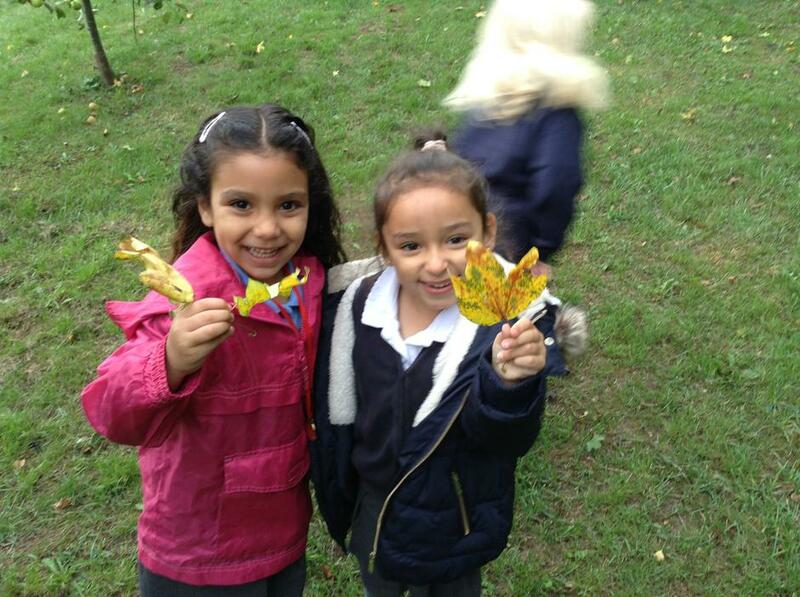 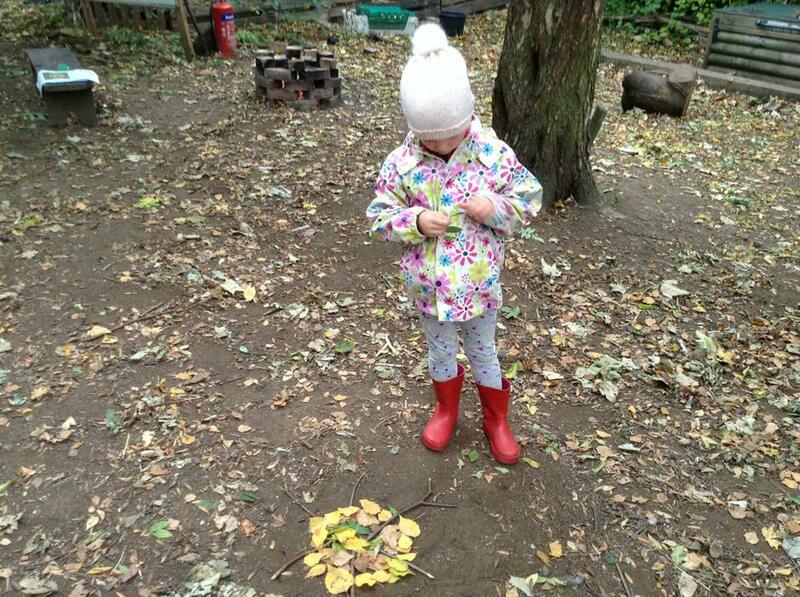 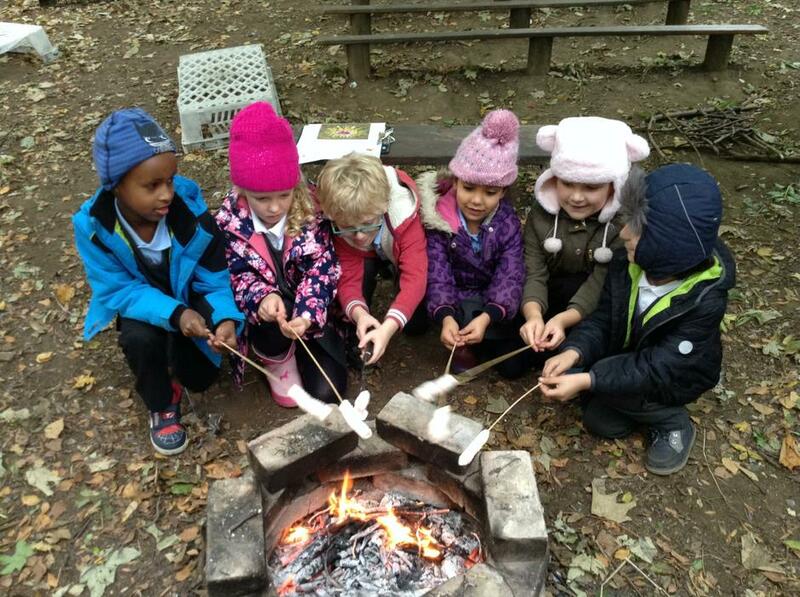 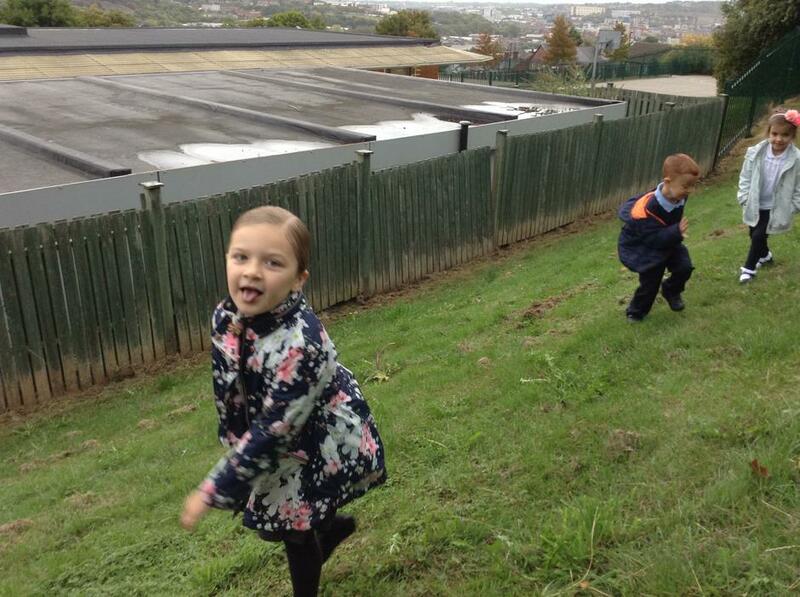 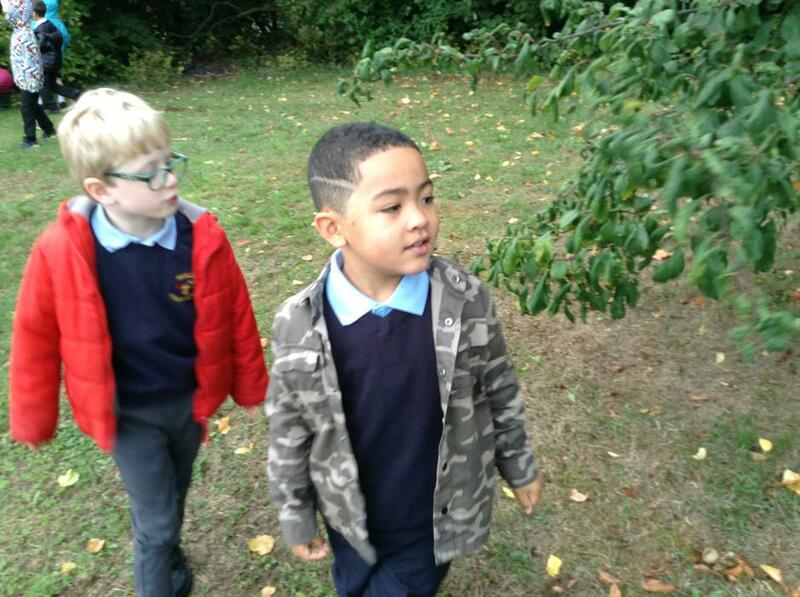 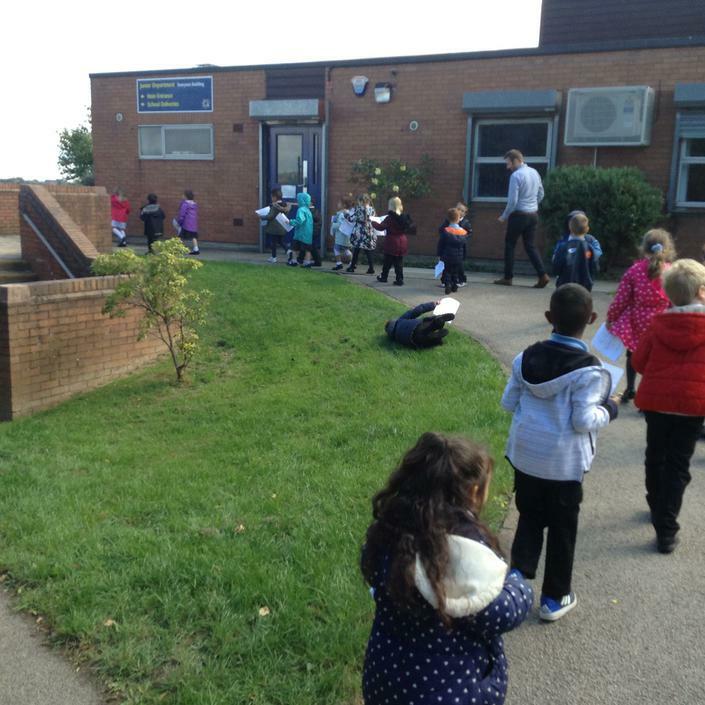 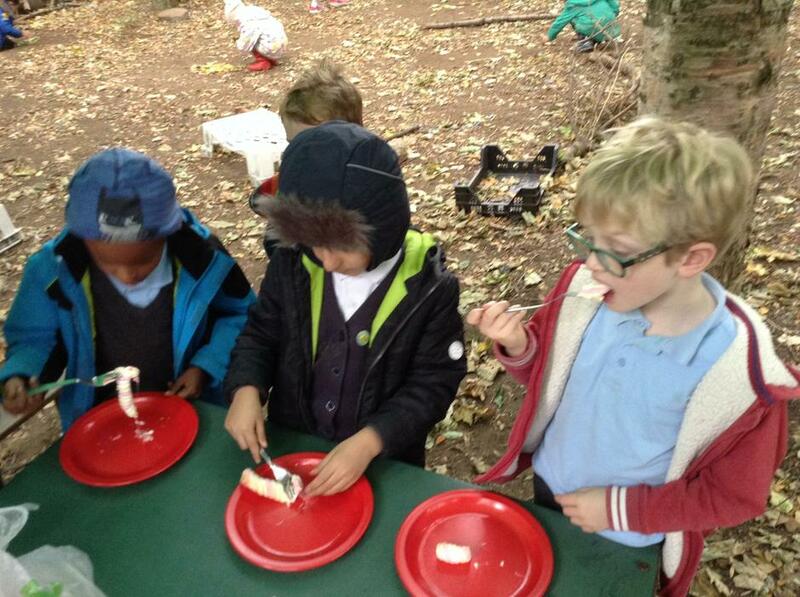 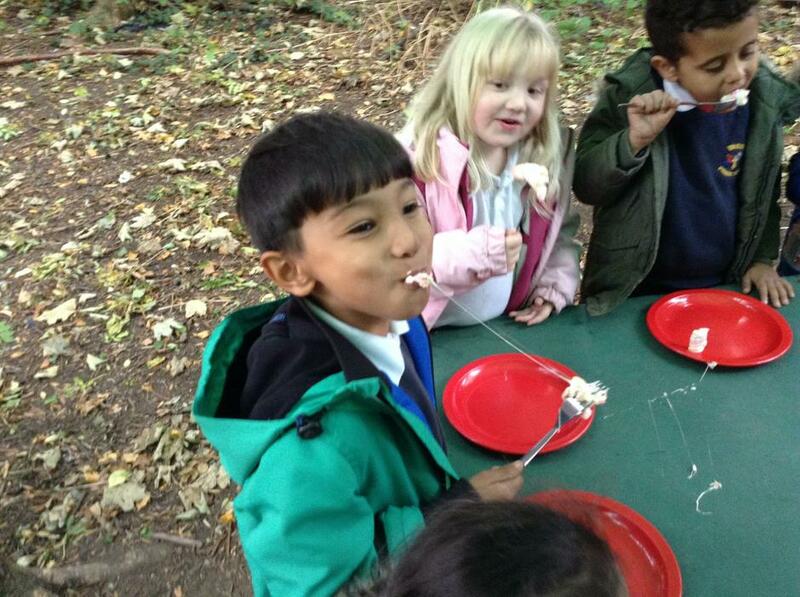 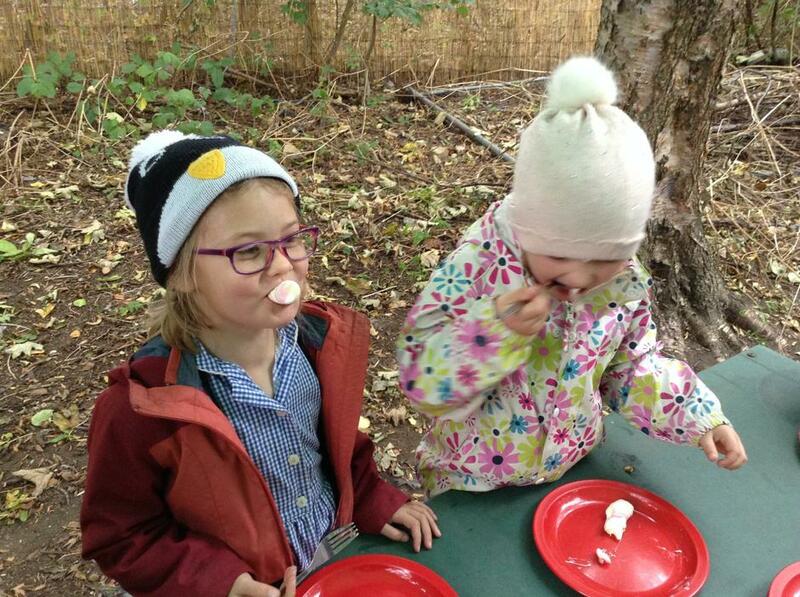 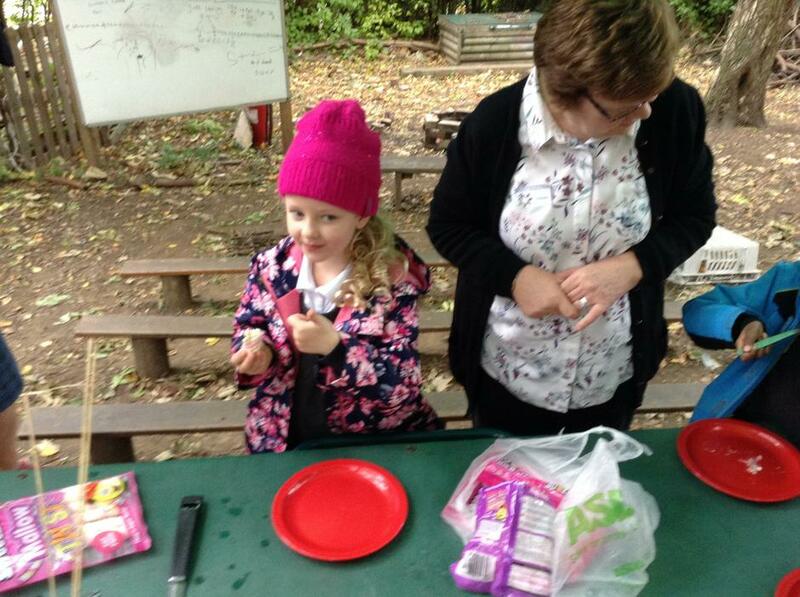 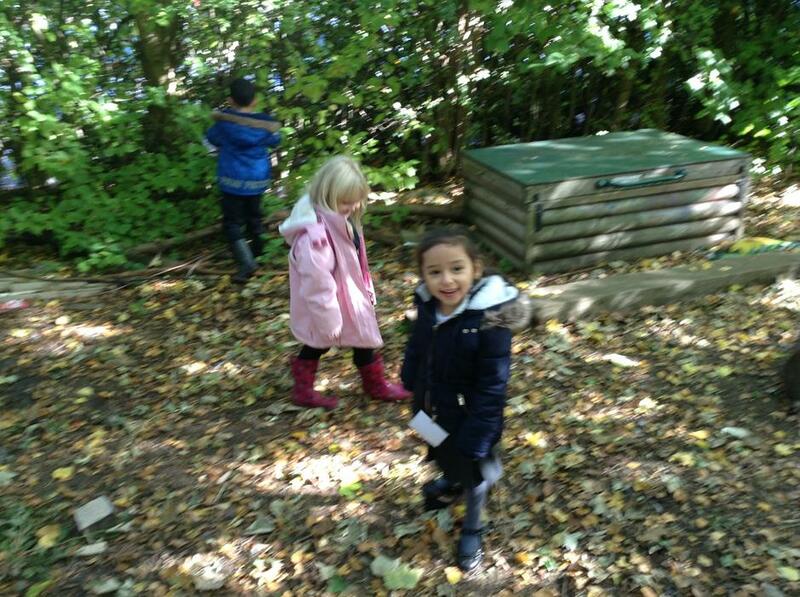 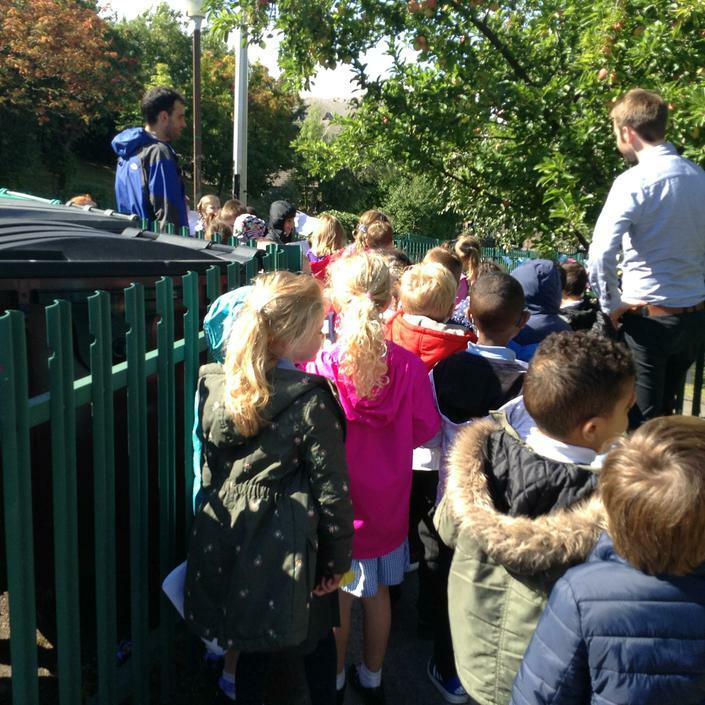 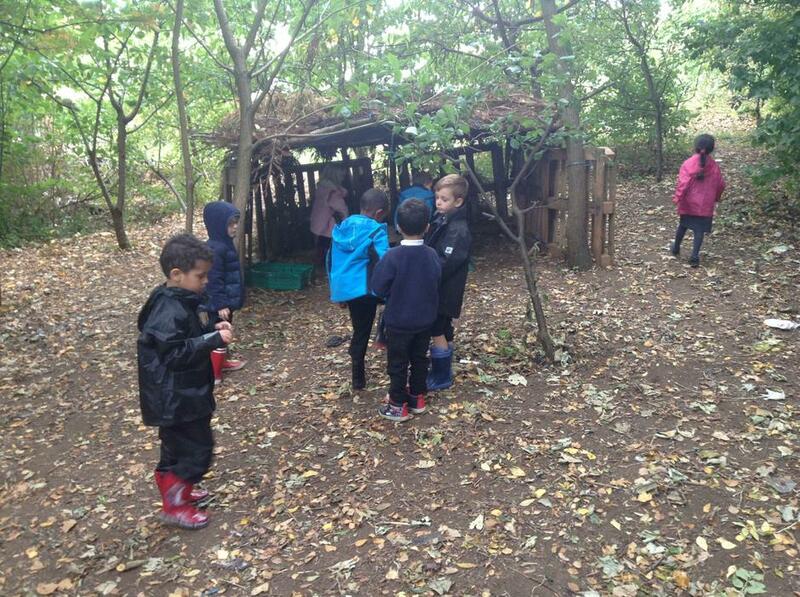 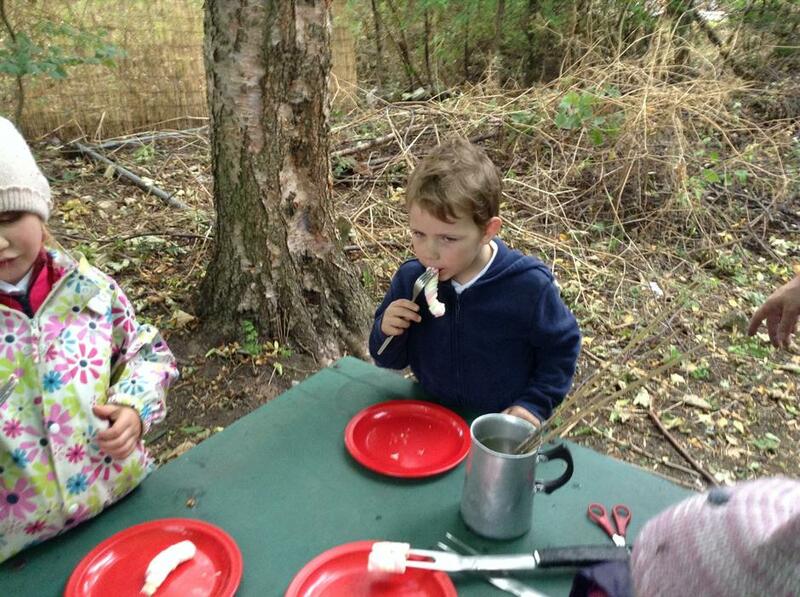 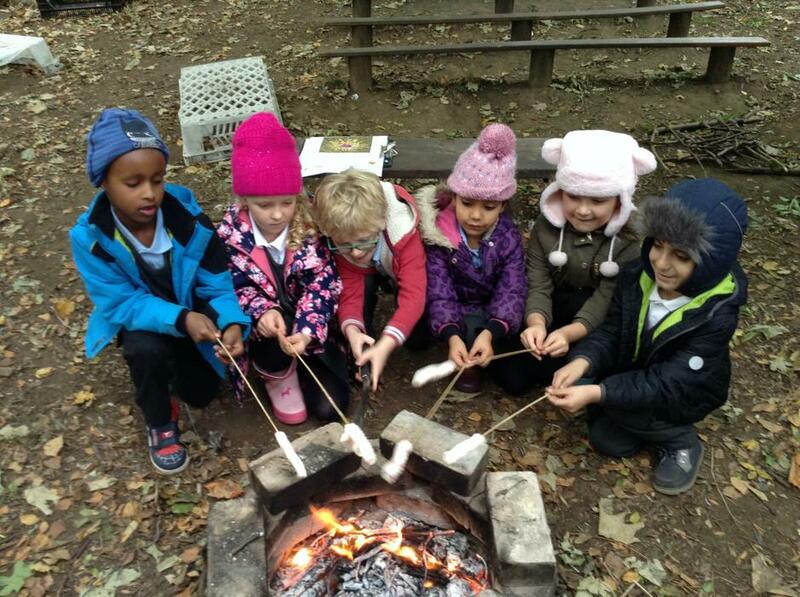 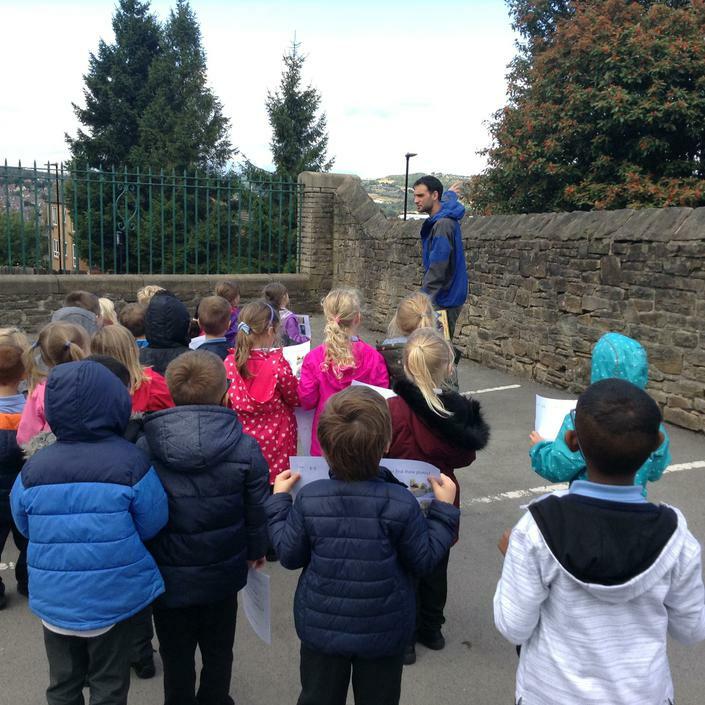 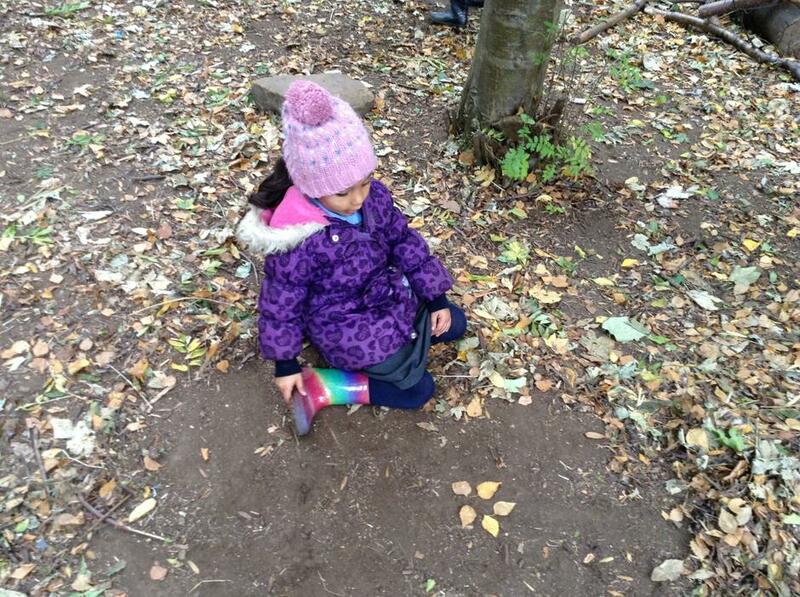 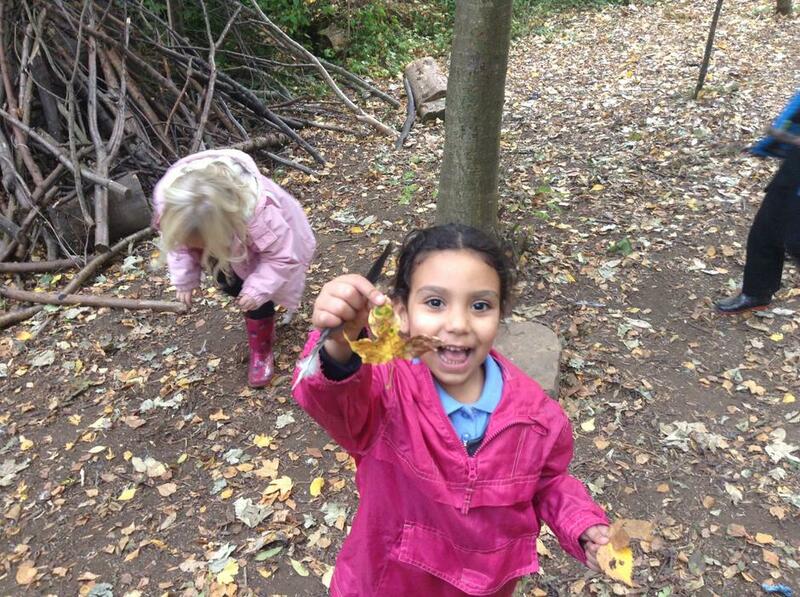 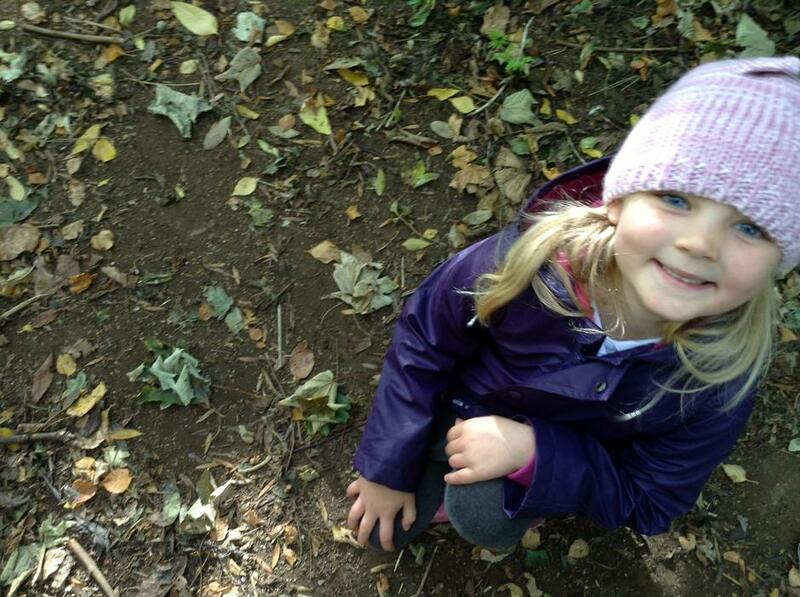 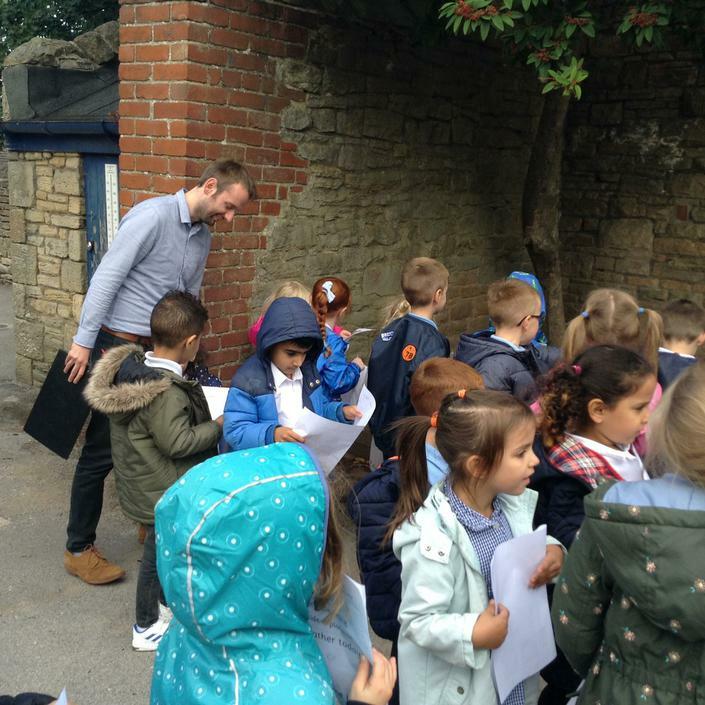 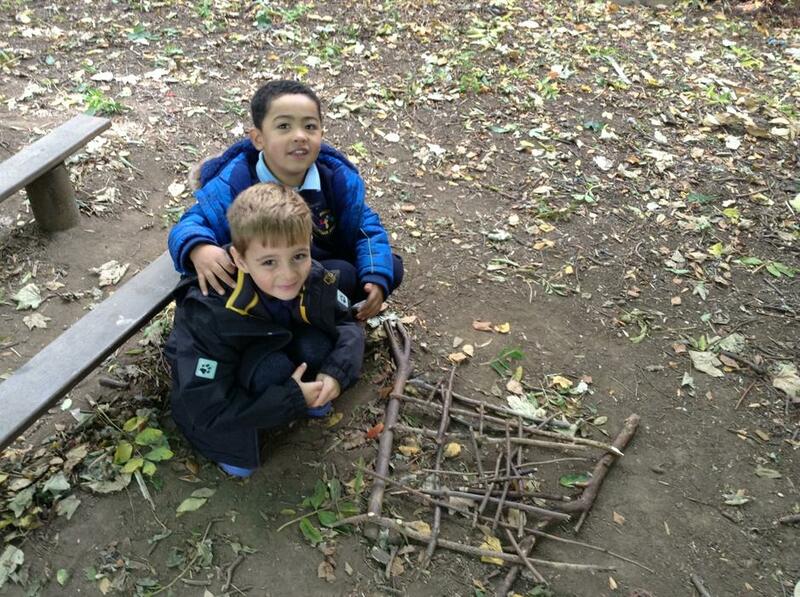 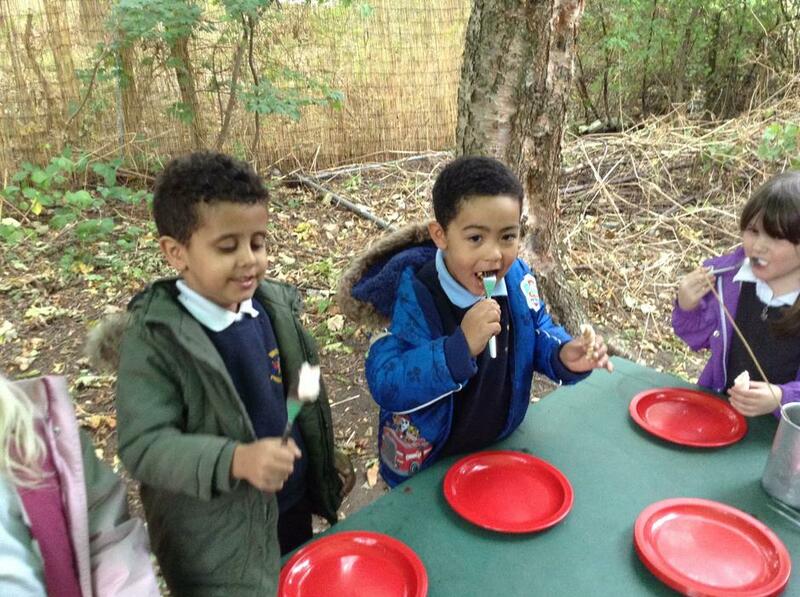 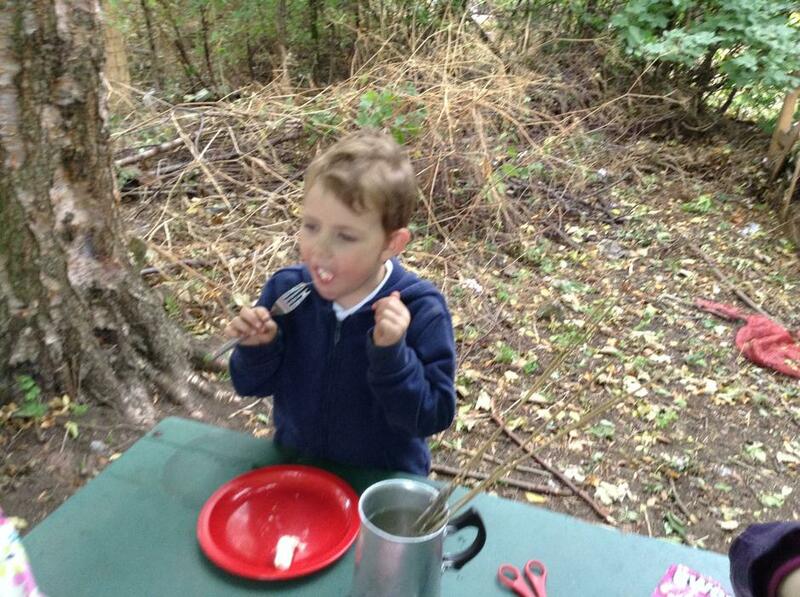 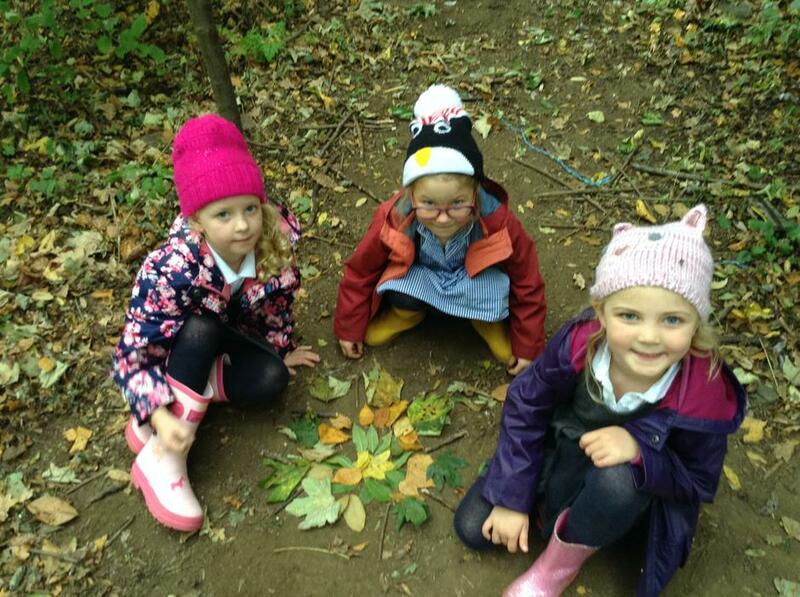 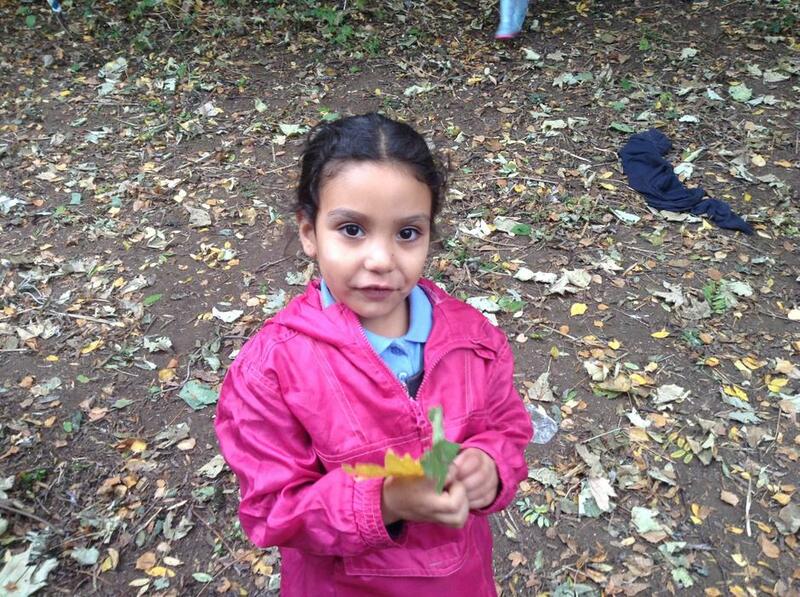 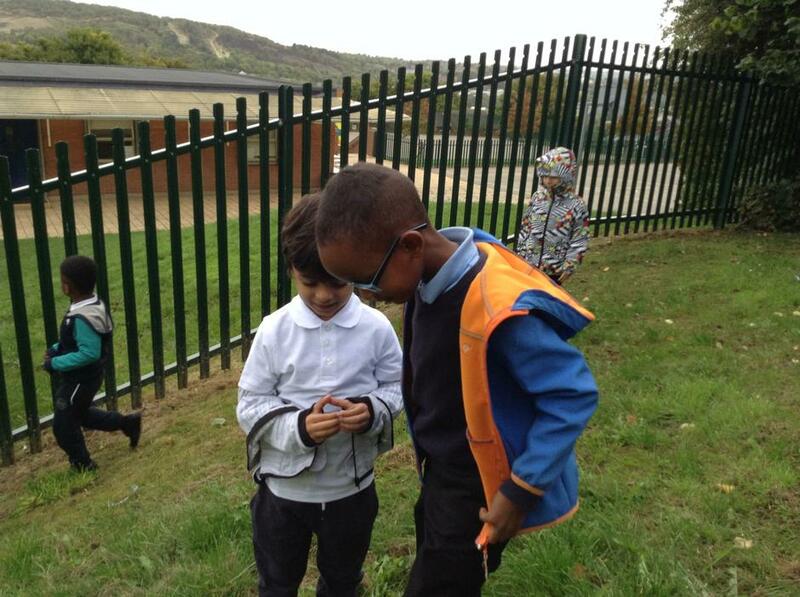 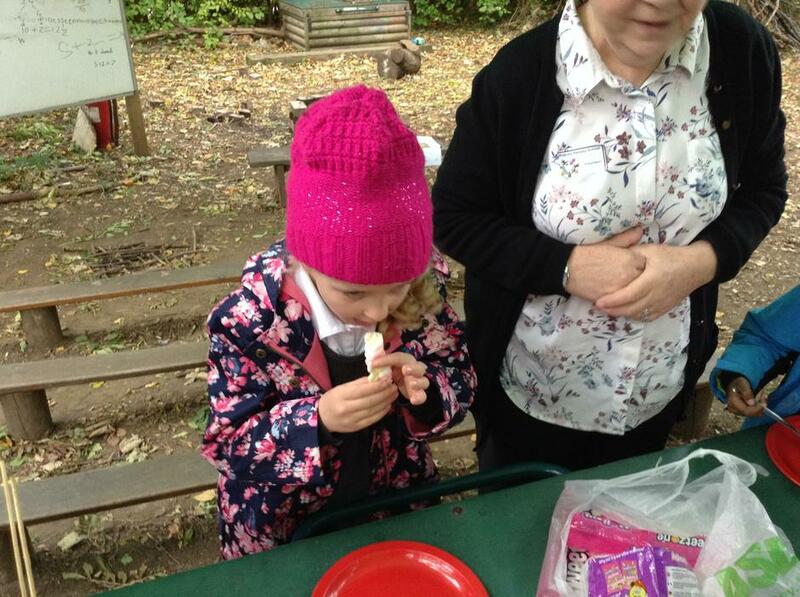 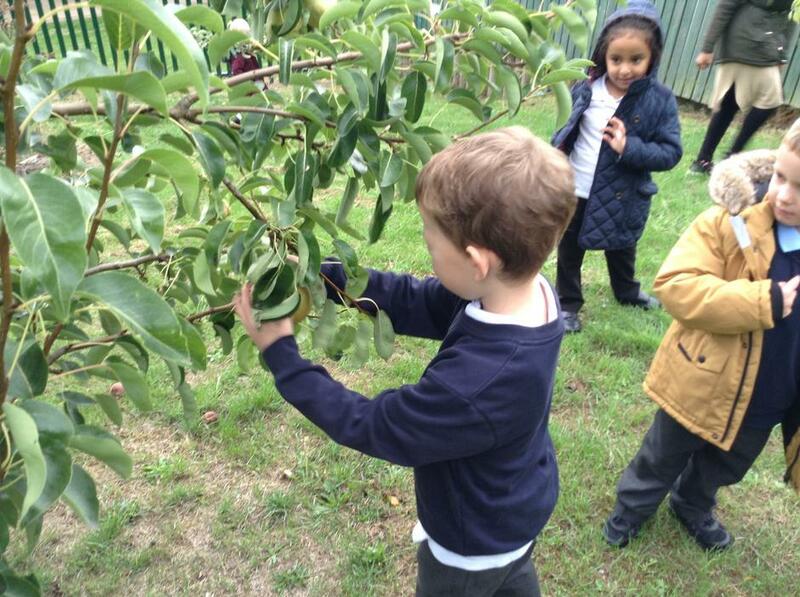 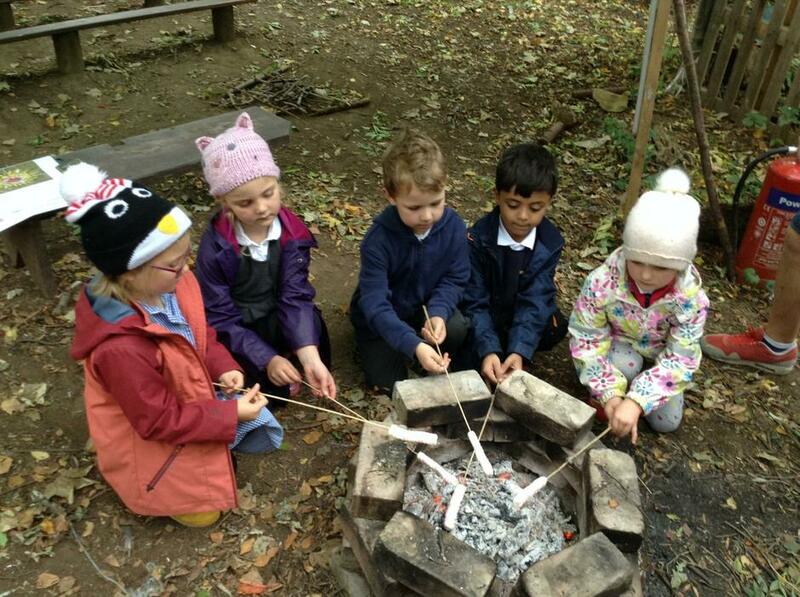 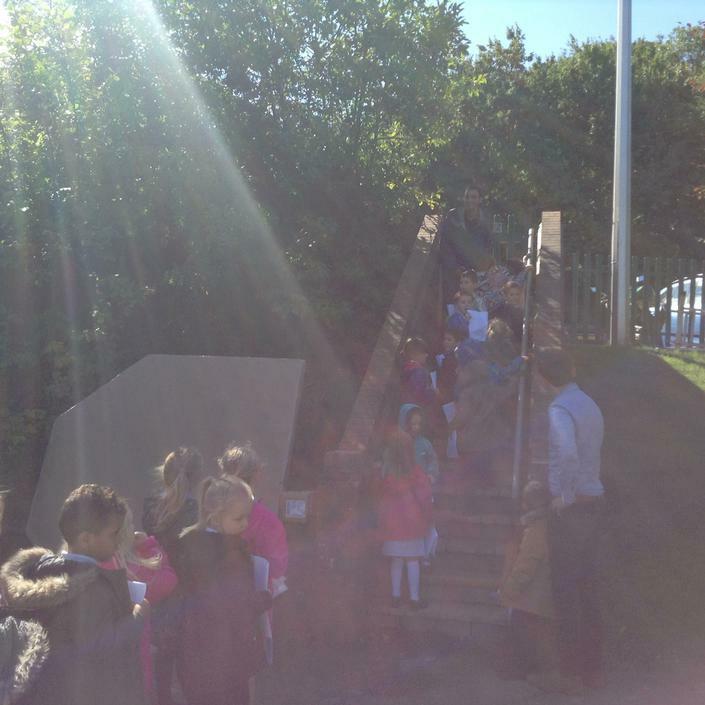 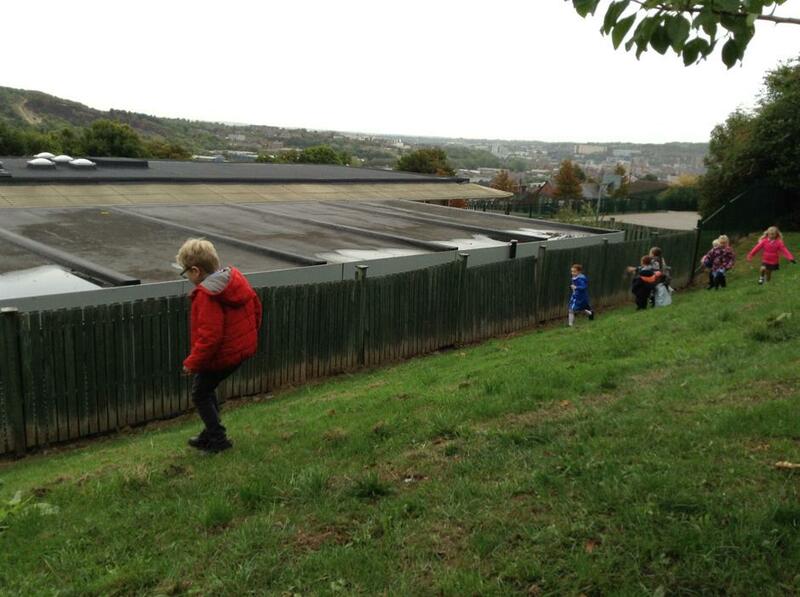 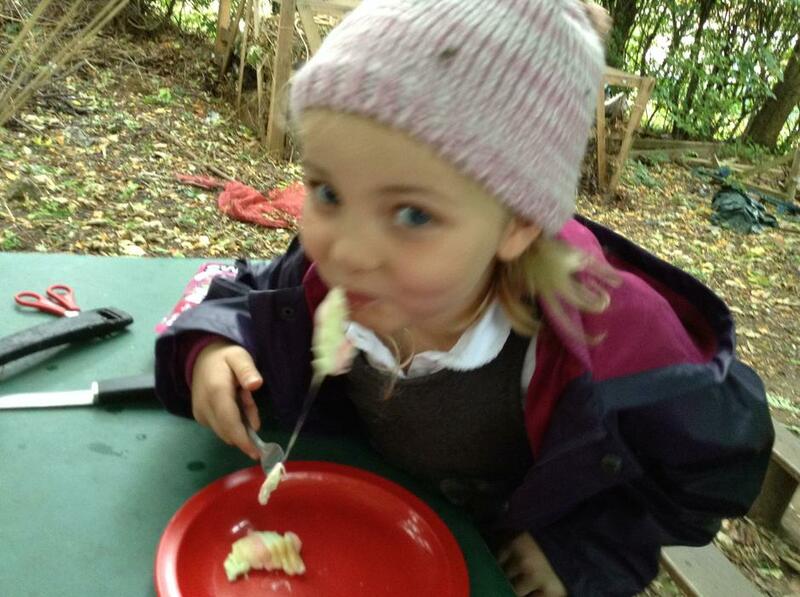 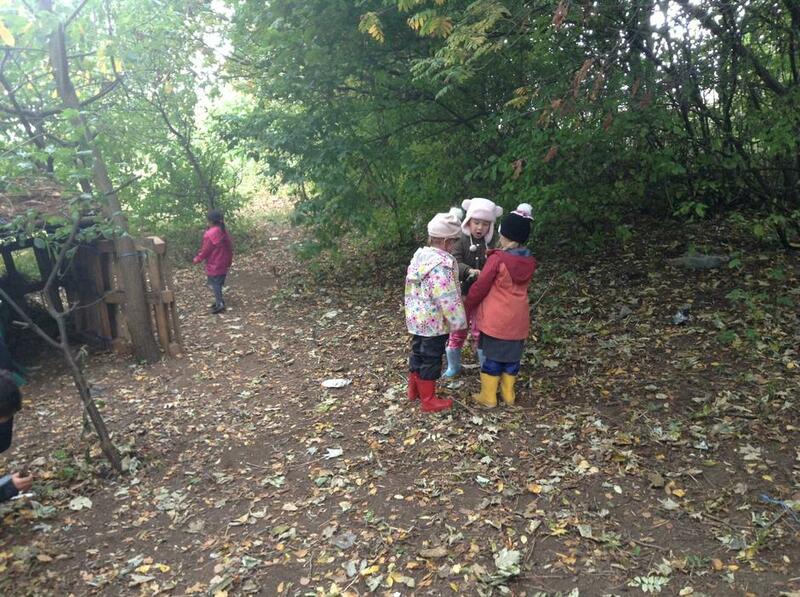 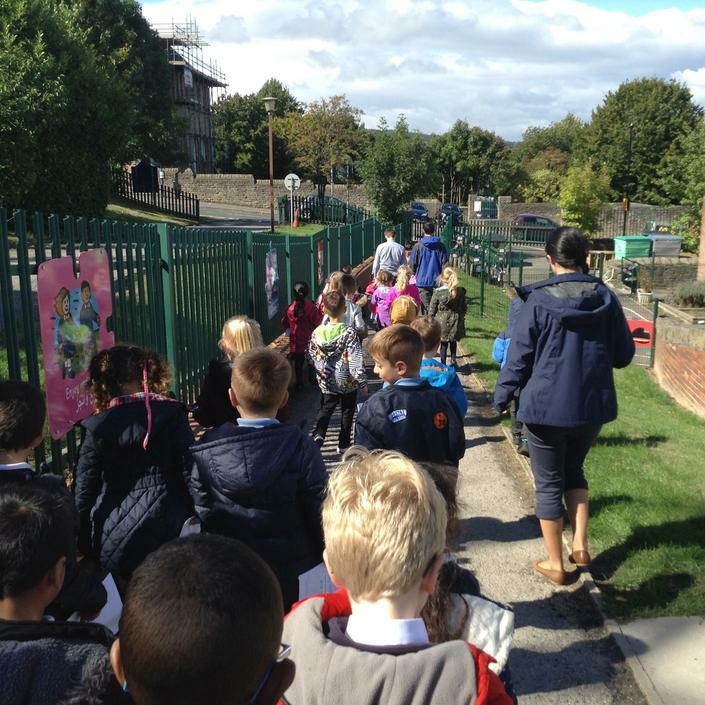 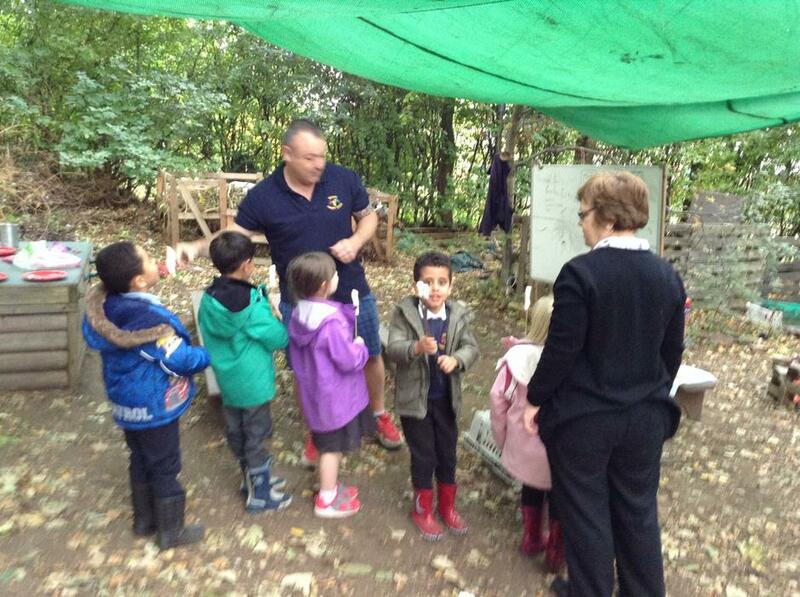 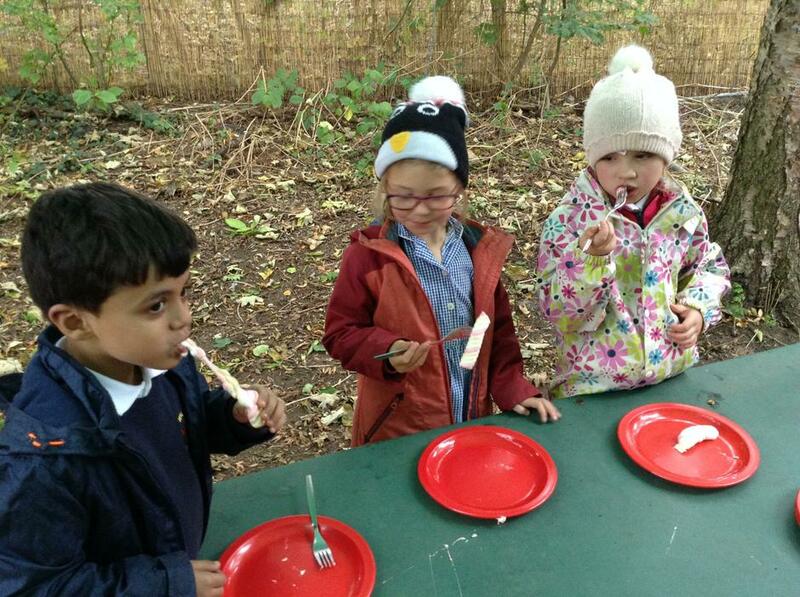 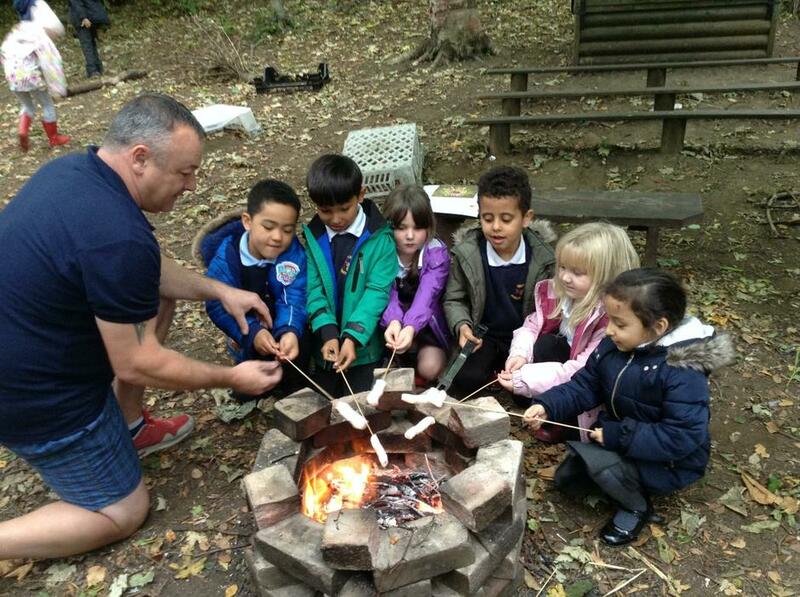 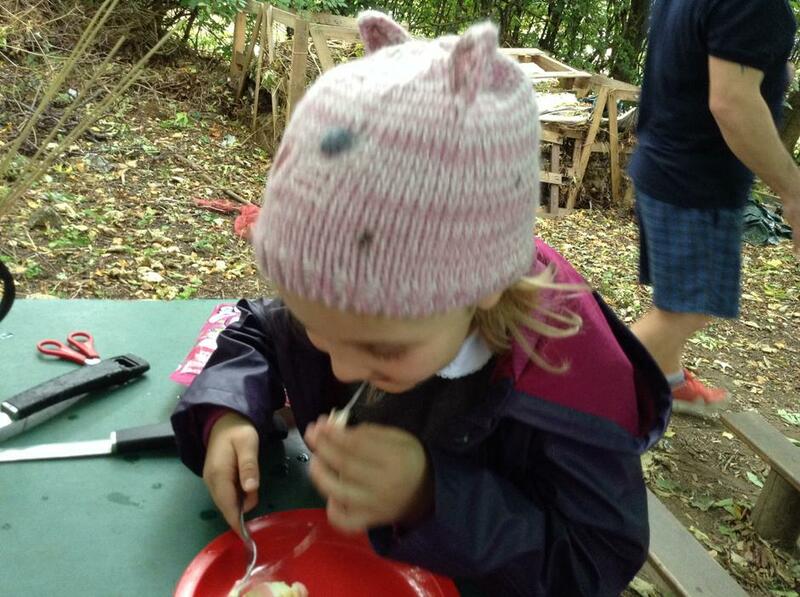 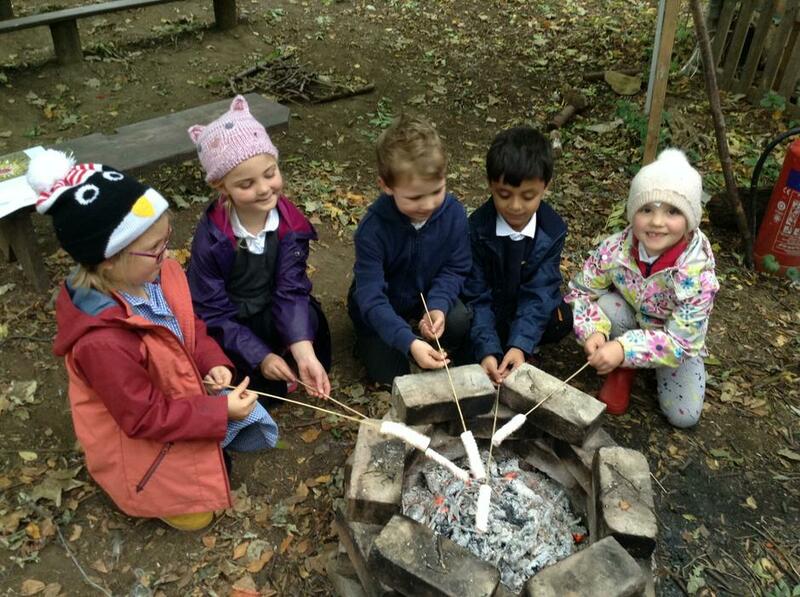 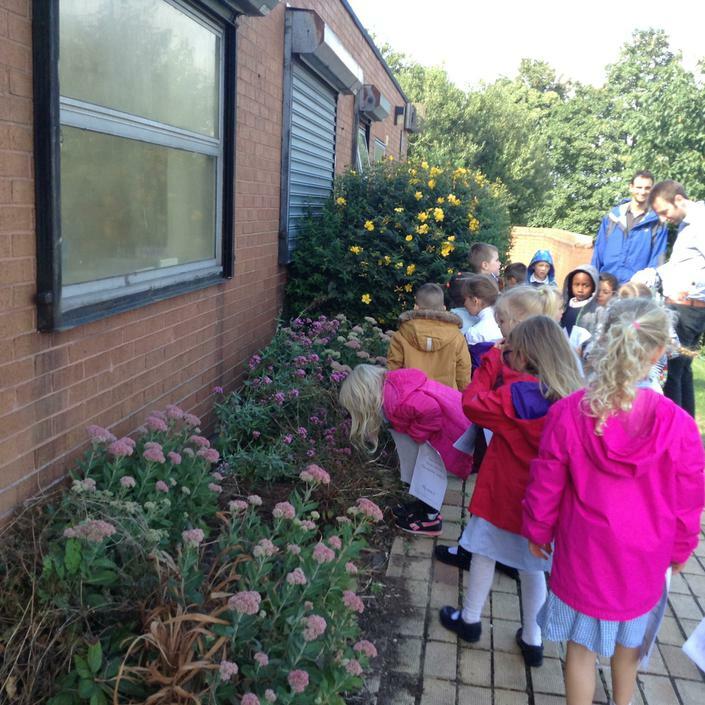 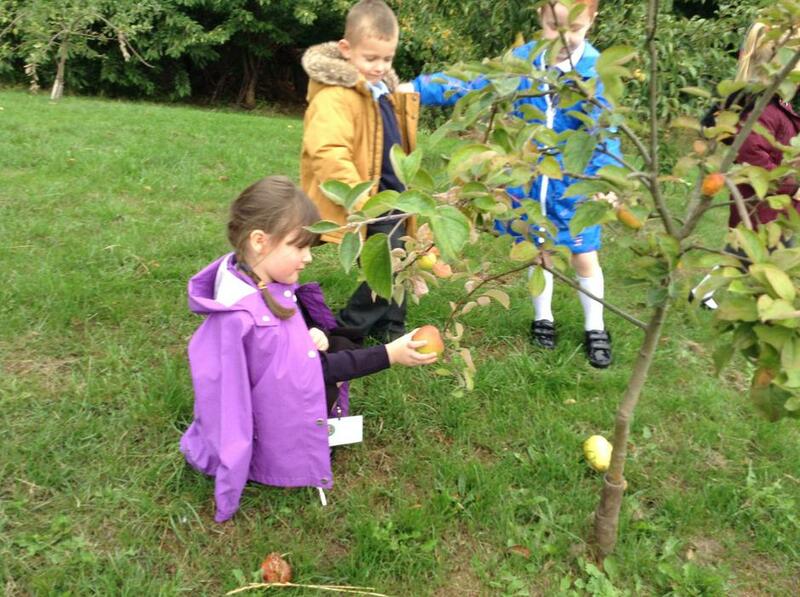 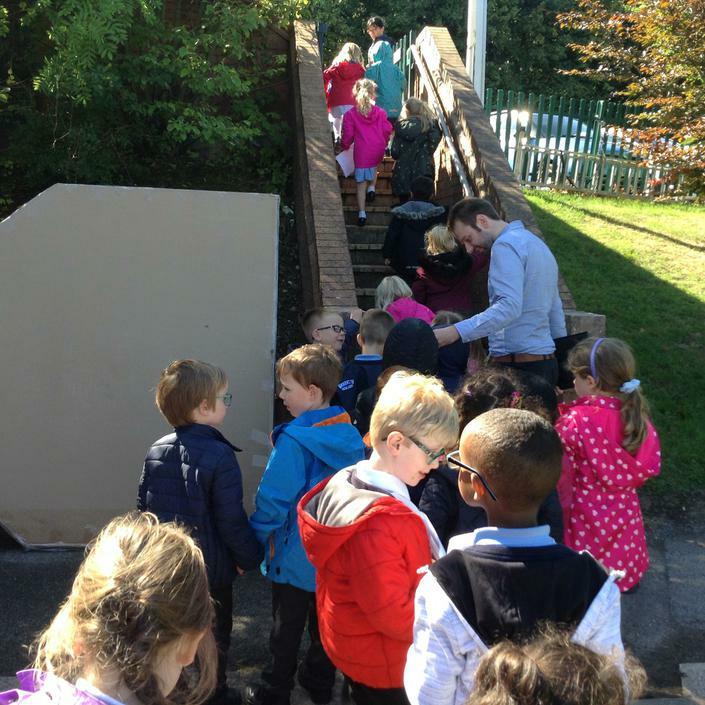 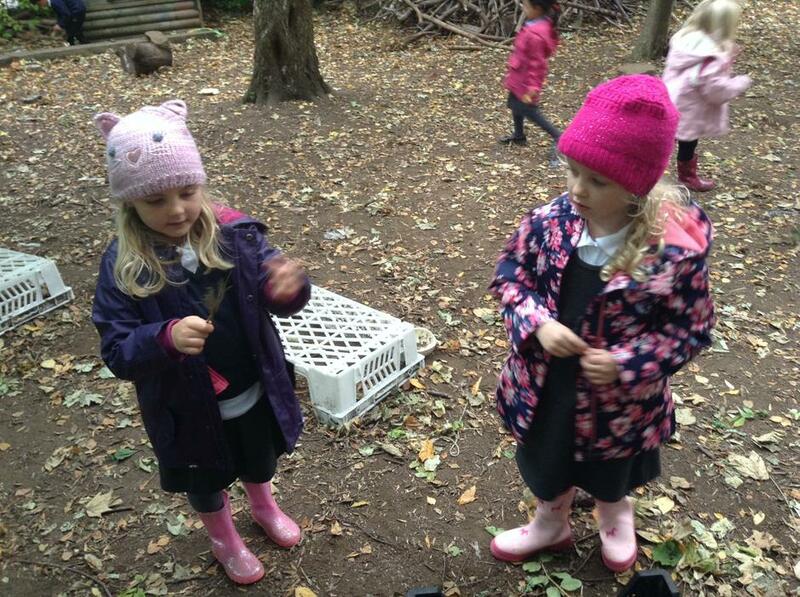 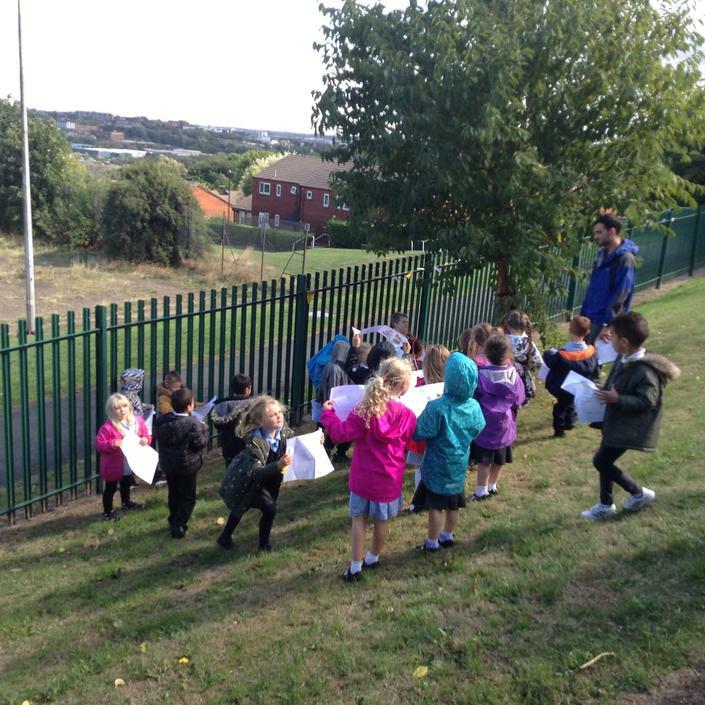 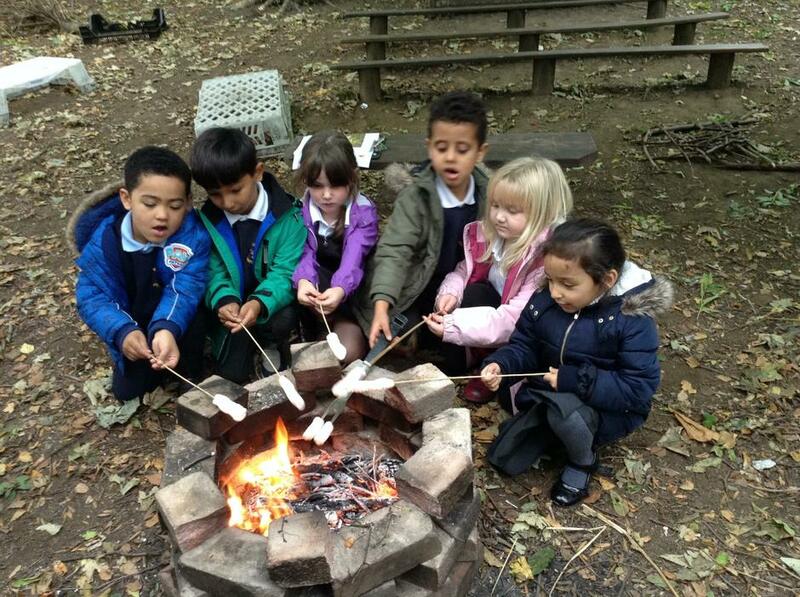 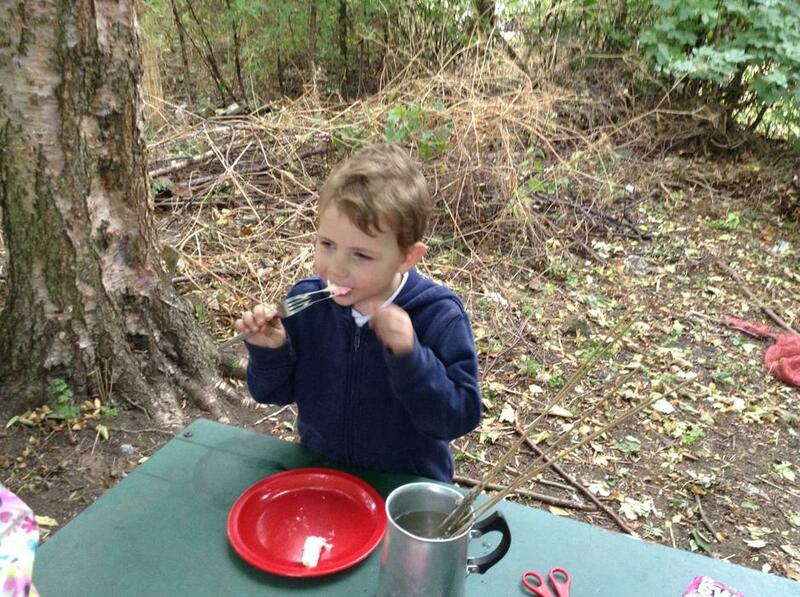 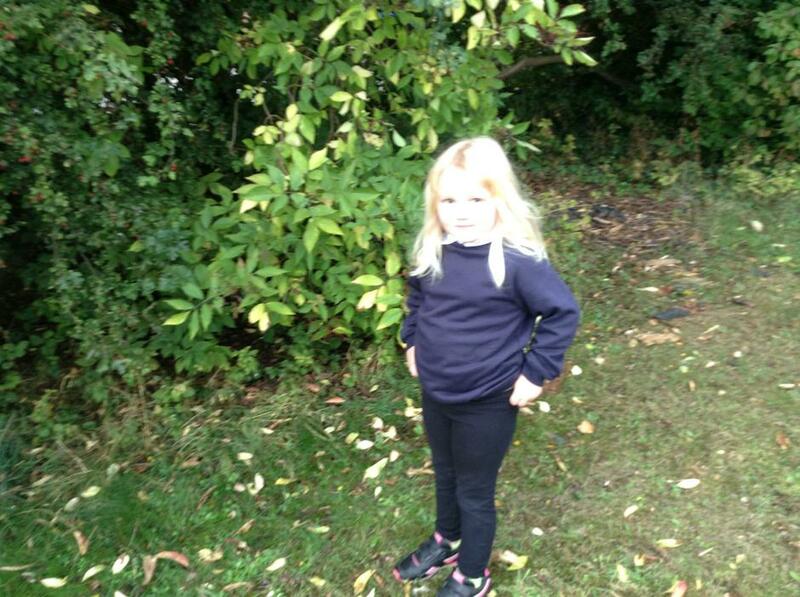 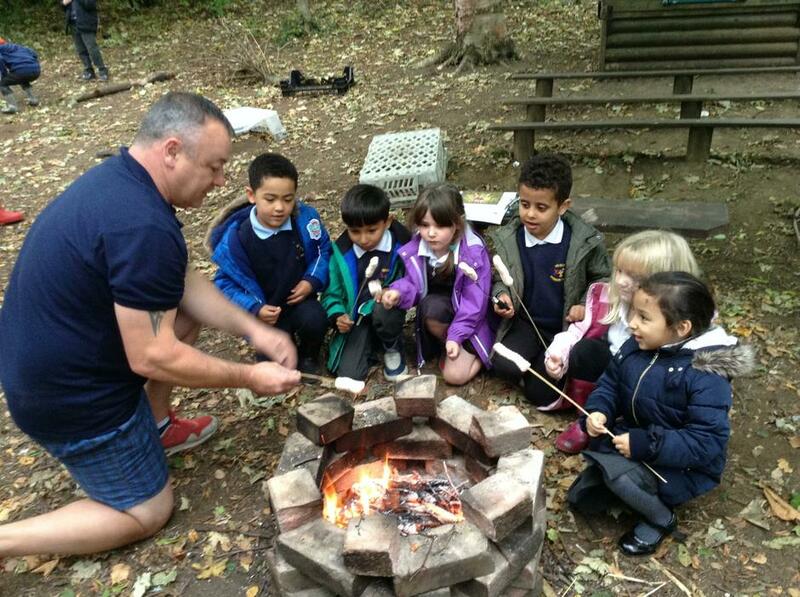 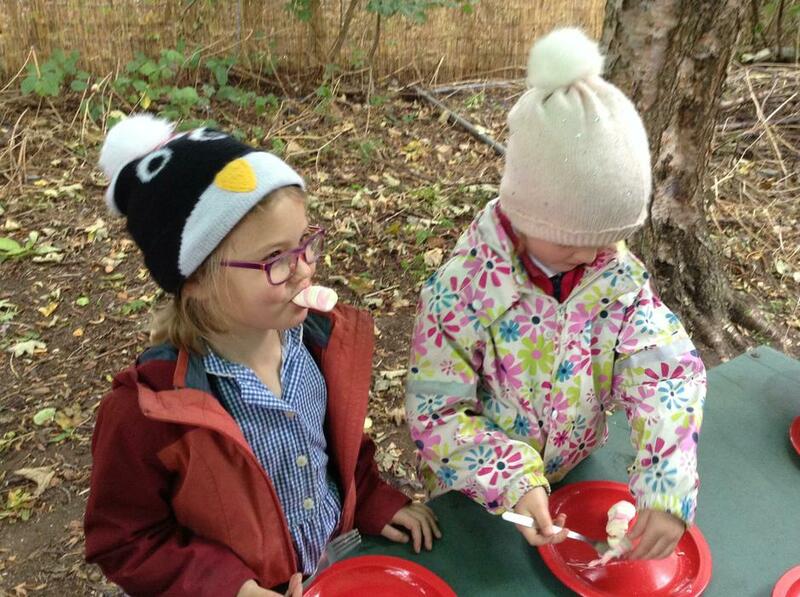 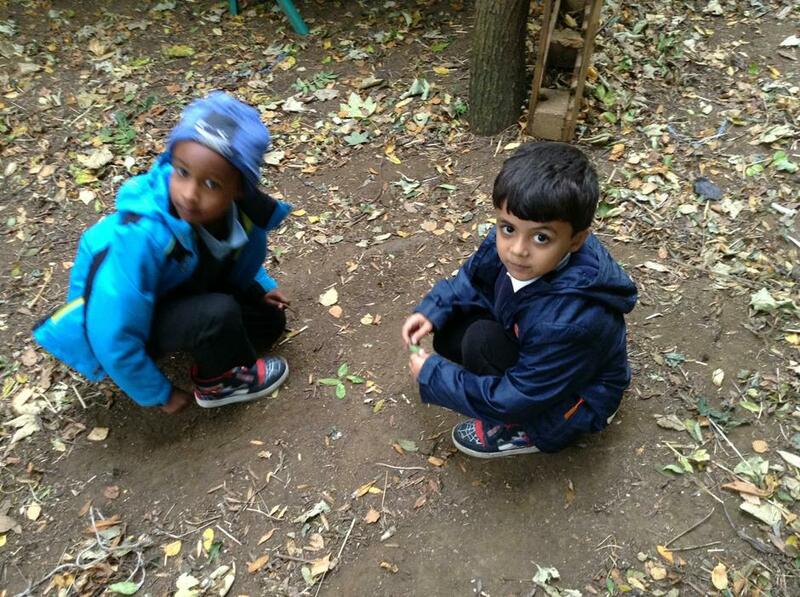 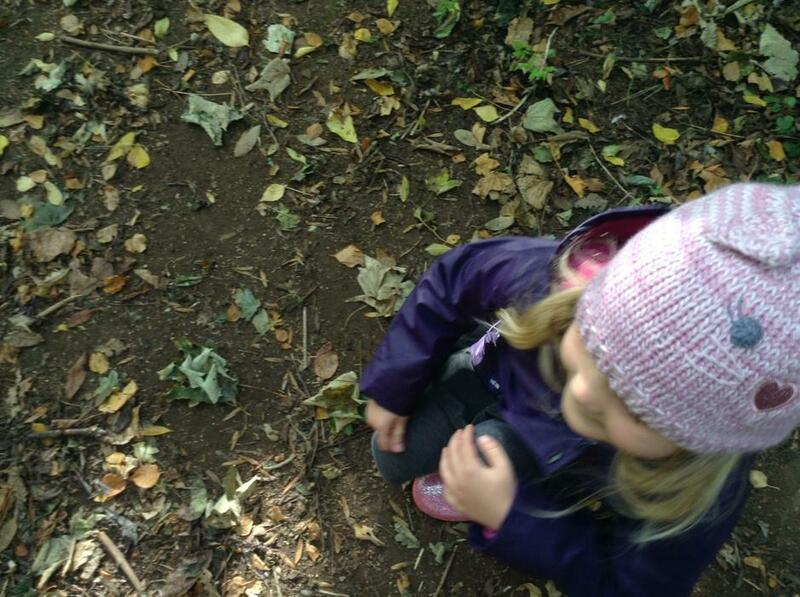 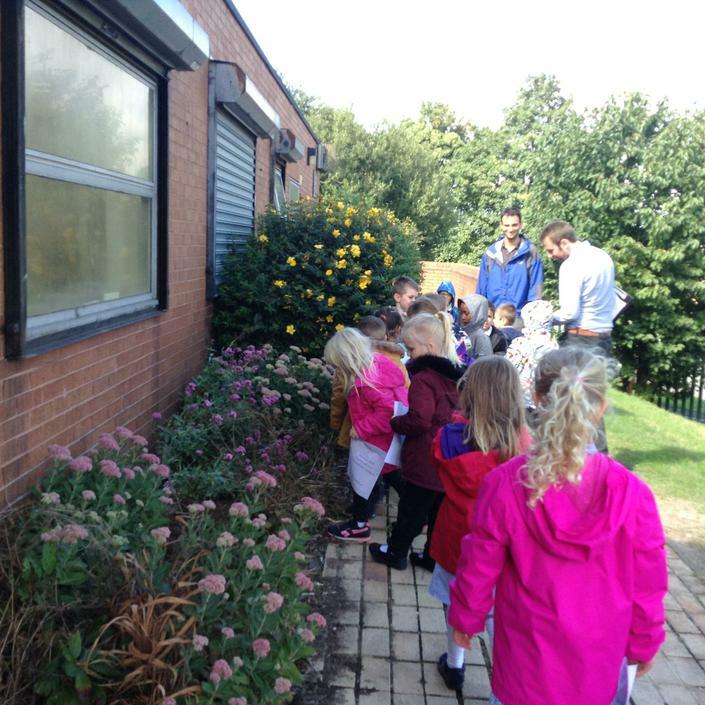 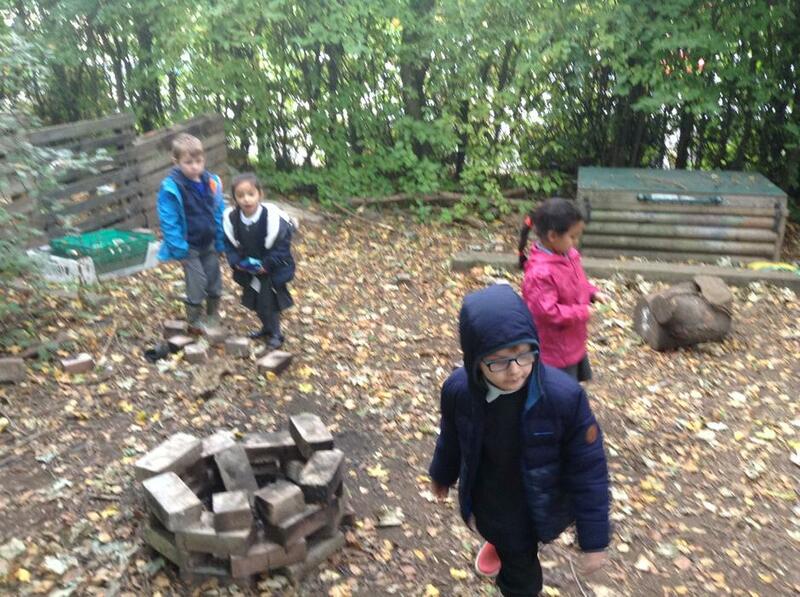 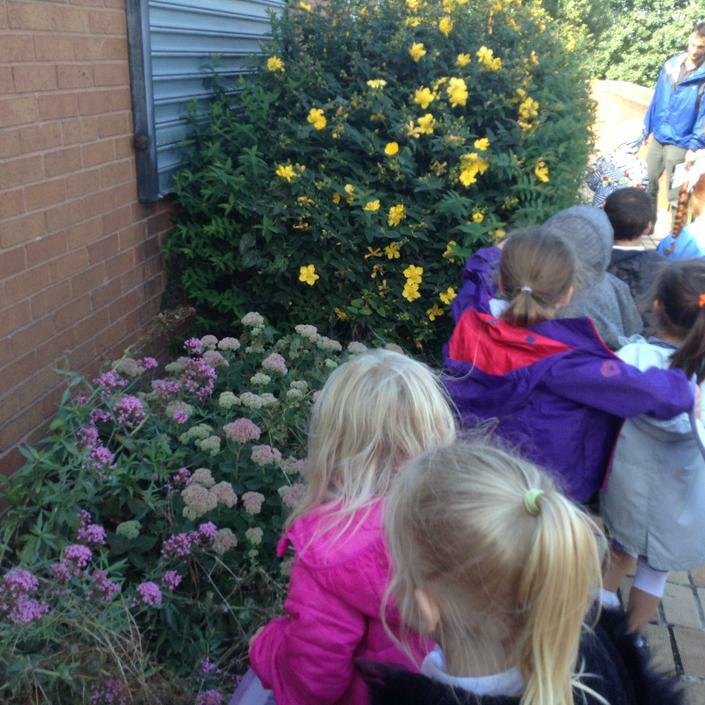 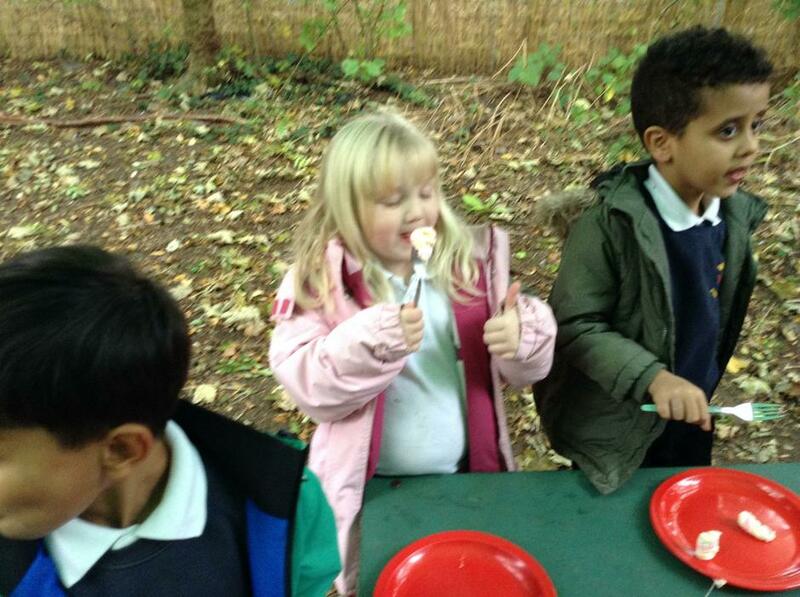 This week the year ones learning objective was to explore outdoors at the end of summer. 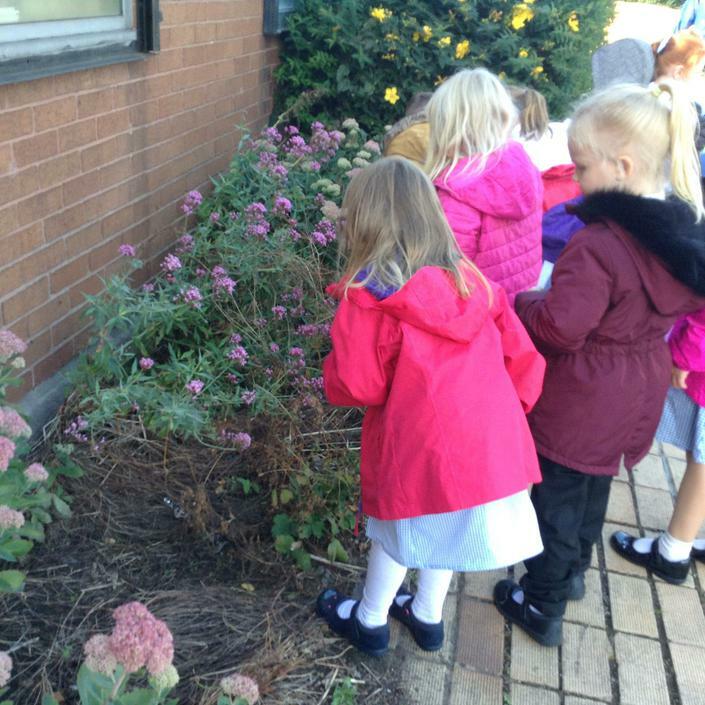 They were encouraged to look closely at the plants, smell them, listen for any animals and to know how it feels to be outside. 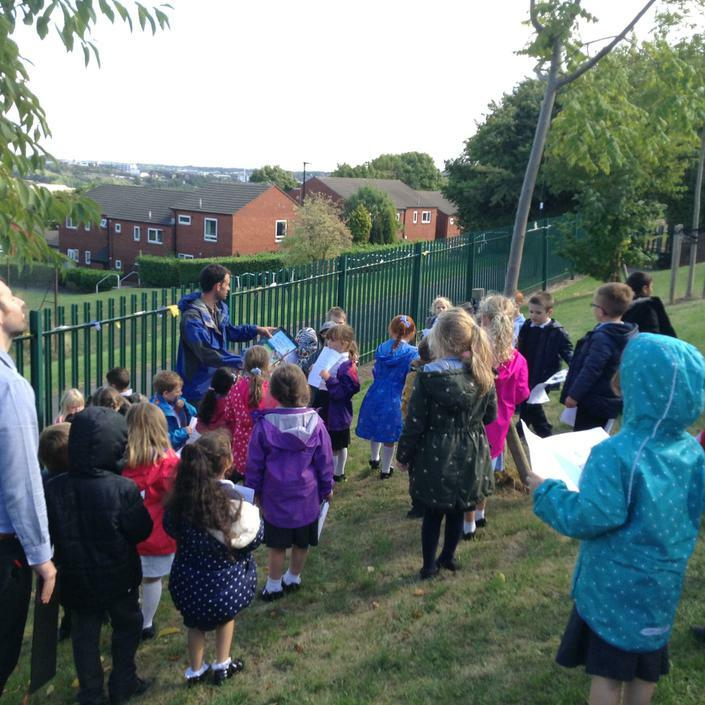 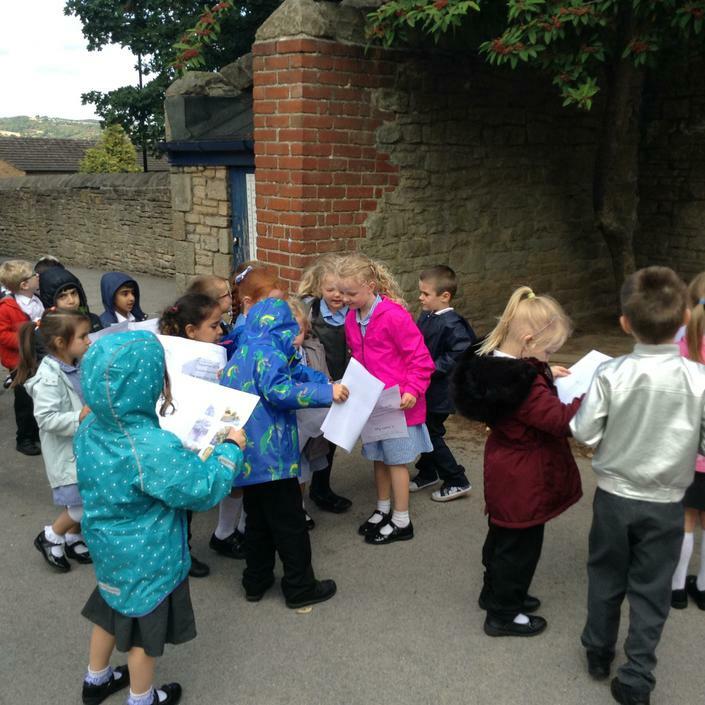 They recorded the weather in their science books and recorded what they saw, smelt, felt and heard. 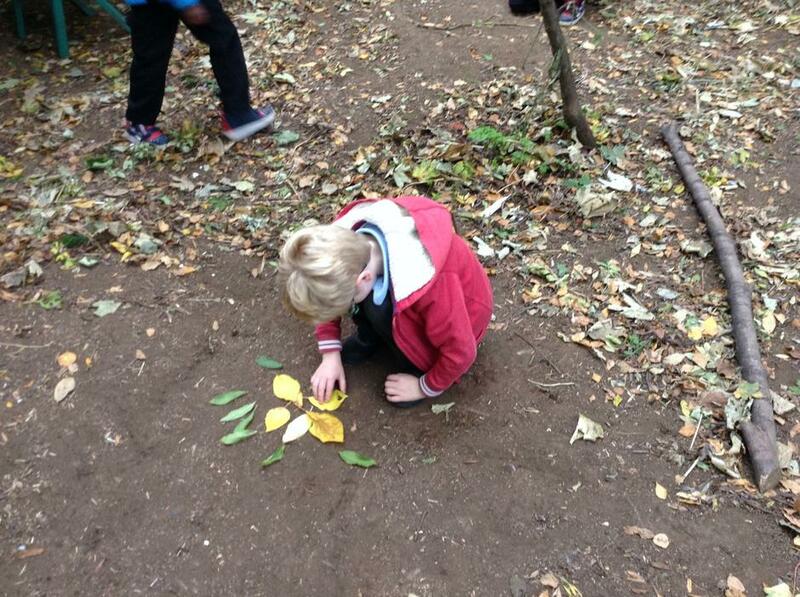 They were also given pictures of plants to find. 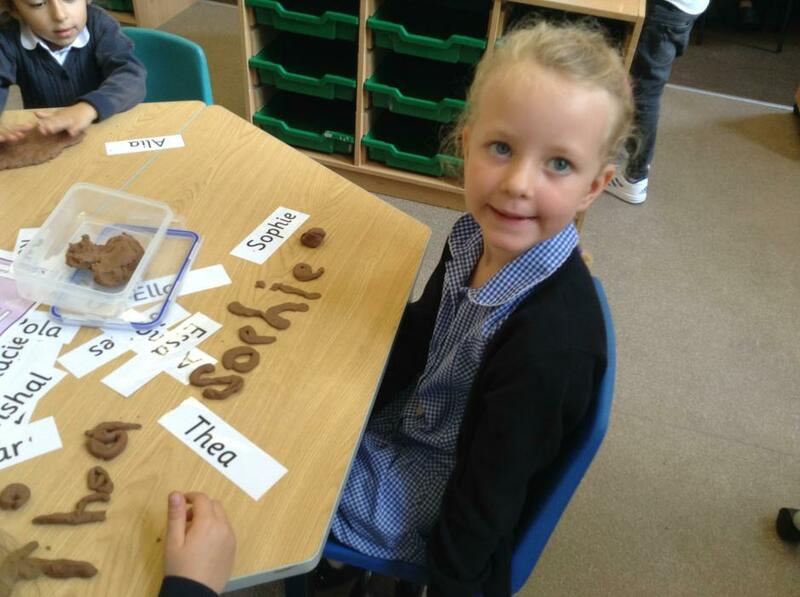 It's been another fantastic week in the Giants. 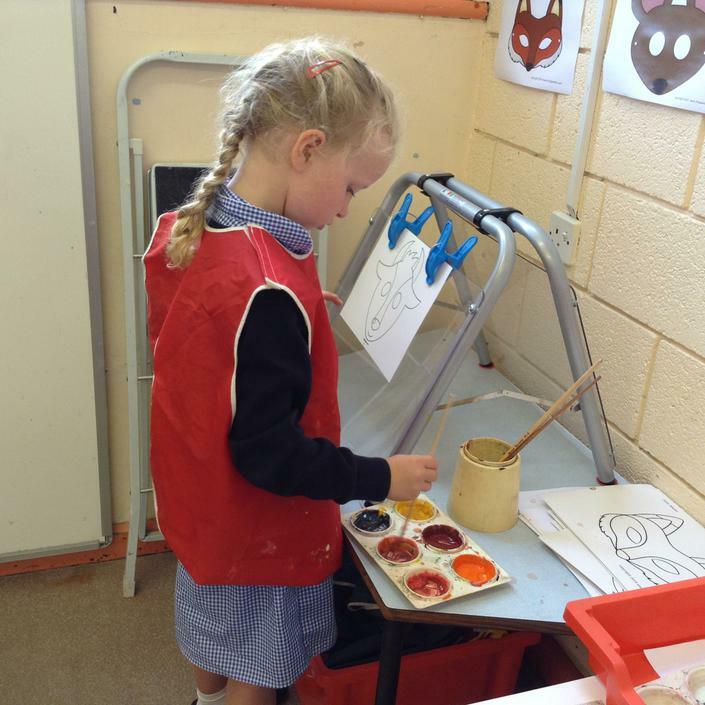 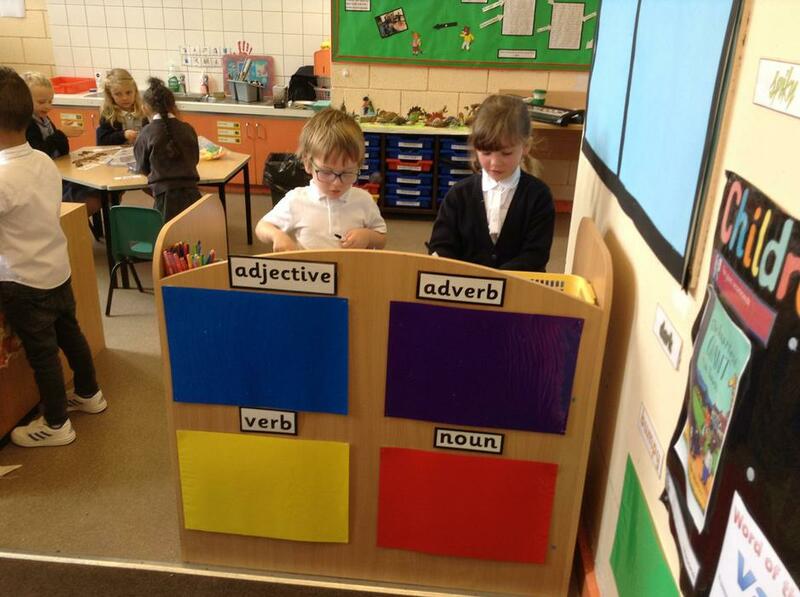 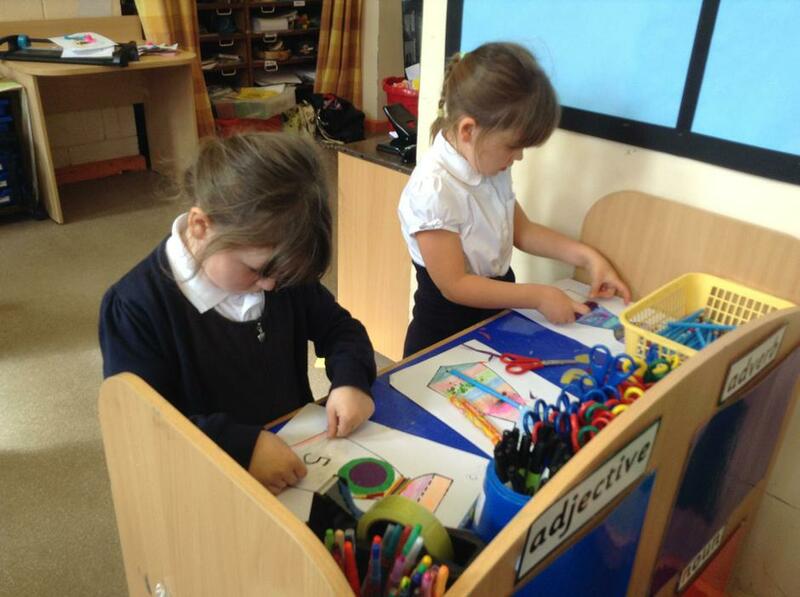 The children are settling into their routines and are developing their learning zone behaviour. 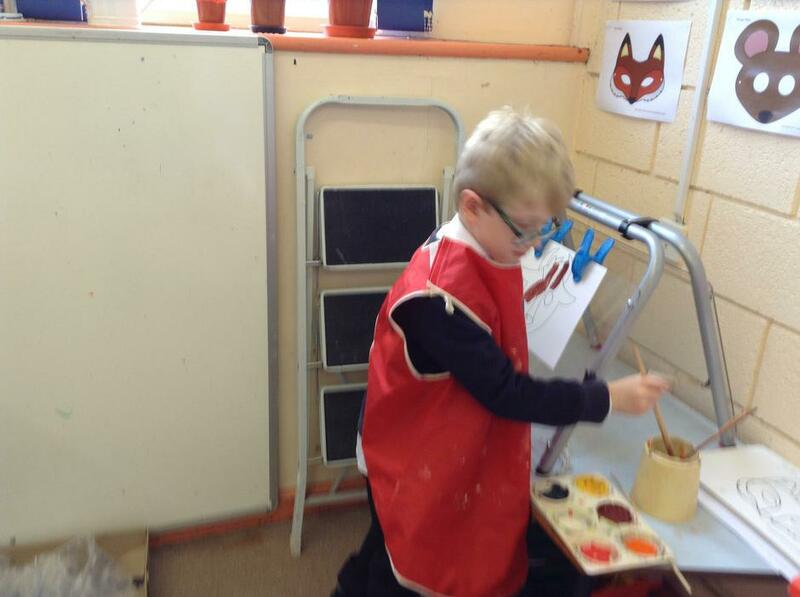 This has meant some great progress is being made already! 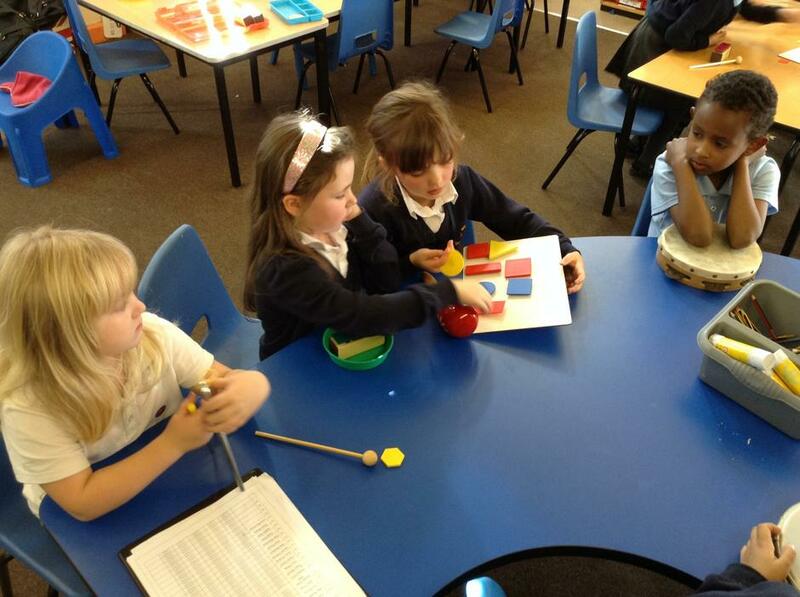 We have been working hard in Maths, developing our counting skills and estimating. 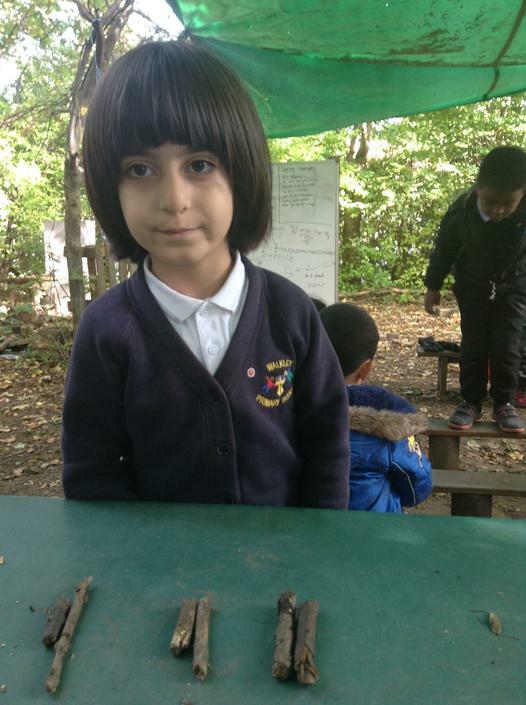 The children were learning whether a number is more or less than 10 and using the landmarks of multiples of 5 to help children place other numbers on a line or bead bar. 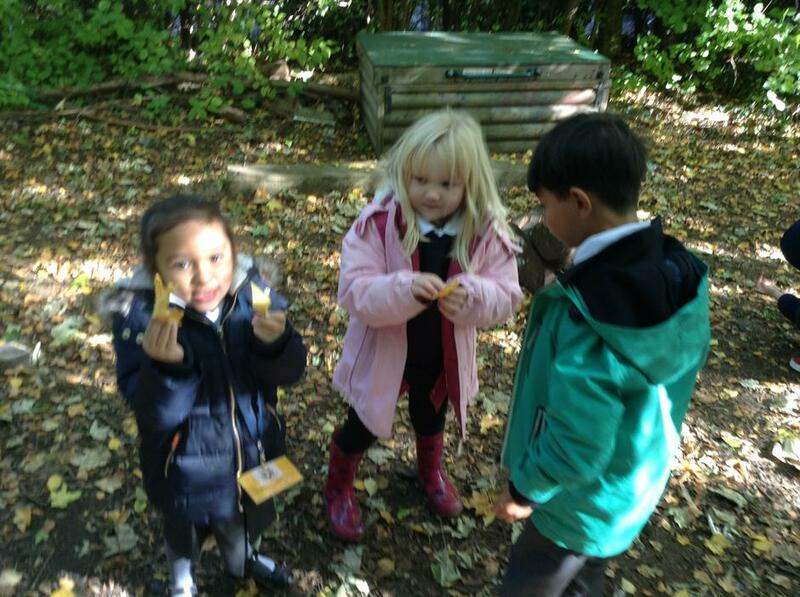 The children had number cards 1–20 not in order. 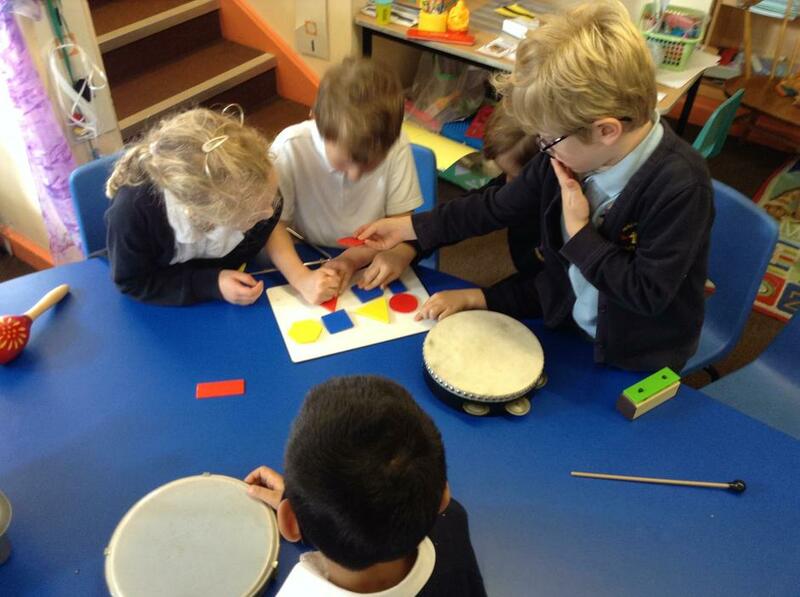 They found the number 10, and then sorted the numbers into those more than 10 and those less than 10. 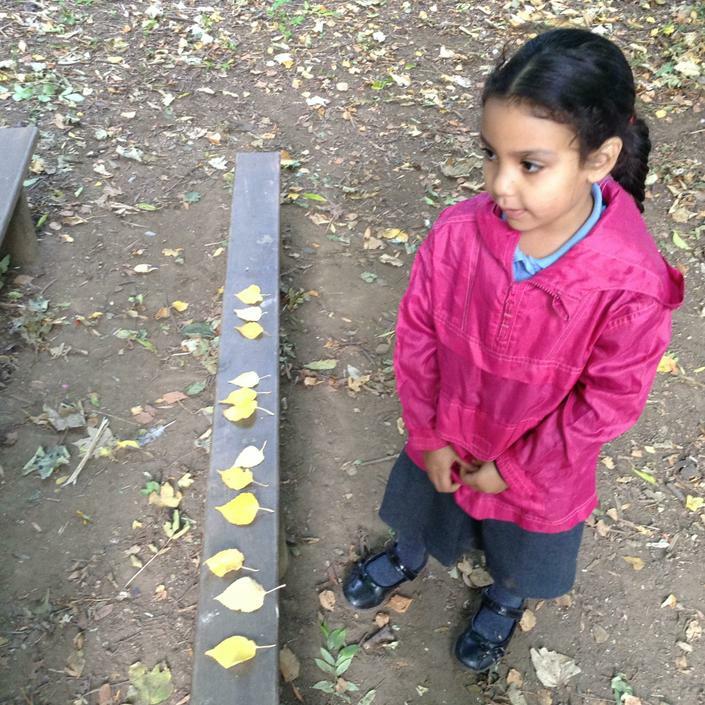 They then ordered numbers 1 to 9, and then 11 to 20 to form a line of numbers from 1 to 20. 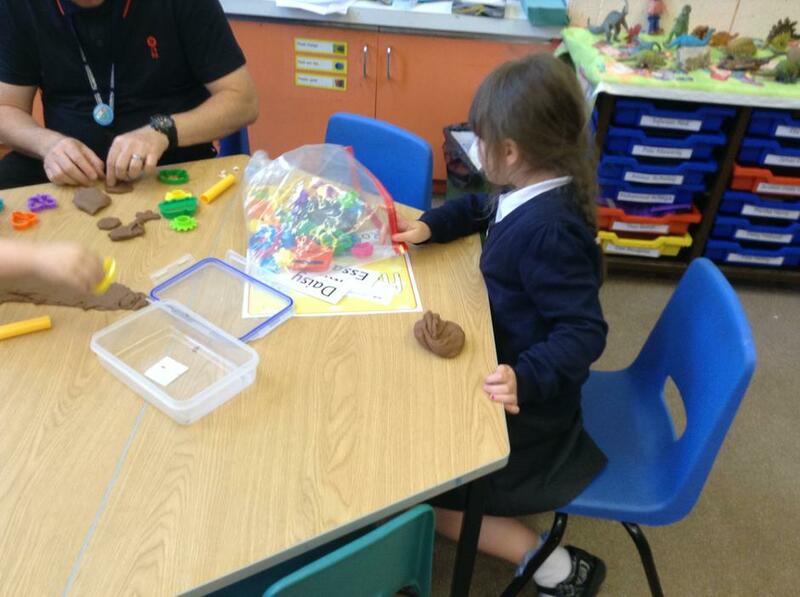 Each child had a small ball of Play dough. 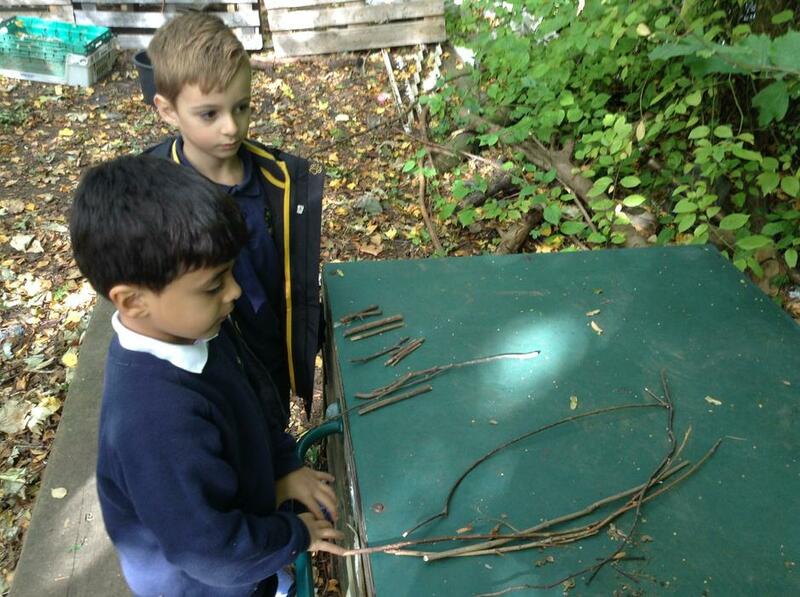 They rolled it into a ‘worm’ and estimated whether it was longer or shorter than 10 beads long. 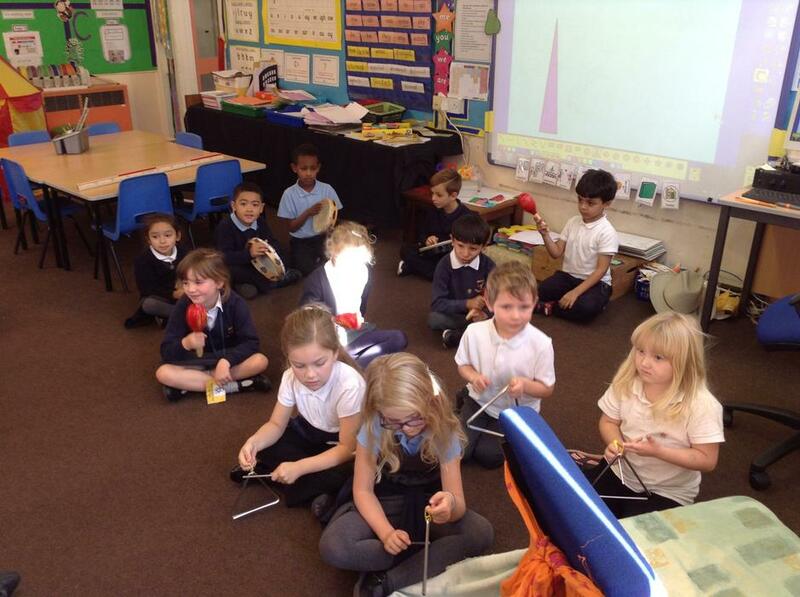 They used a 20-bead string to check. 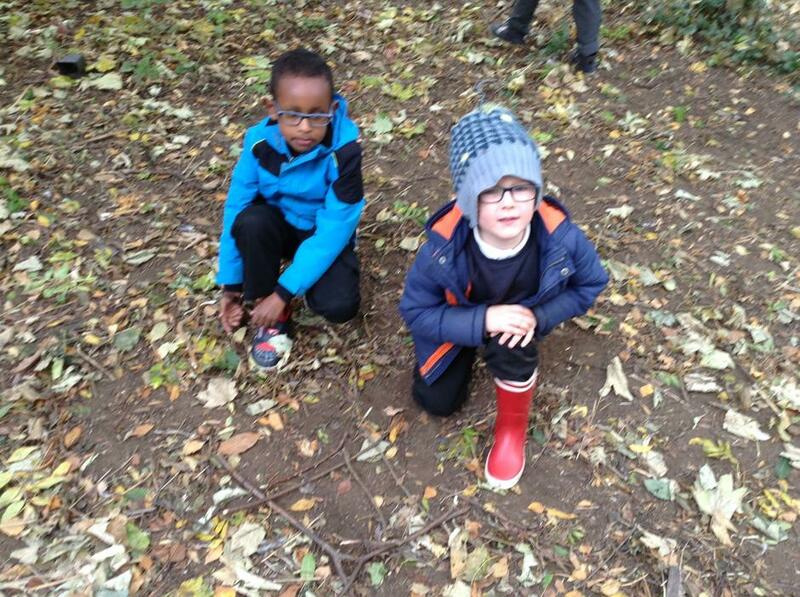 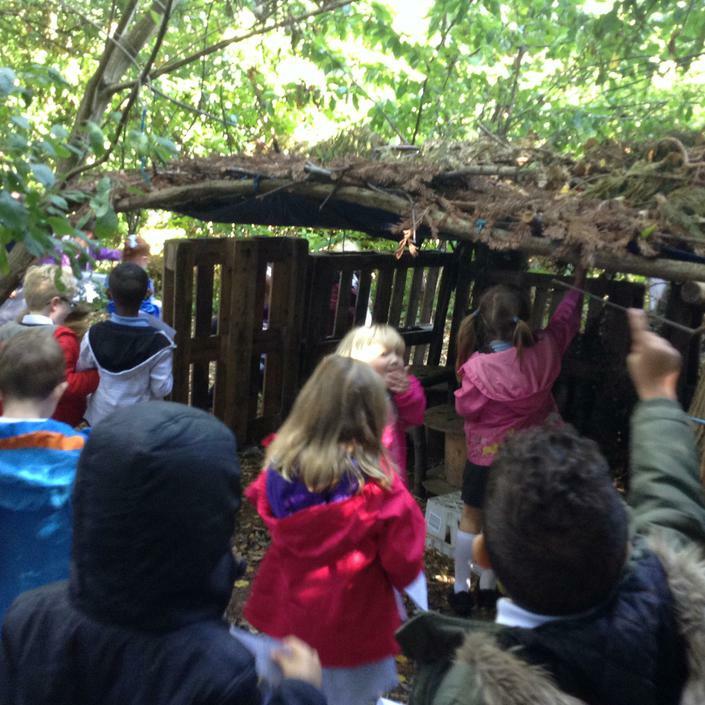 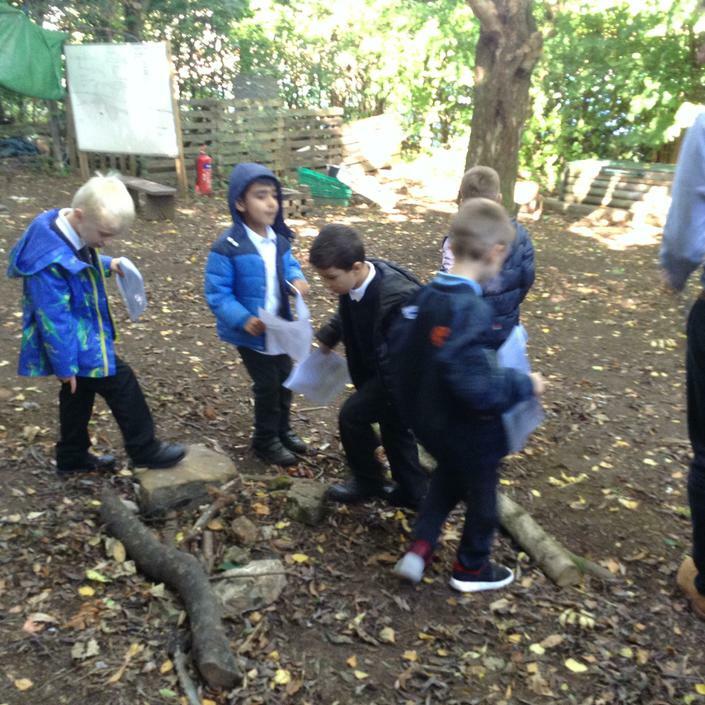 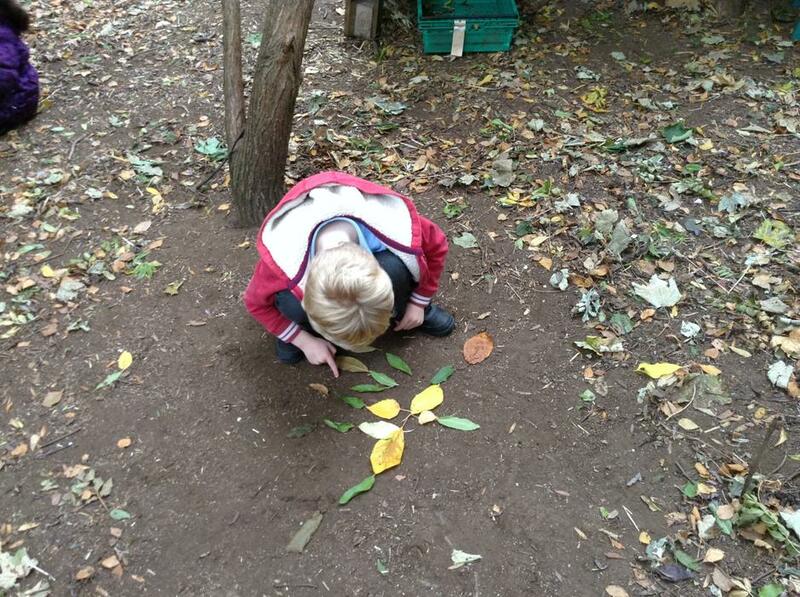 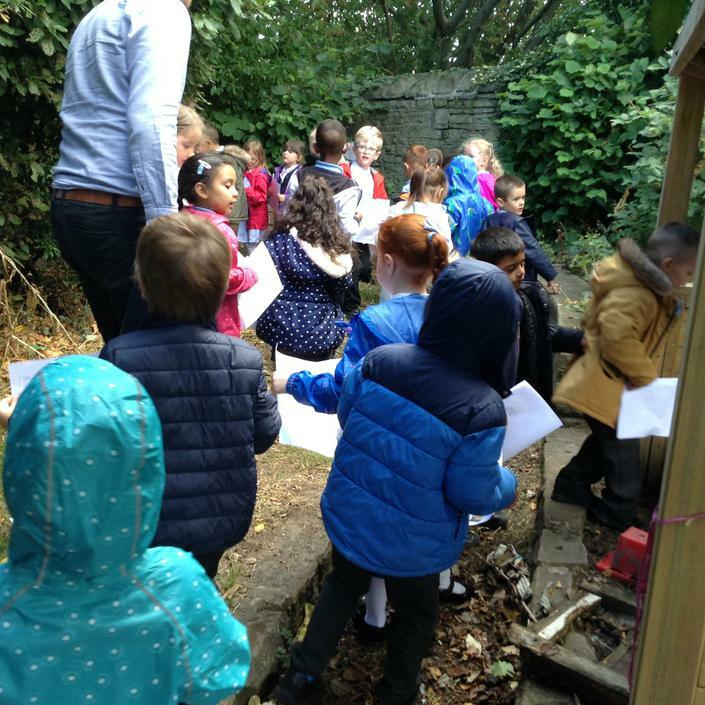 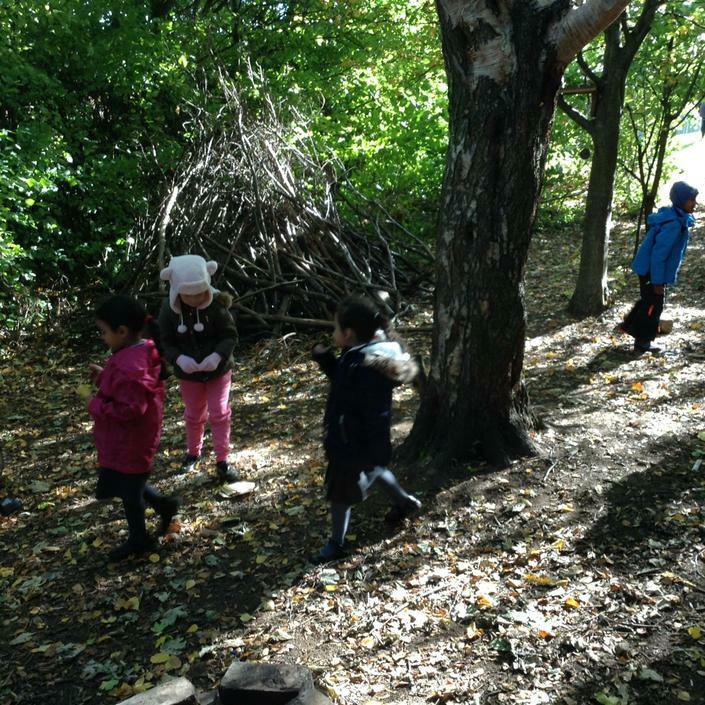 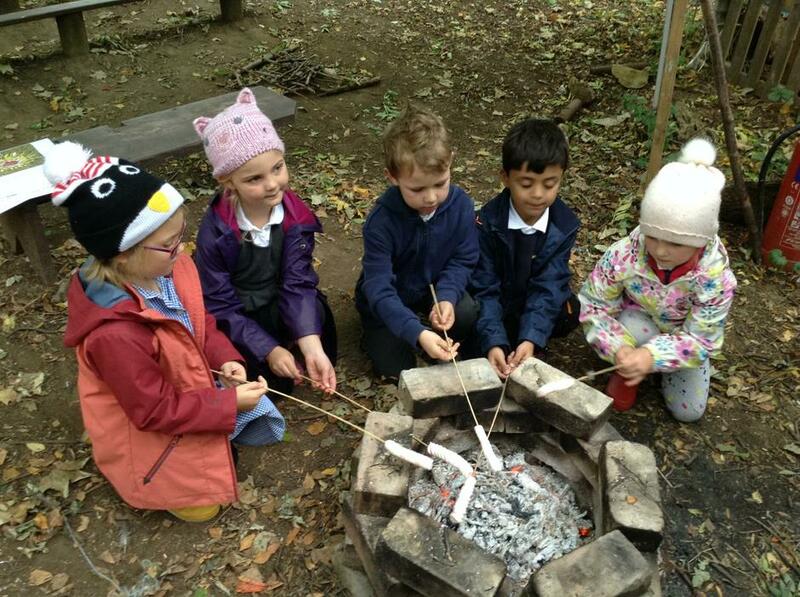 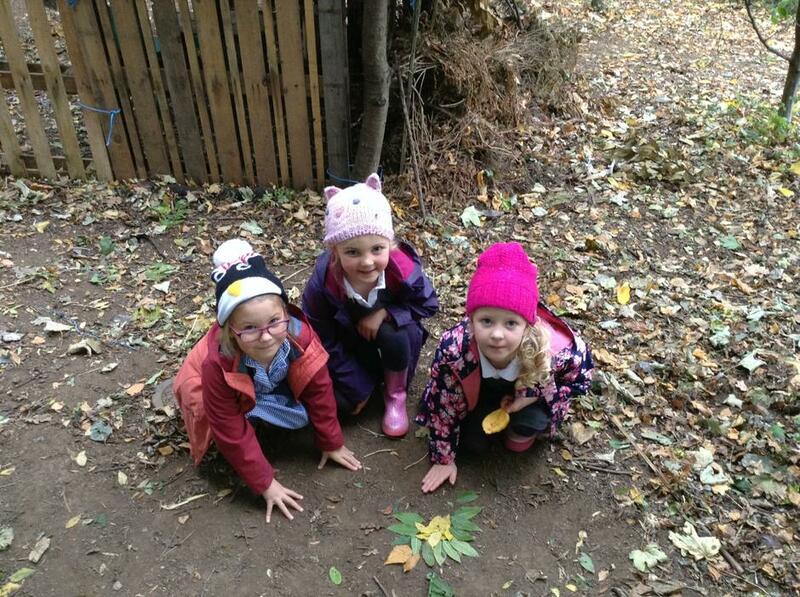 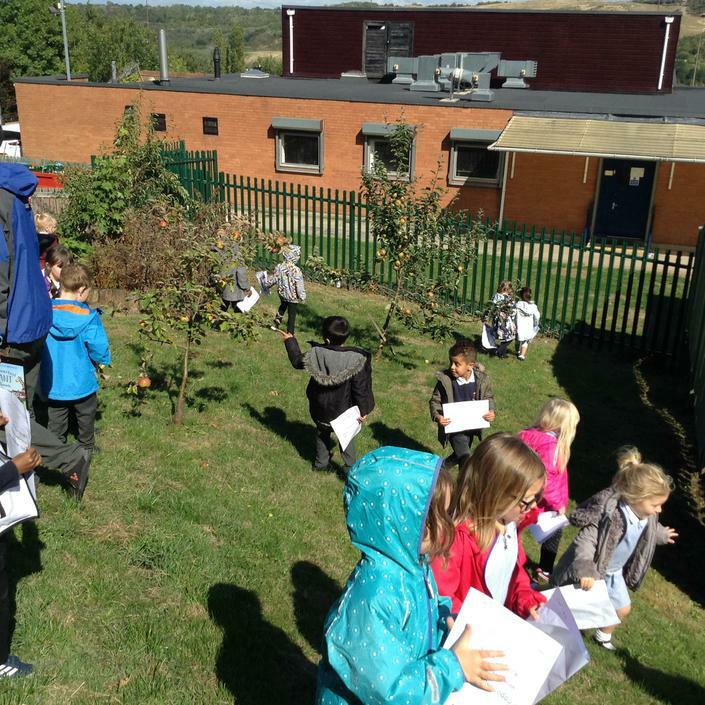 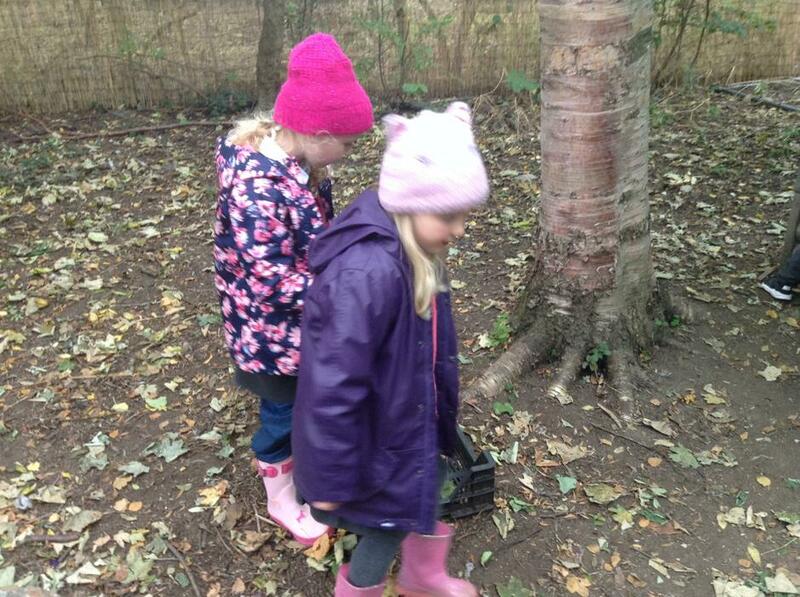 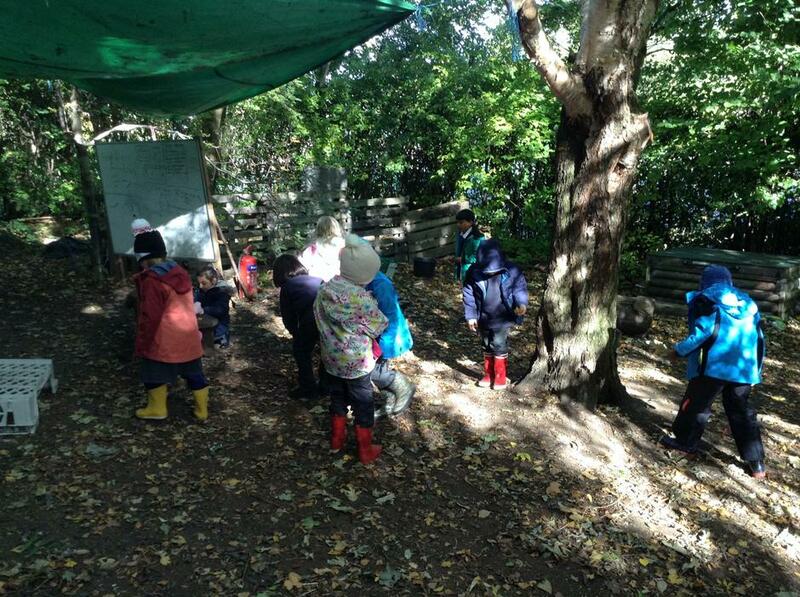 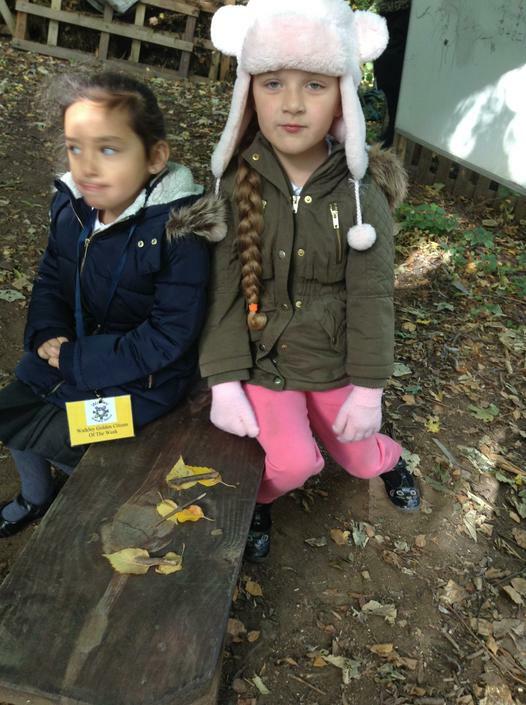 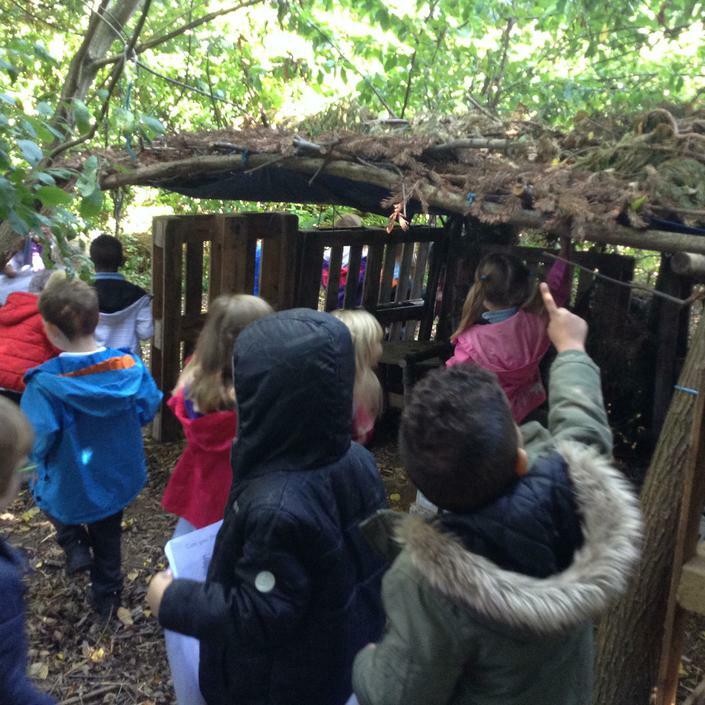 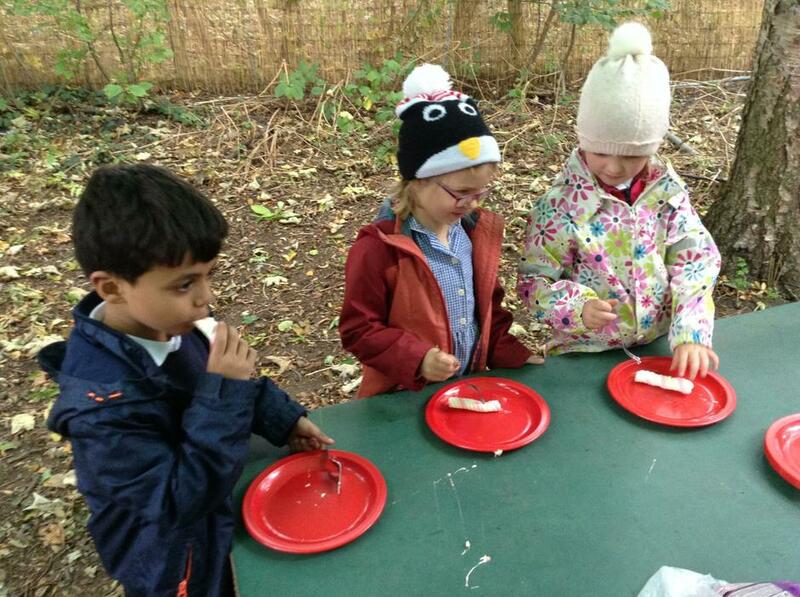 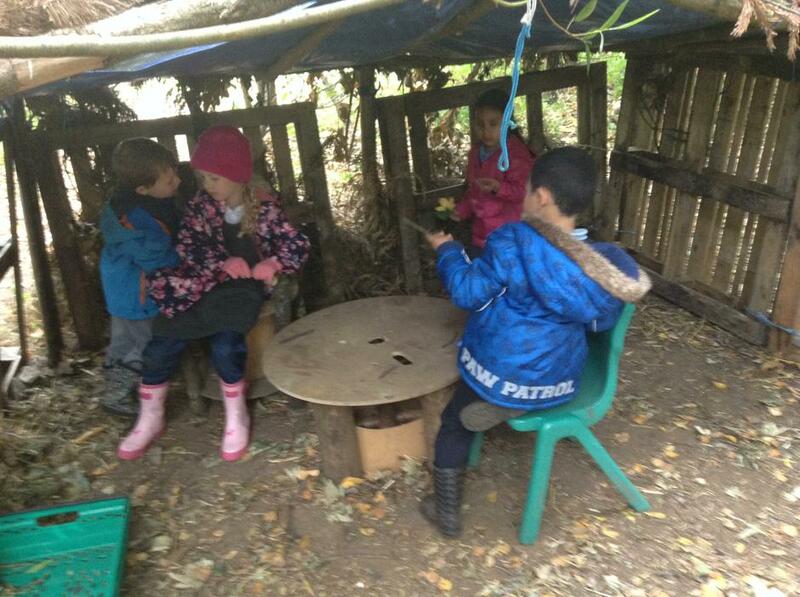 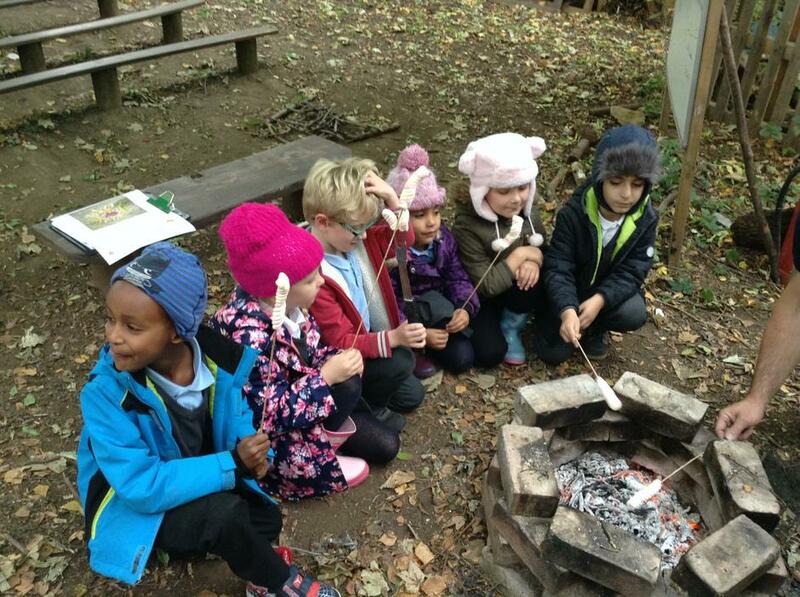 The wonderful thing about having a forest school in the school grounds is that if it isn't booked out by a class we can access it in any lesson we like. 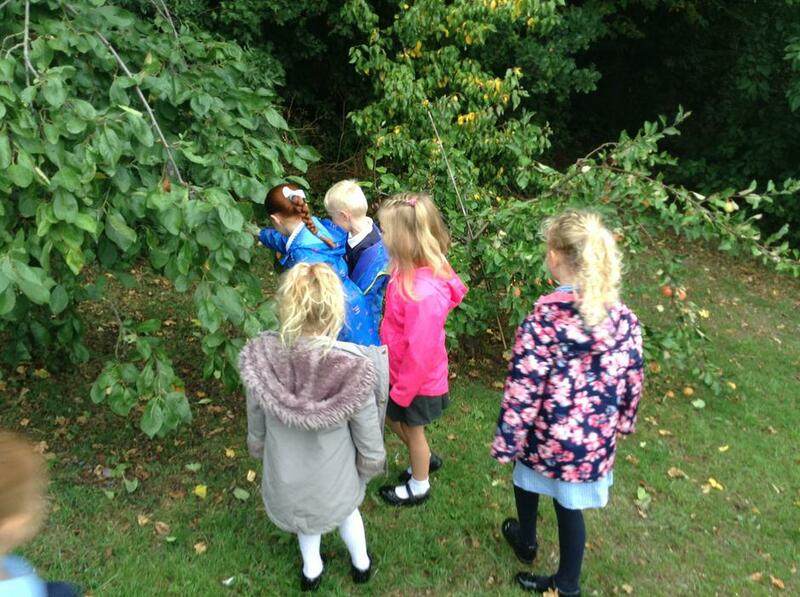 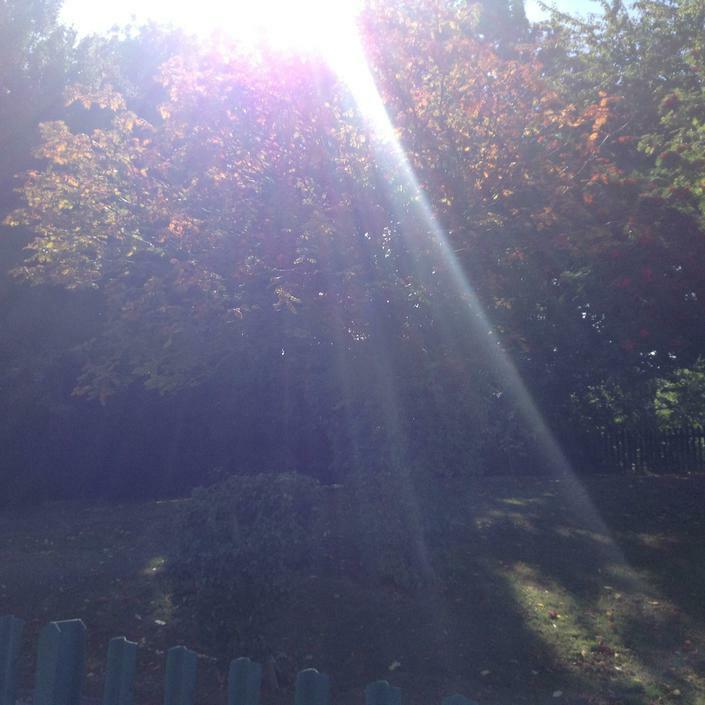 This week we were looking at the wonder of nature and how religious people express their thankfulness. 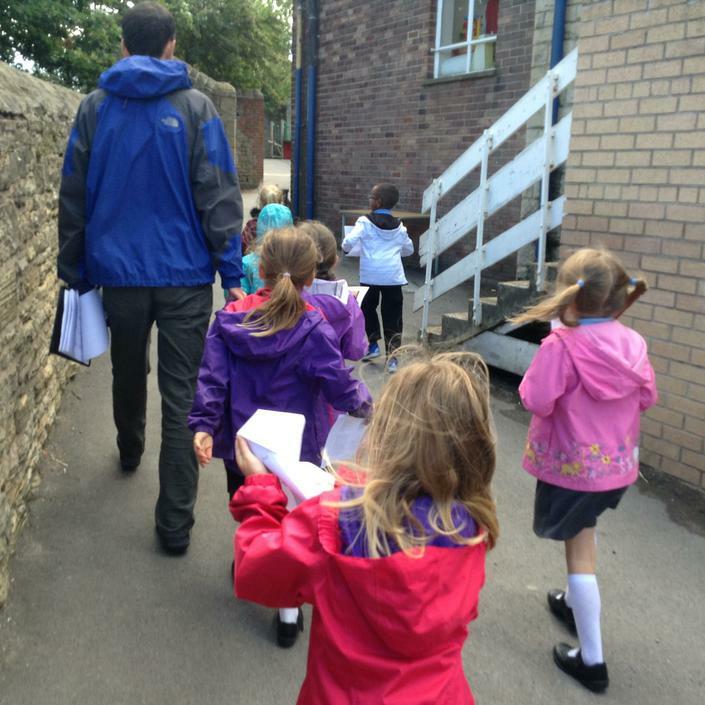 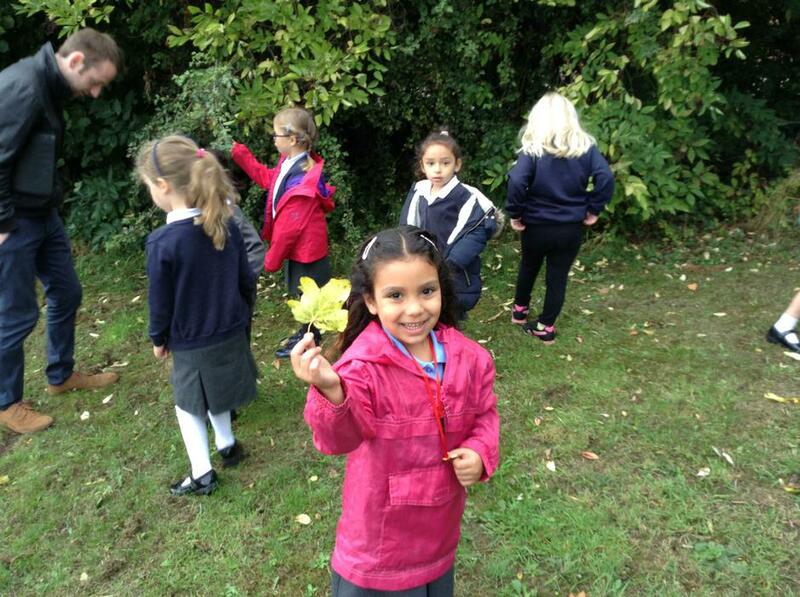 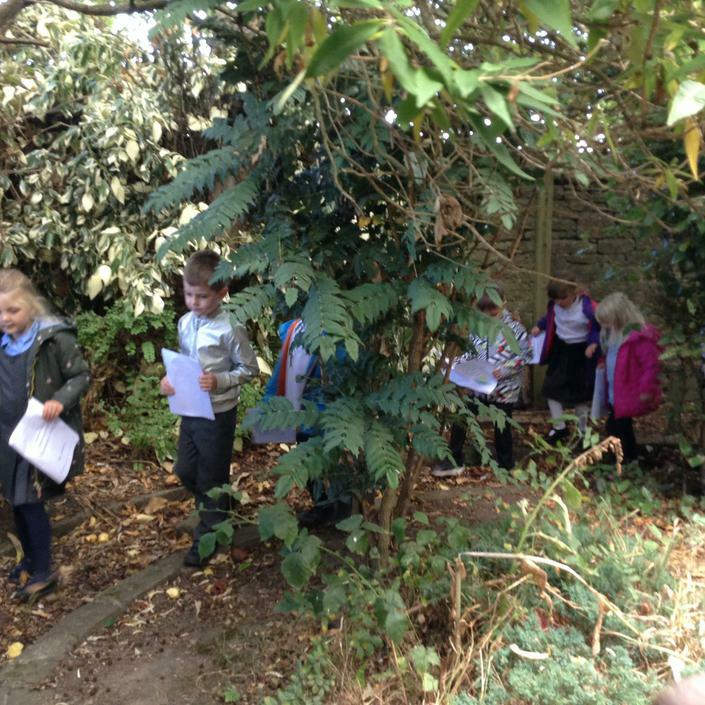 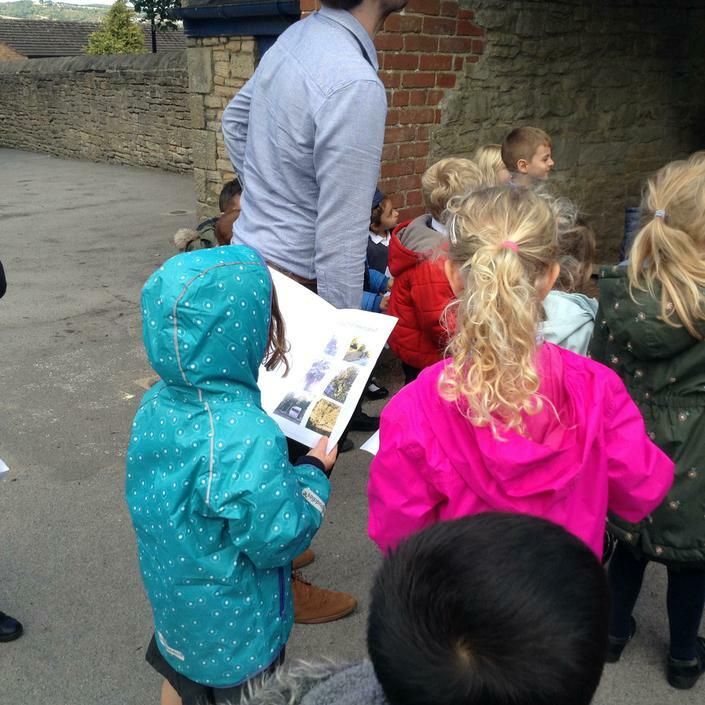 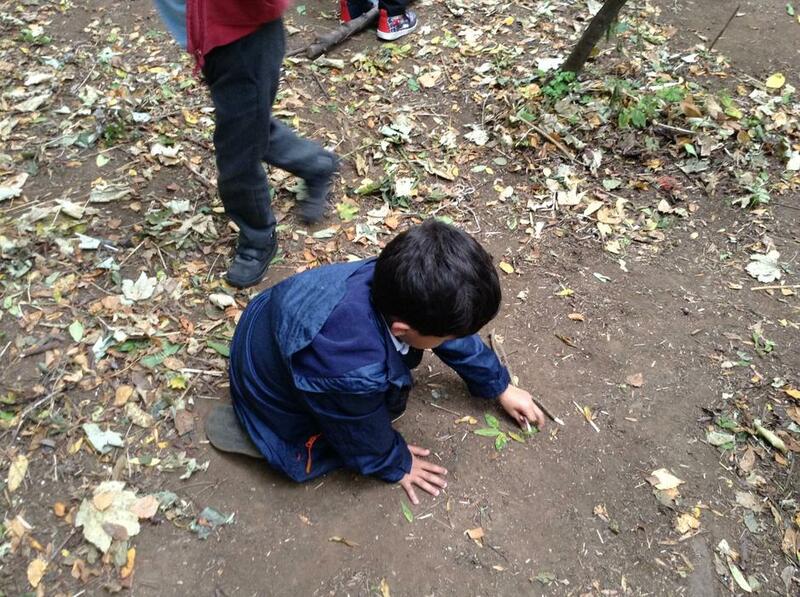 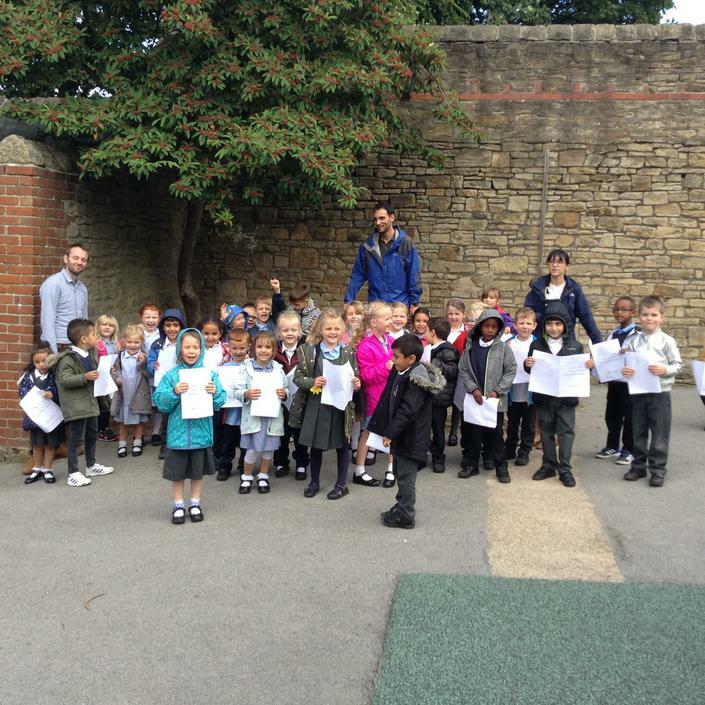 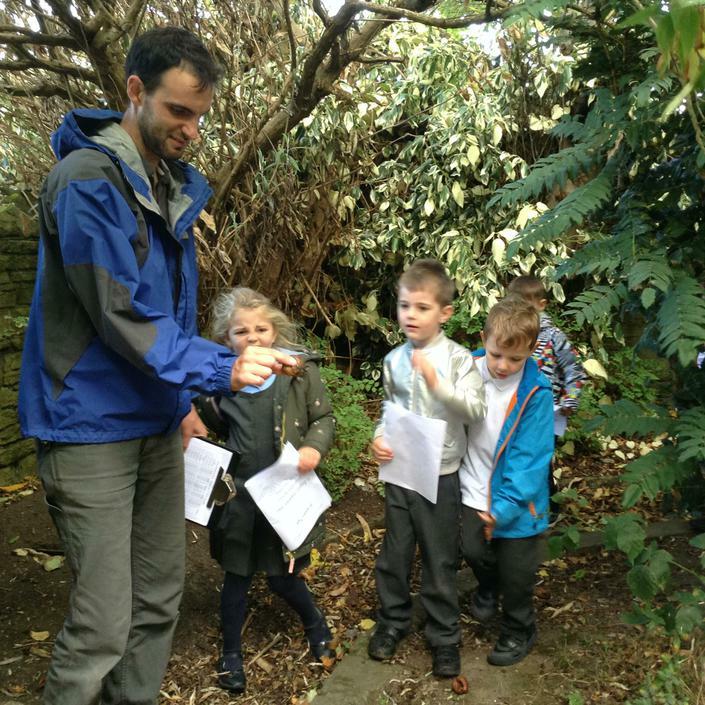 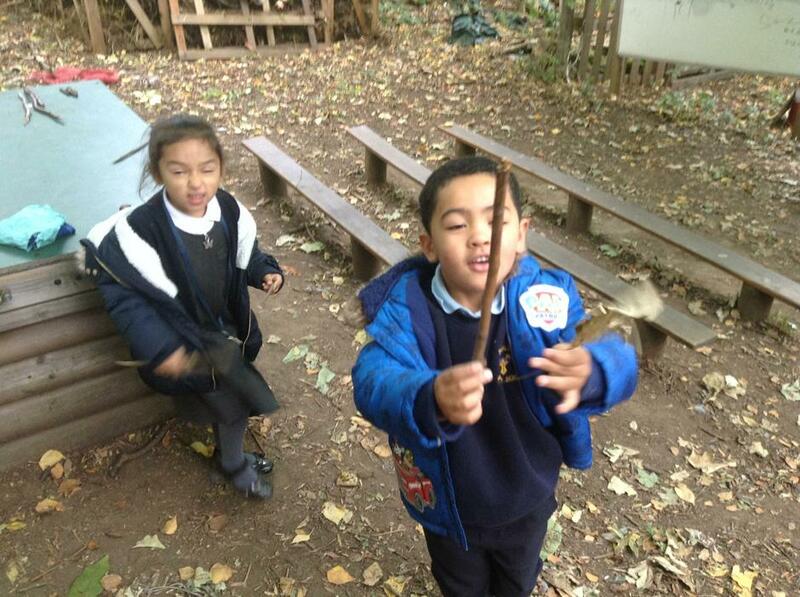 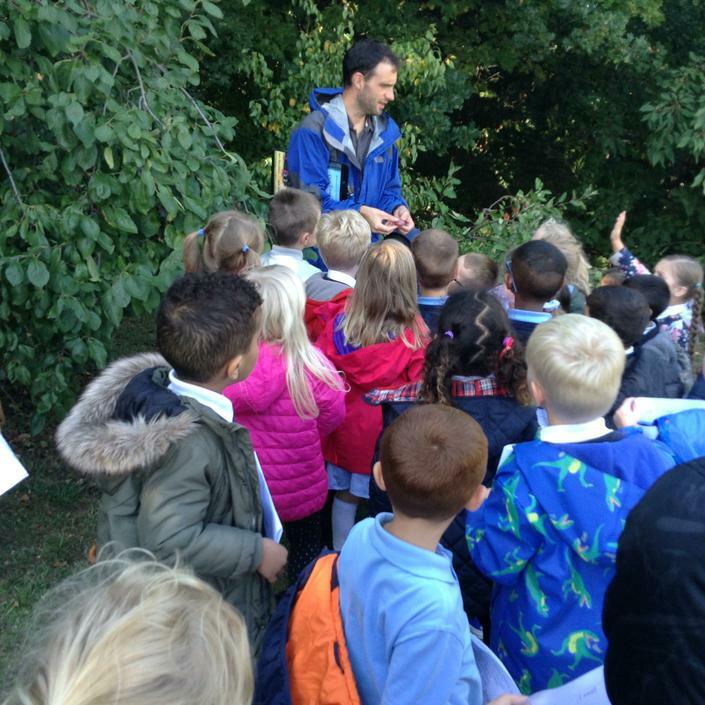 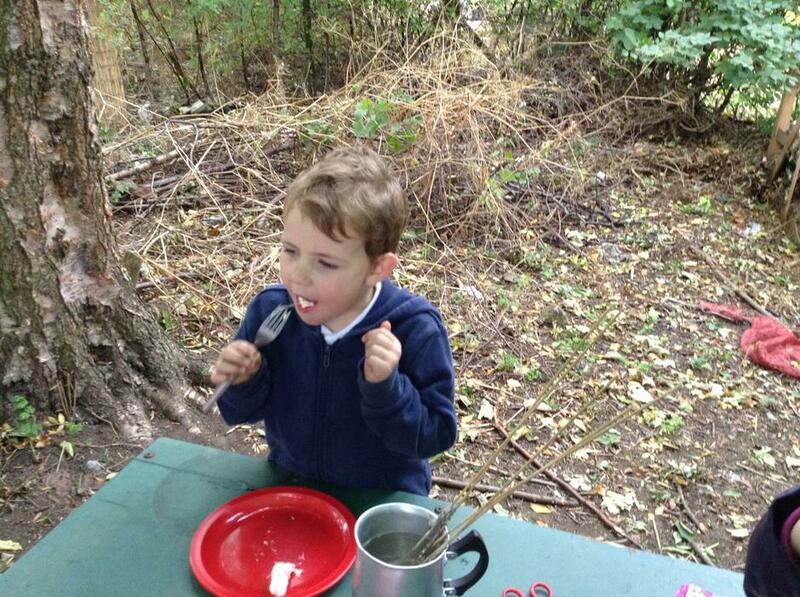 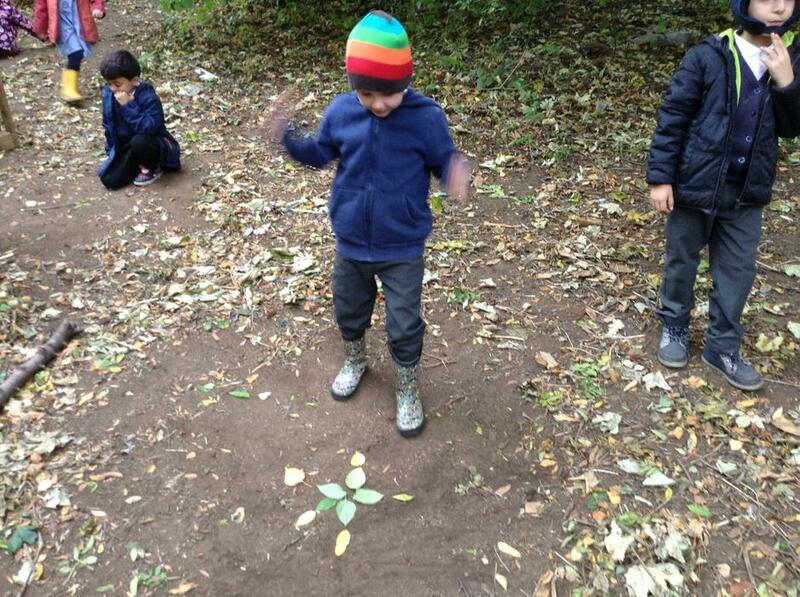 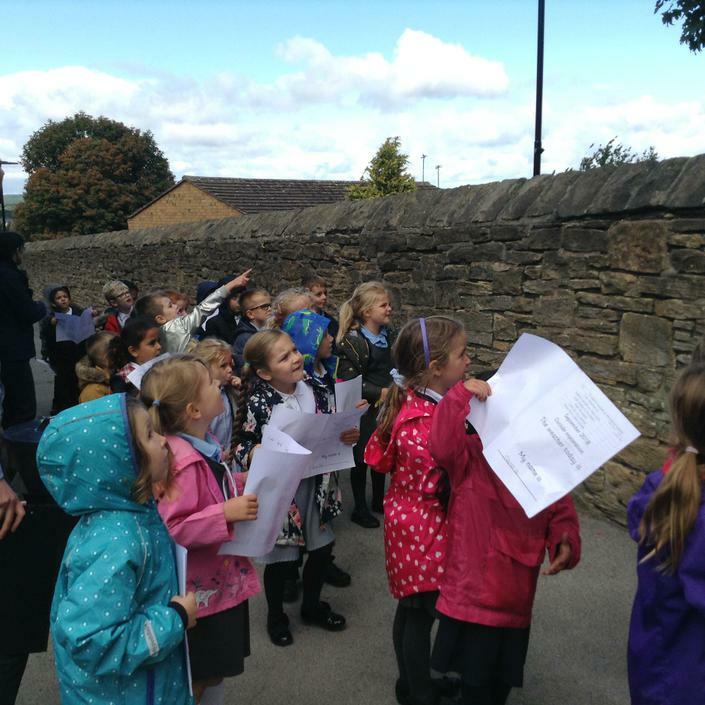 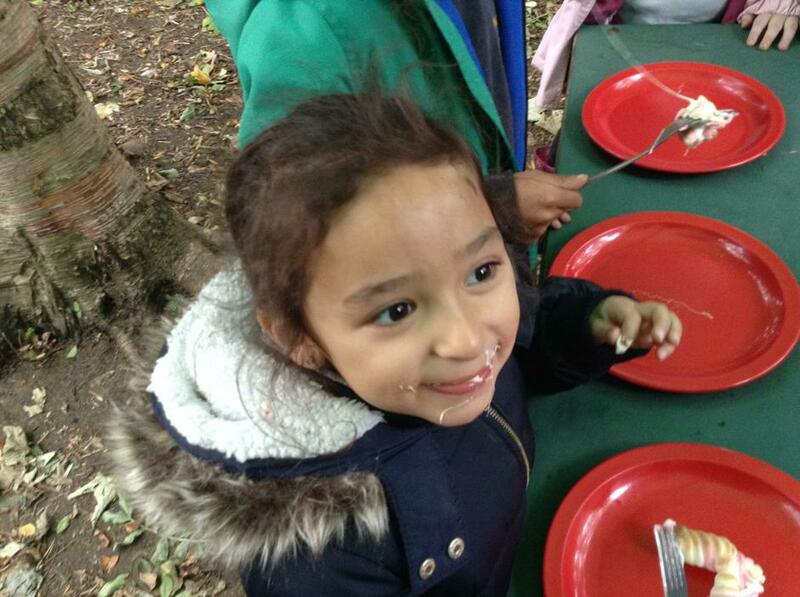 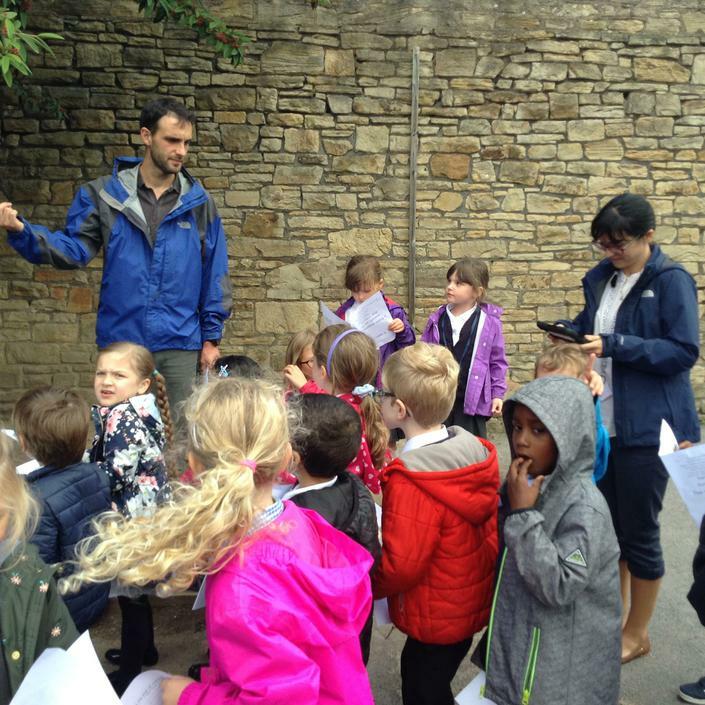 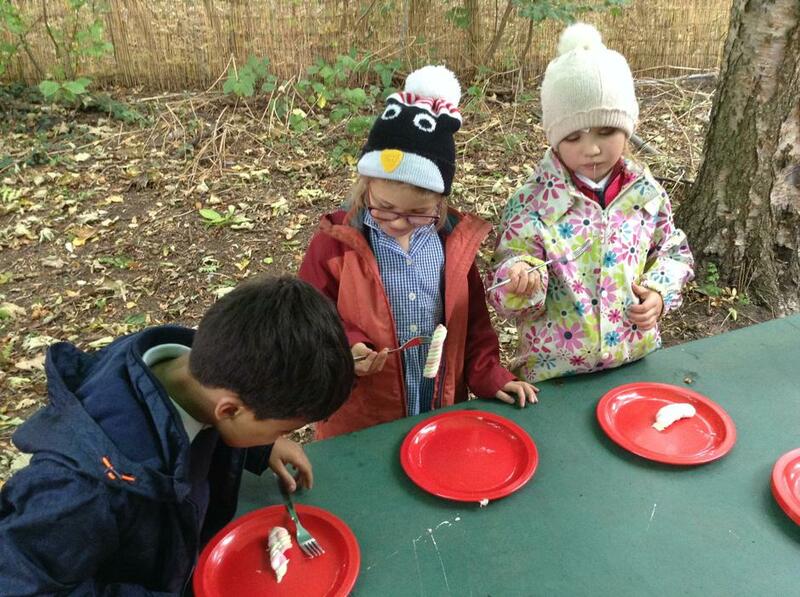 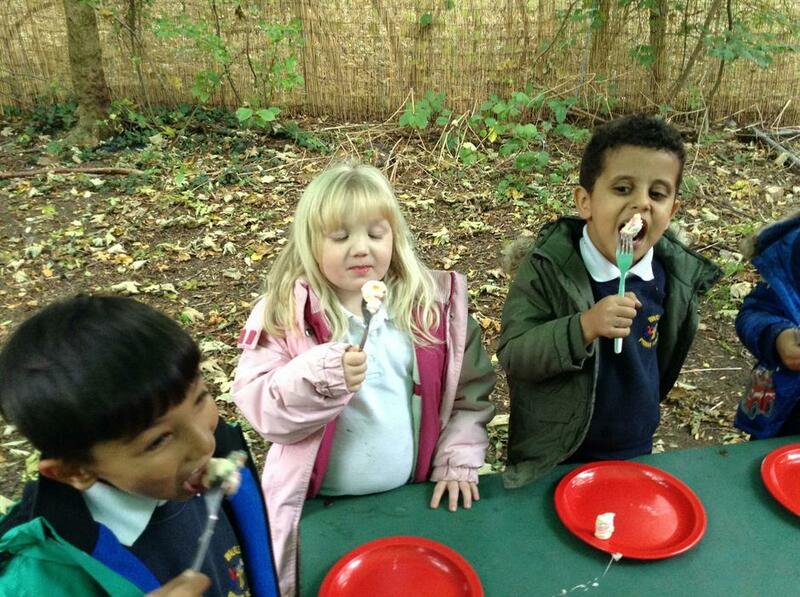 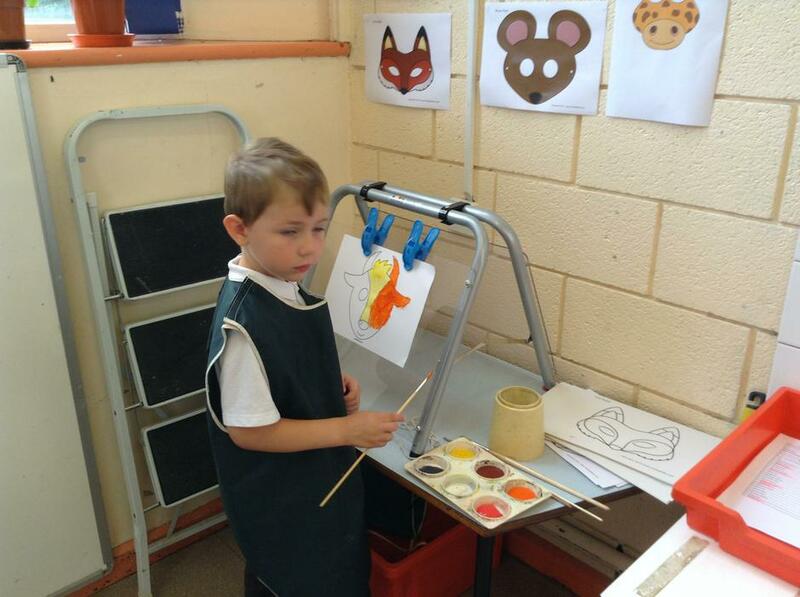 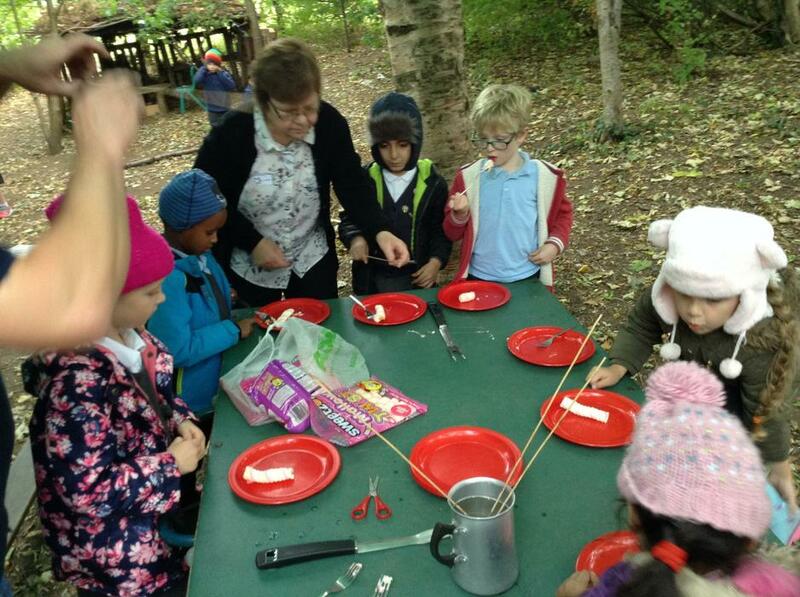 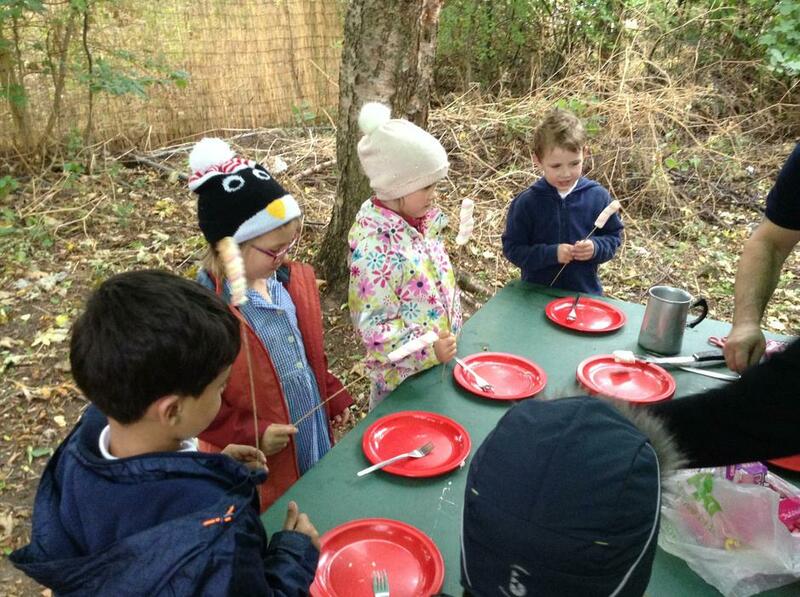 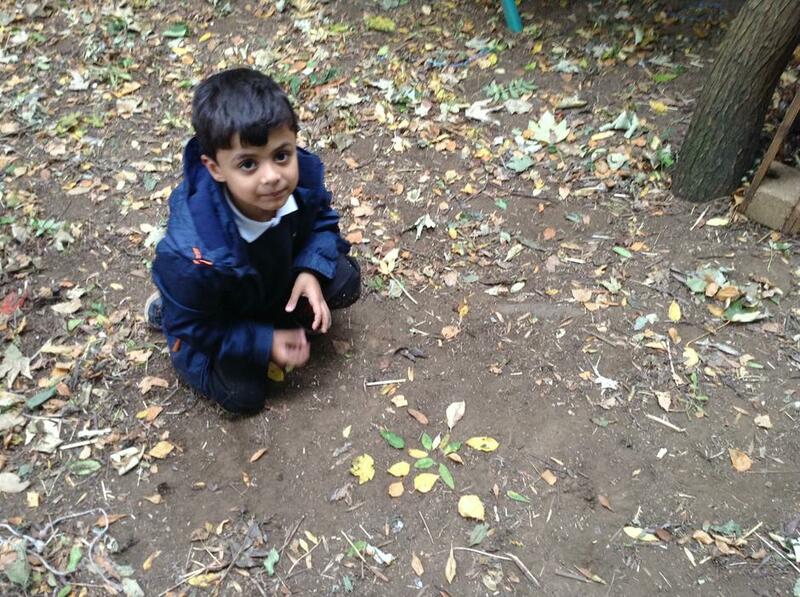 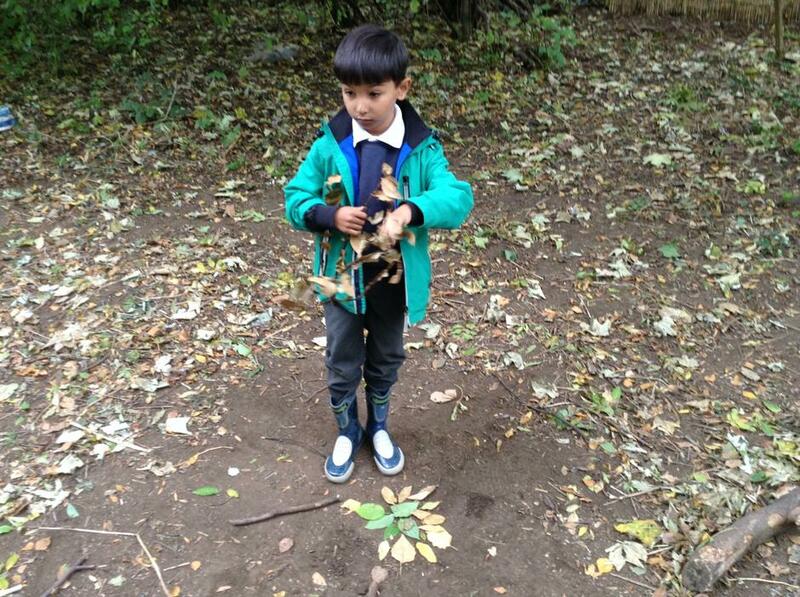 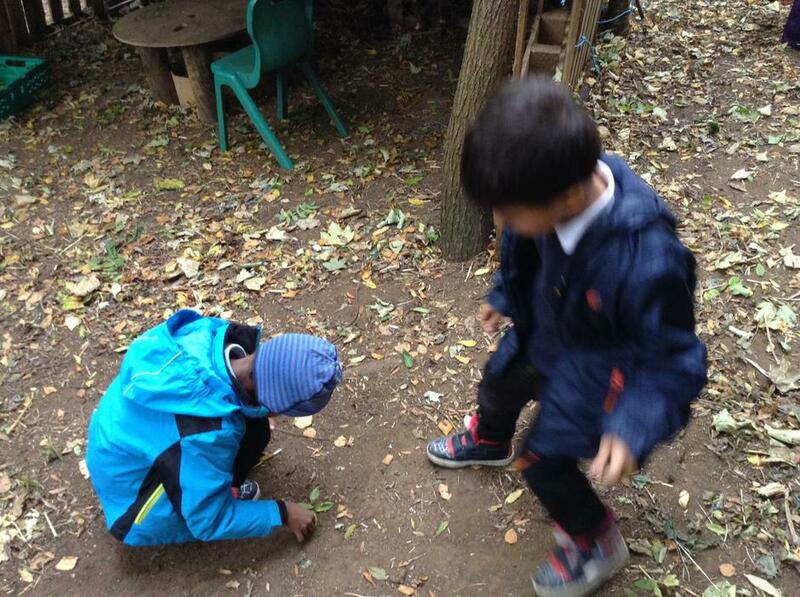 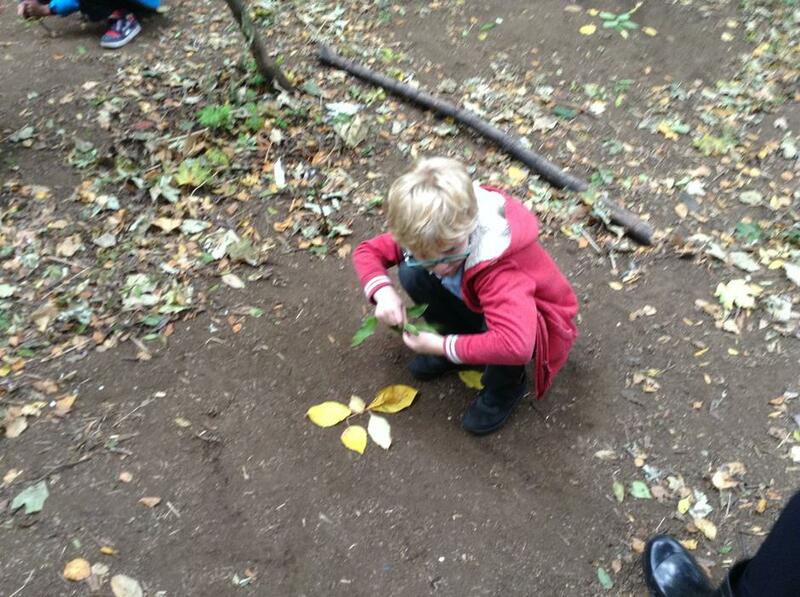 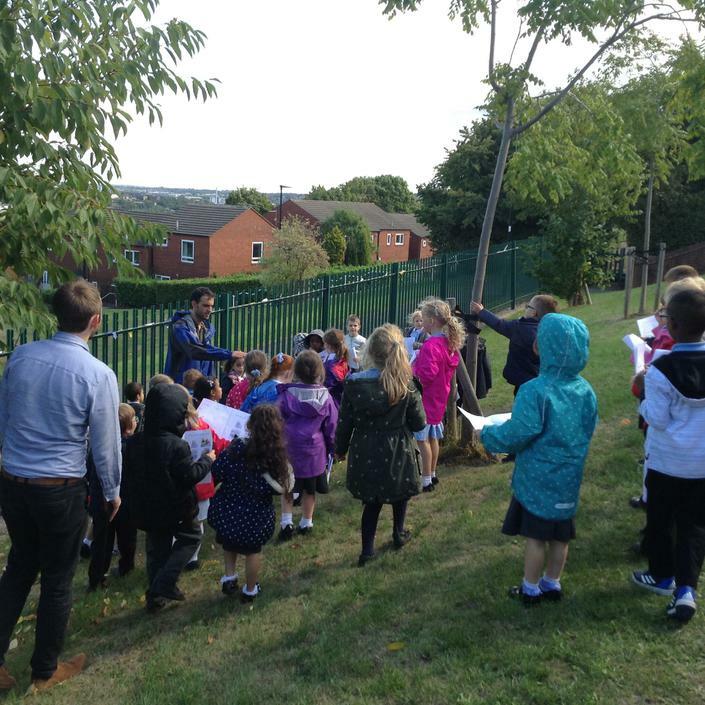 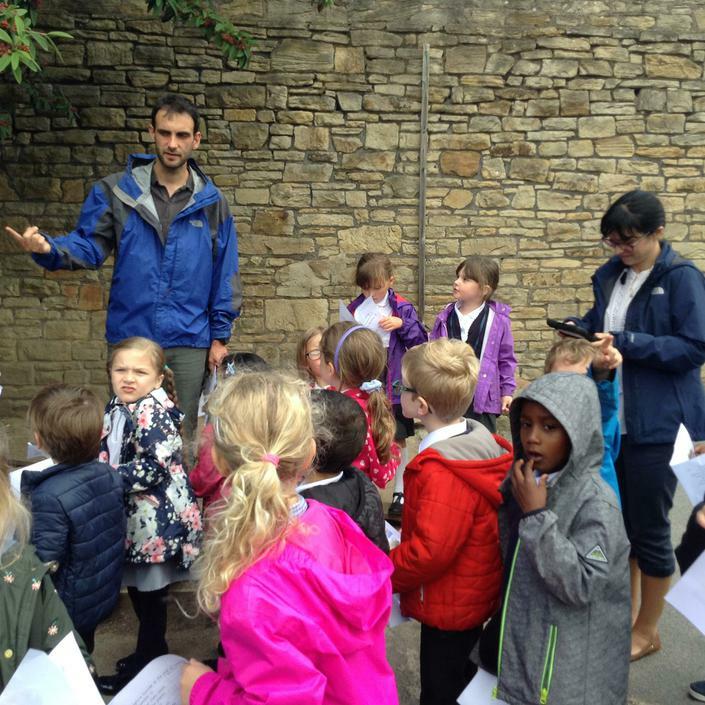 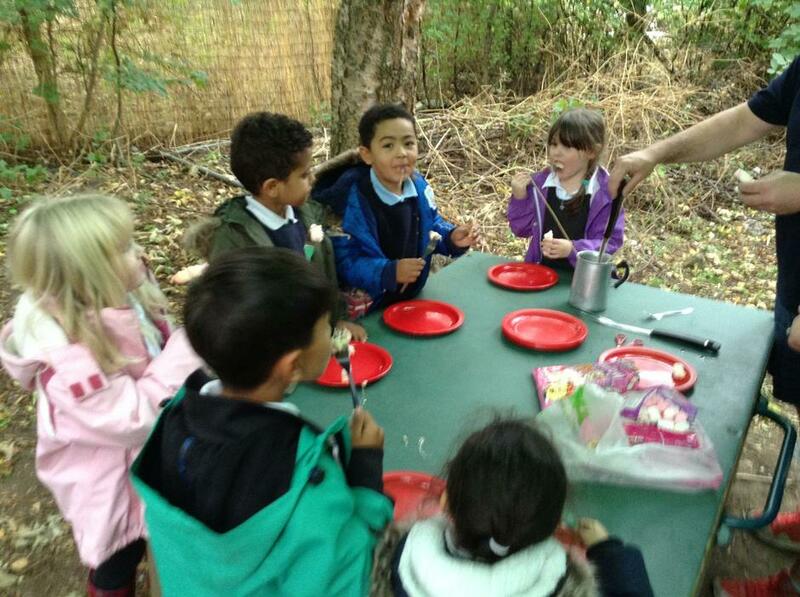 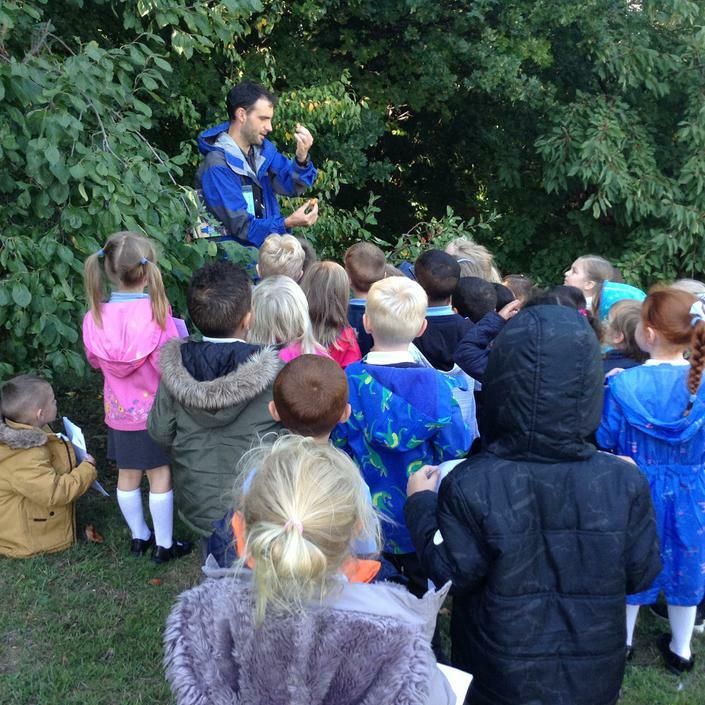 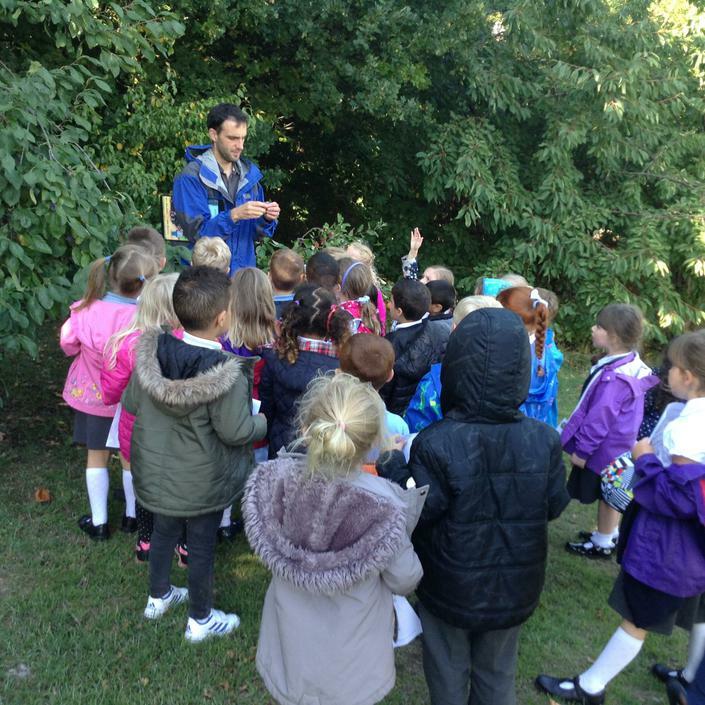 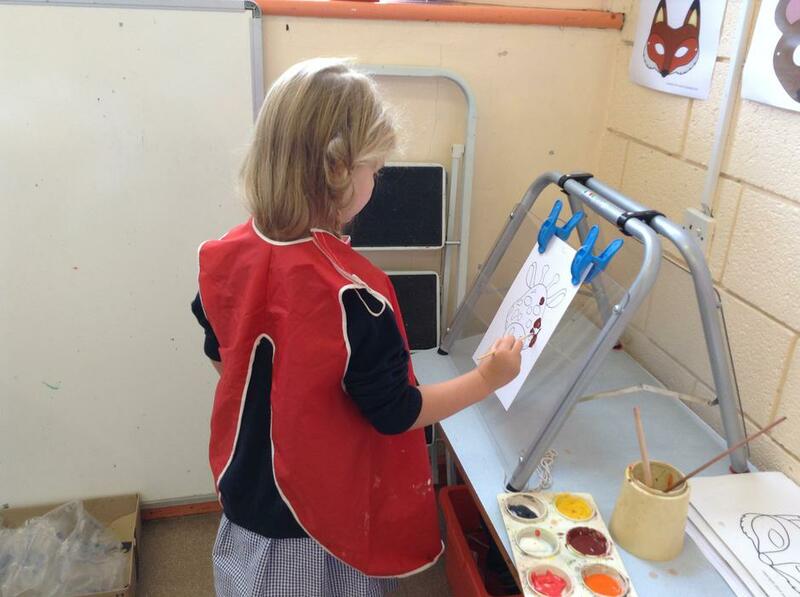 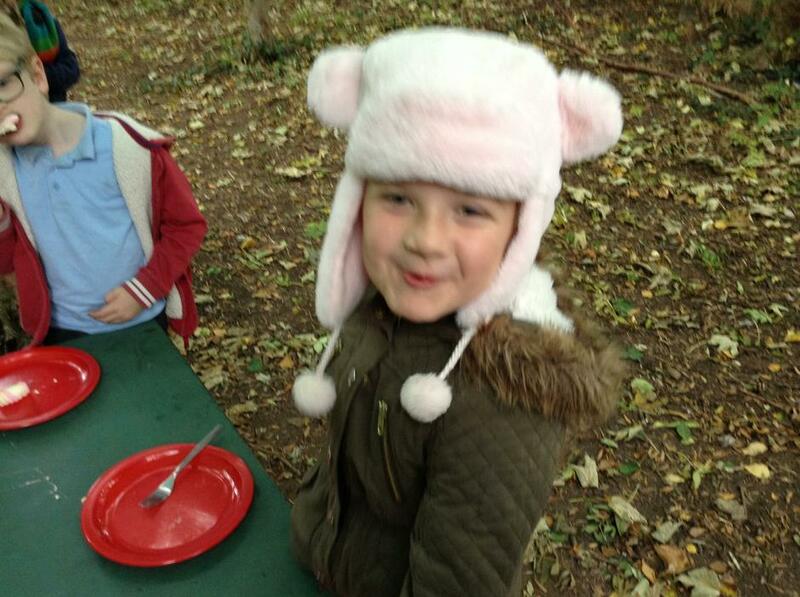 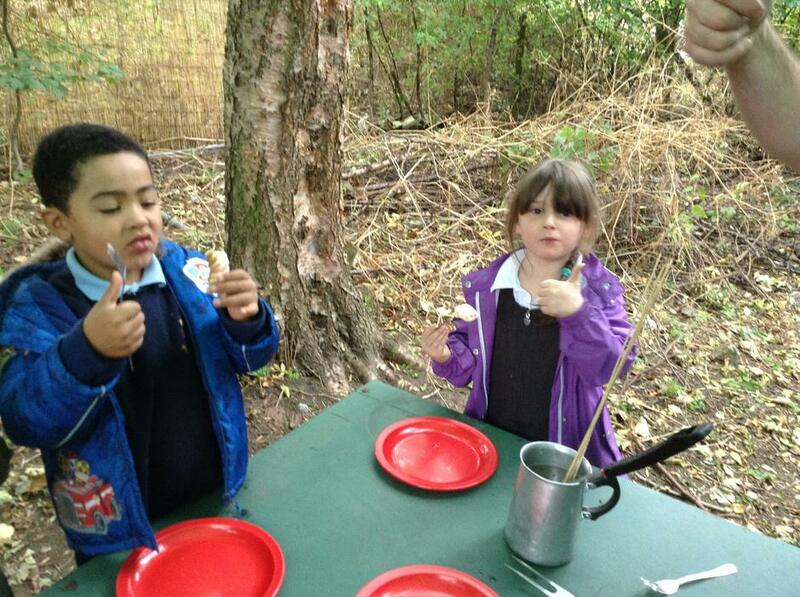 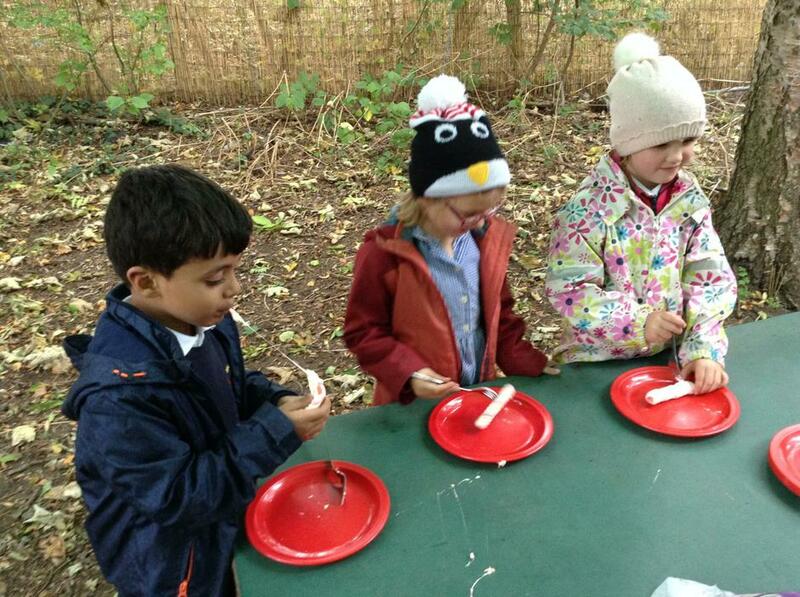 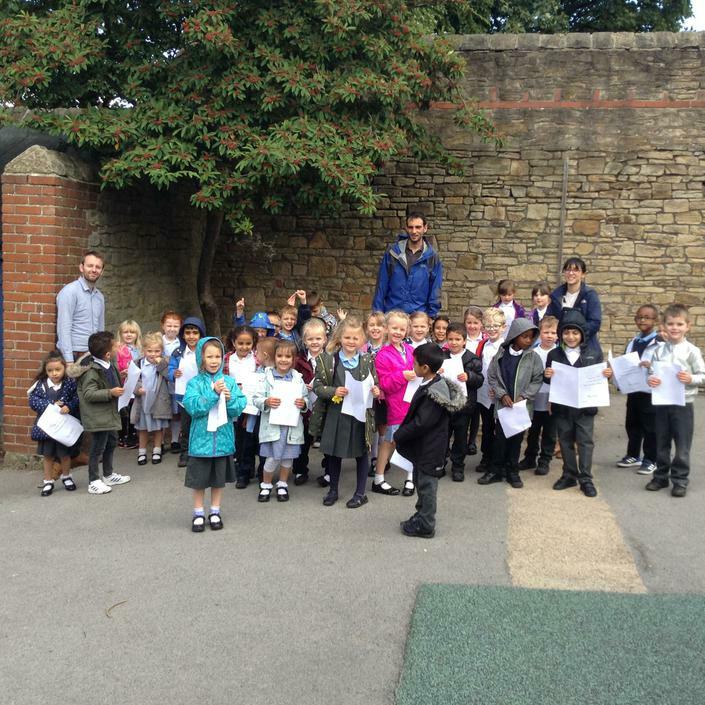 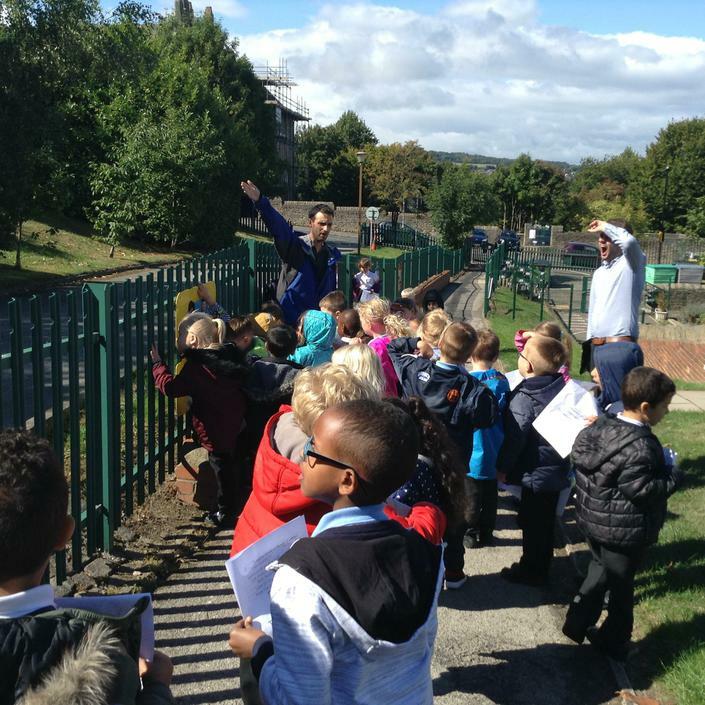 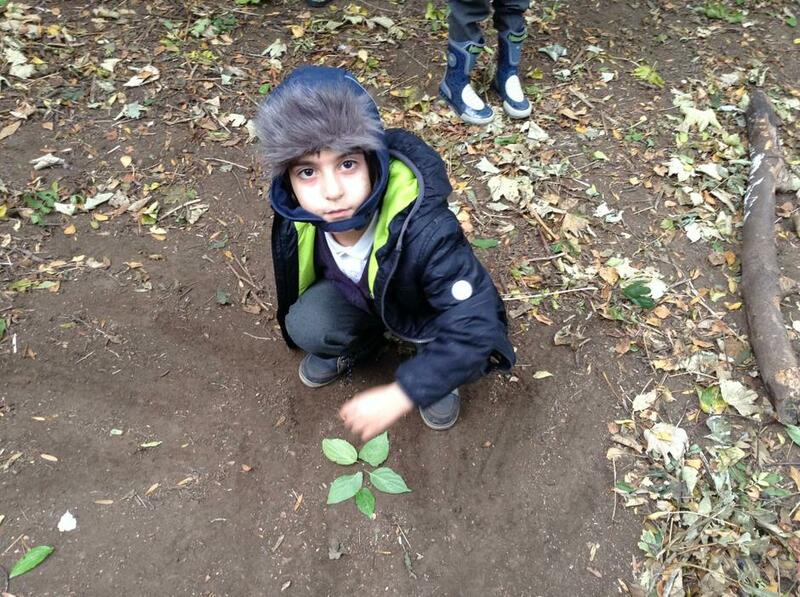 The Learning objective was to recognise aspects of the natural world which you find wonderful. 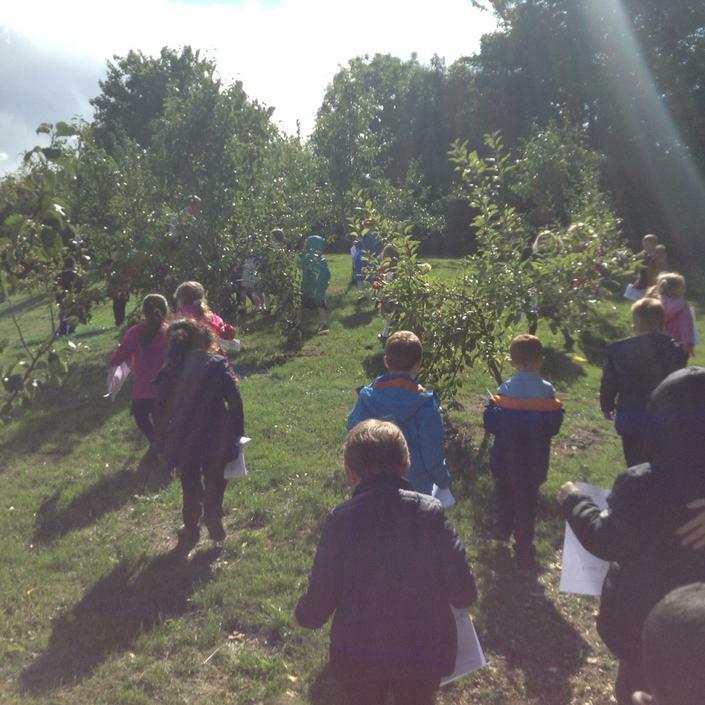 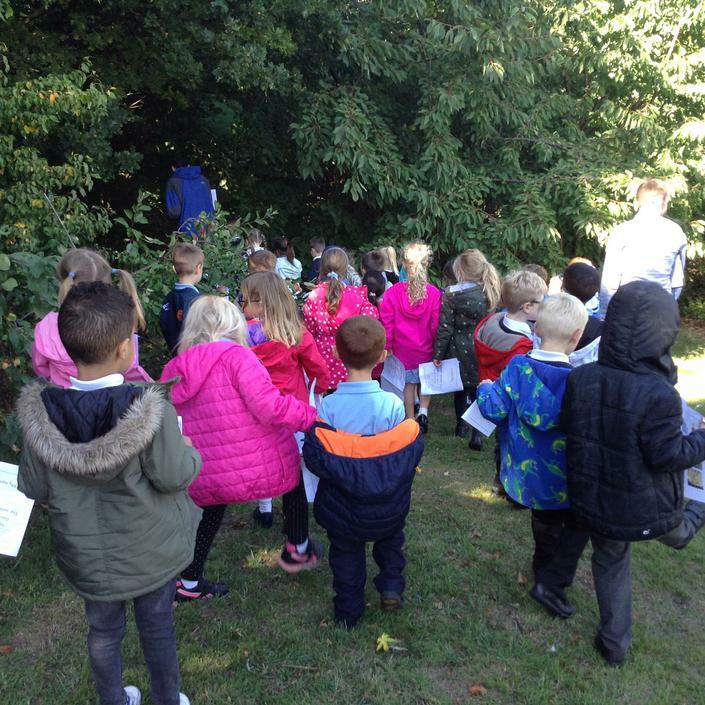 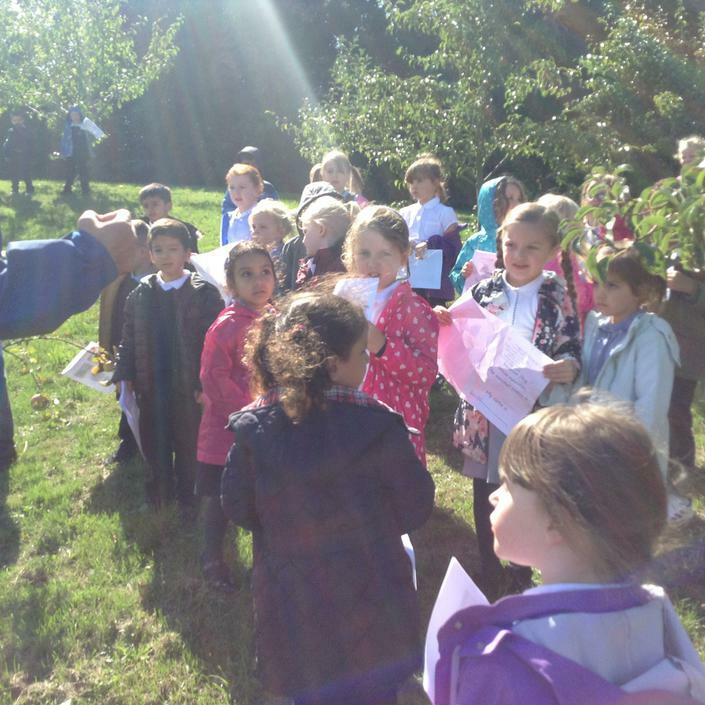 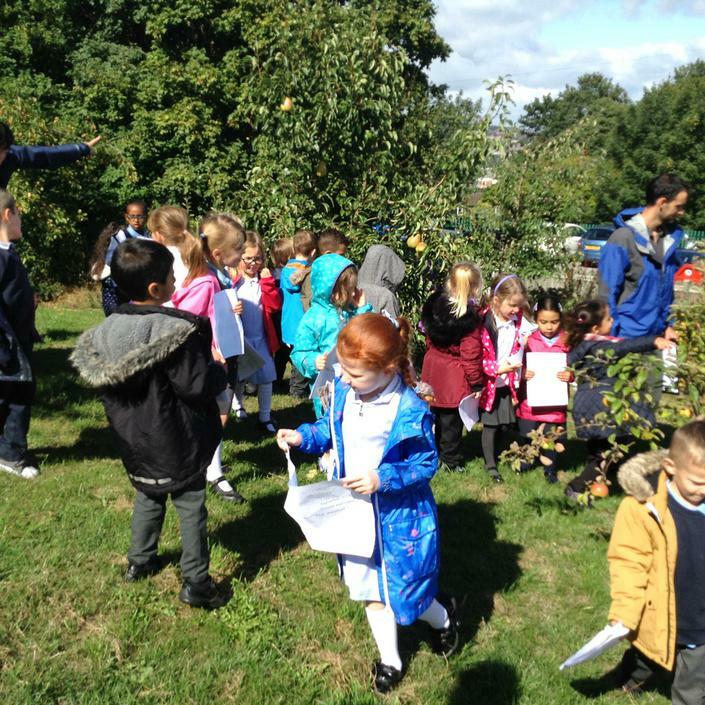 We went outside to the forest school to smell the earth, look at the sky, feel the trees, hear the birdsong and even tasted the fruit. 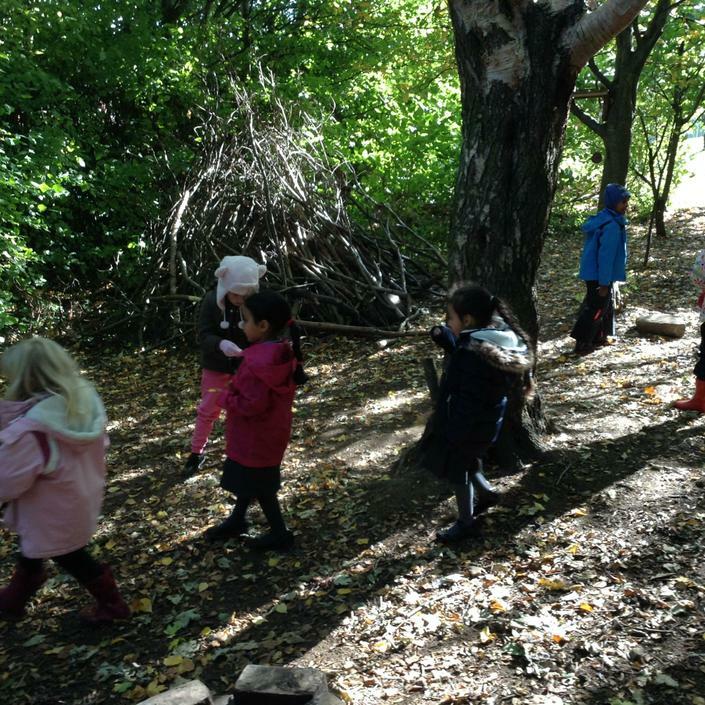 The children then looked at digital images of the natural world and shared vocabulary to express how it made them feel. 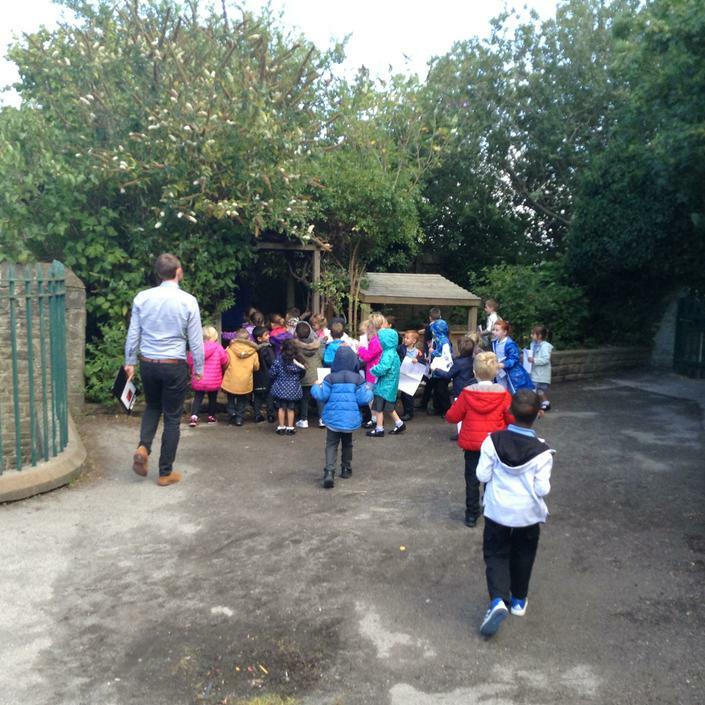 Well it's been an amazing first week at Walkley and we've had a fabulous week of learning in The Smartest Giants. 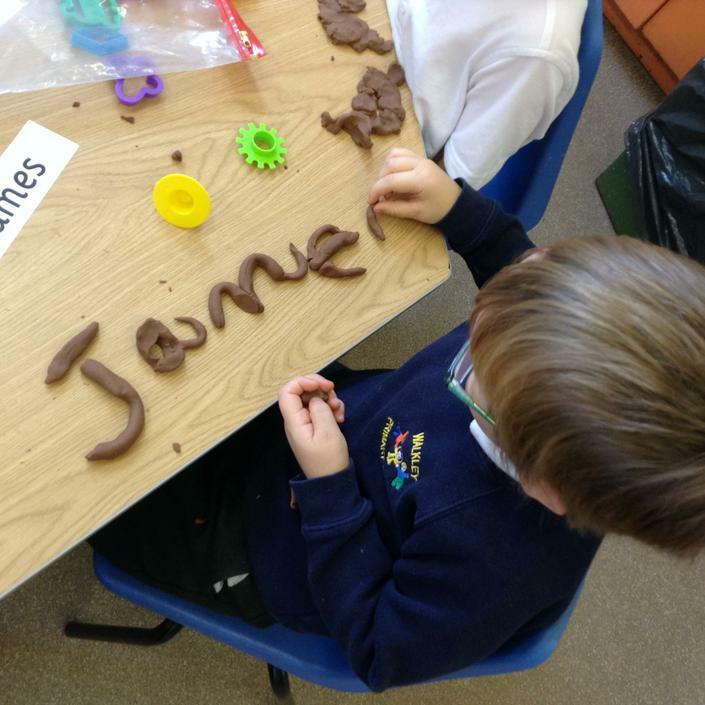 Not only have the children dived head first into their learning, but Mrs Goldsmith and myself have been learning all about the children and how they like to engage with the classroom. 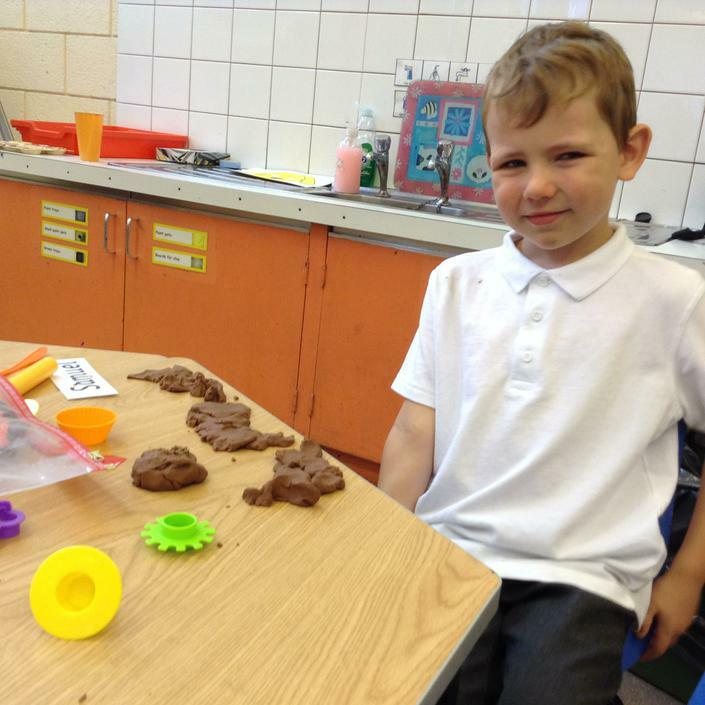 We're currently waiting for delivery of our water tray and sand tray. 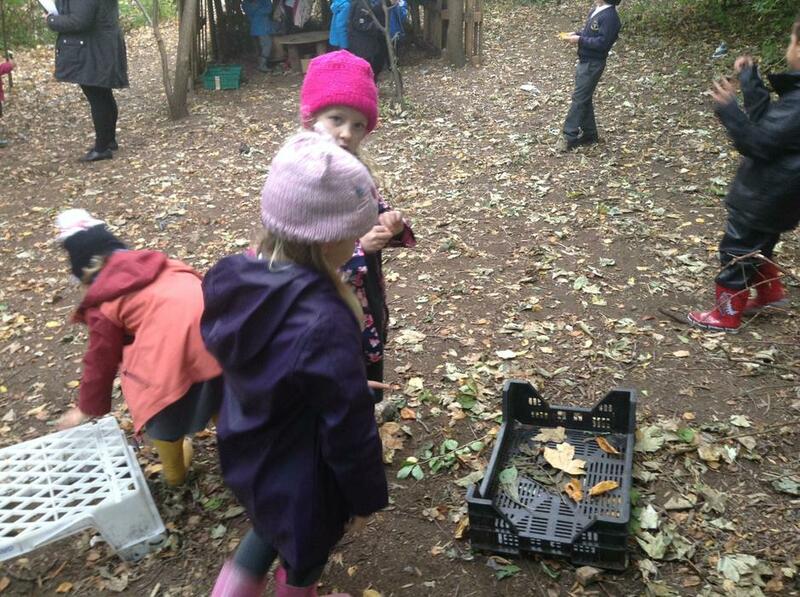 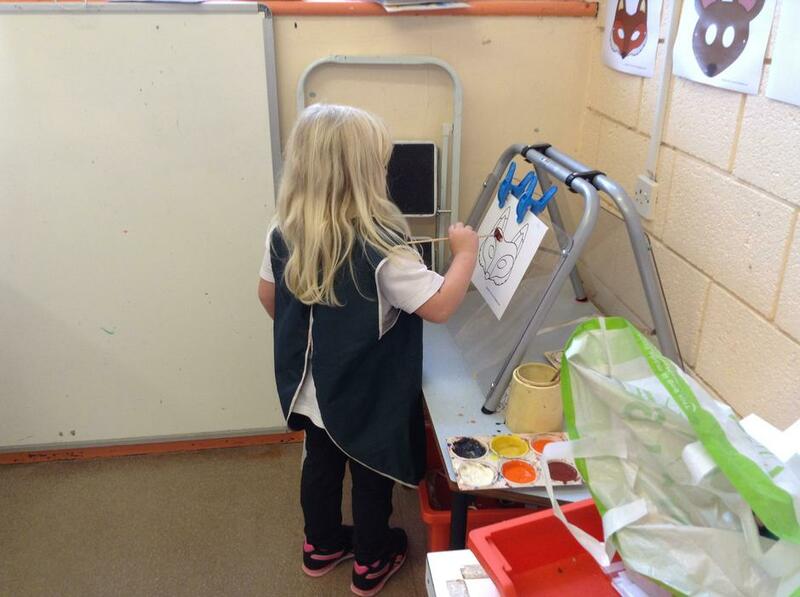 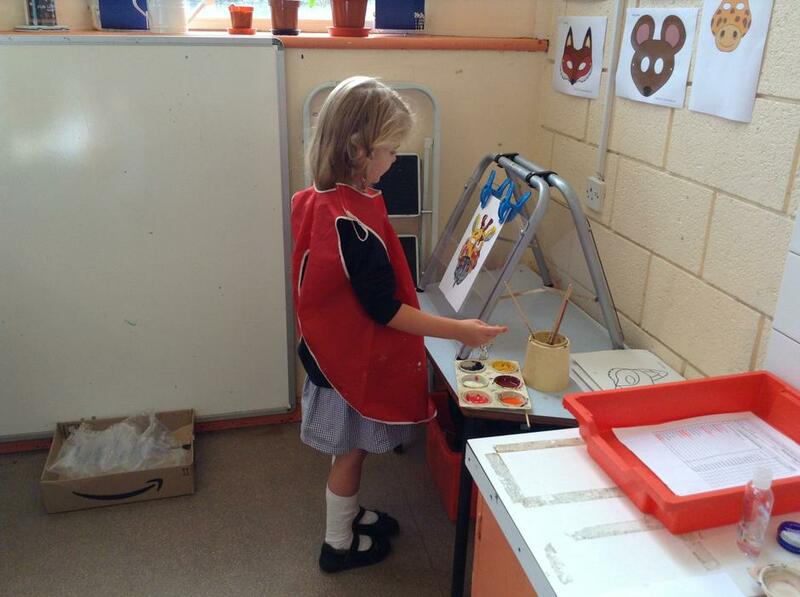 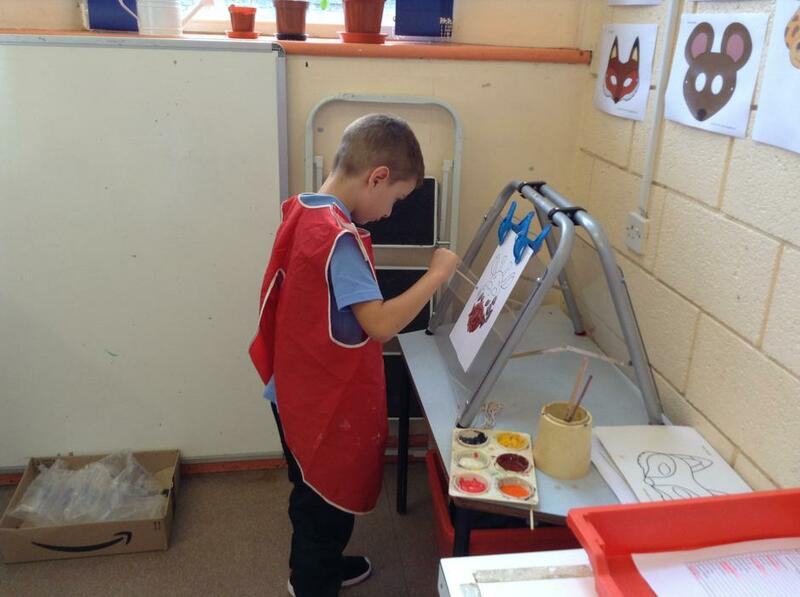 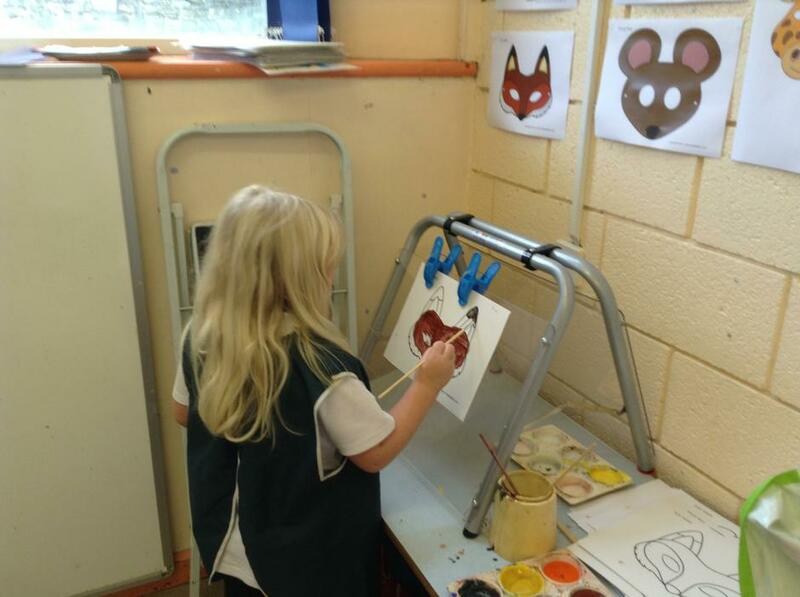 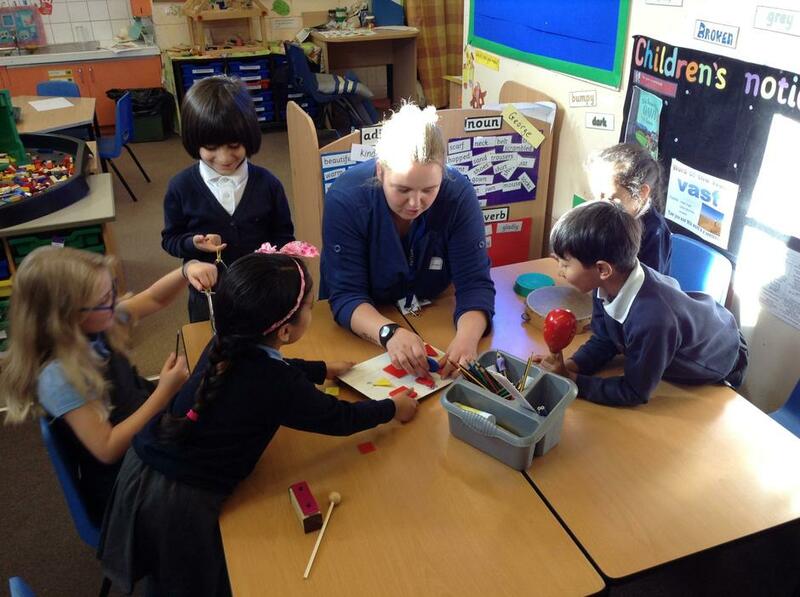 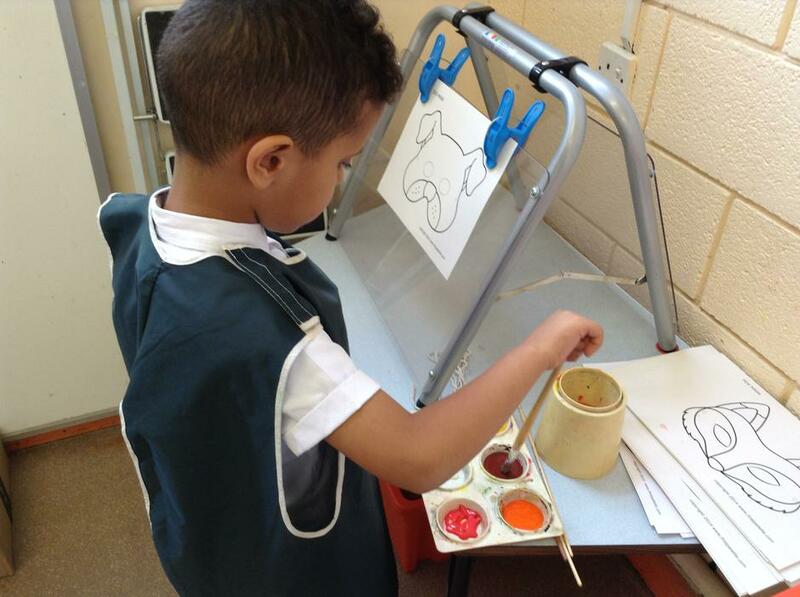 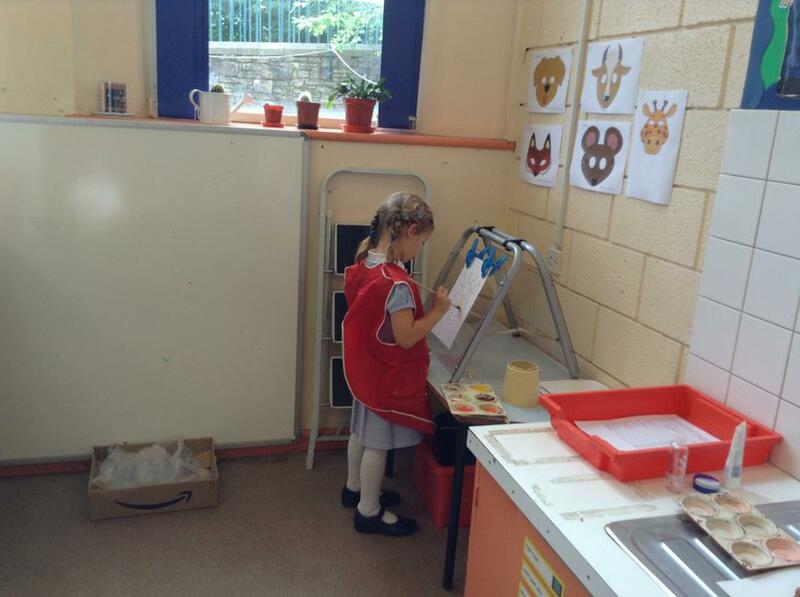 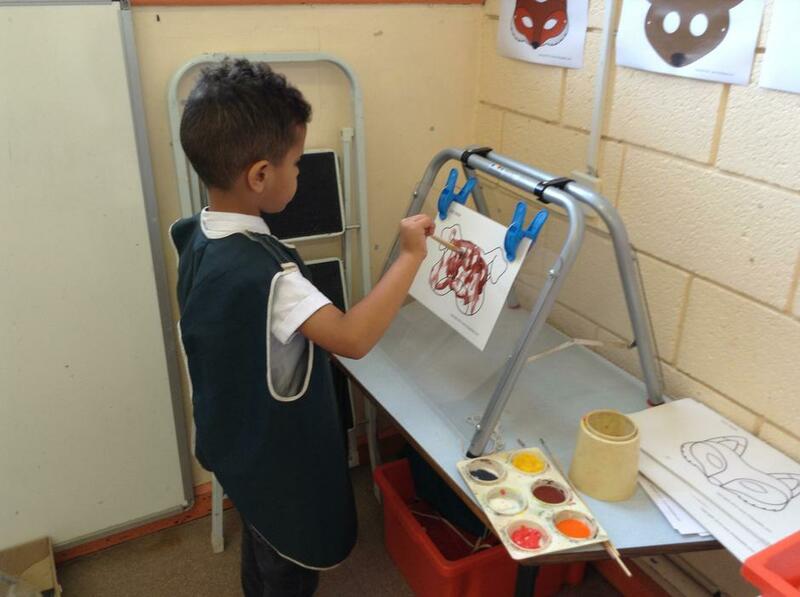 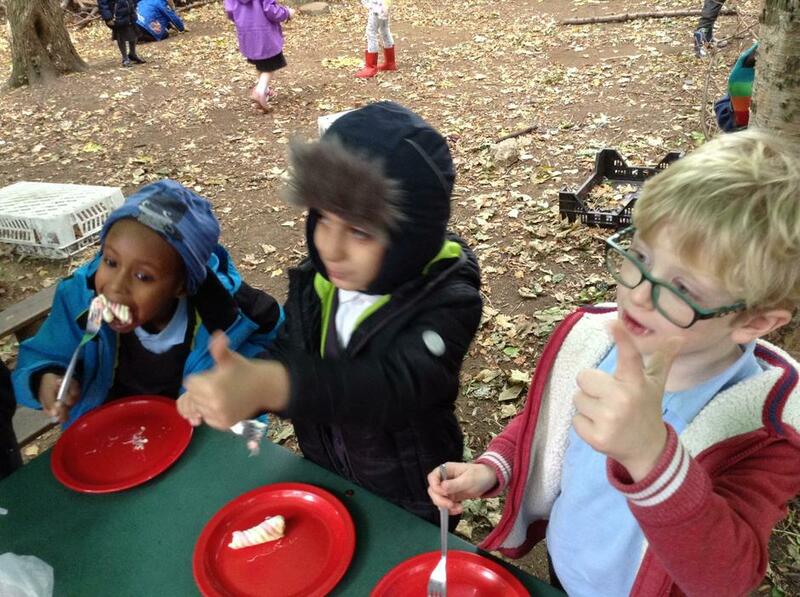 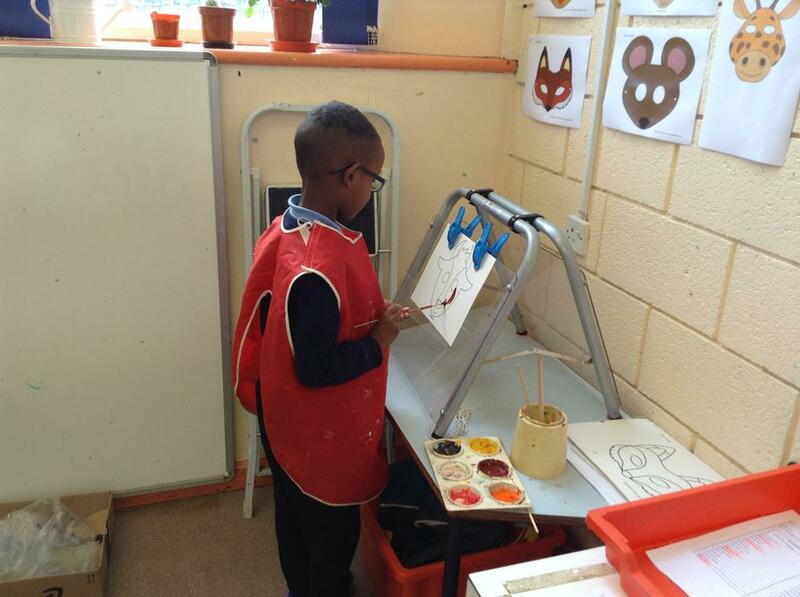 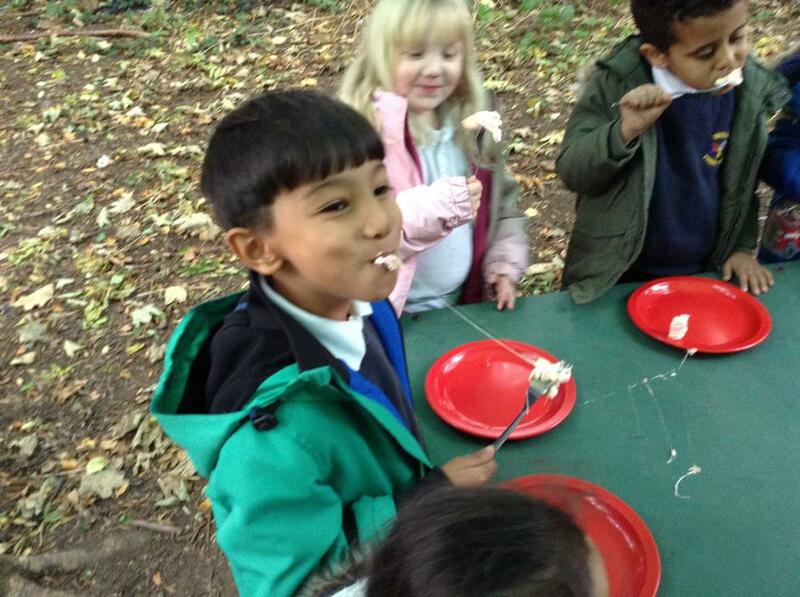 However, the continuous provision has been available to support their learning and they have got stuck in! 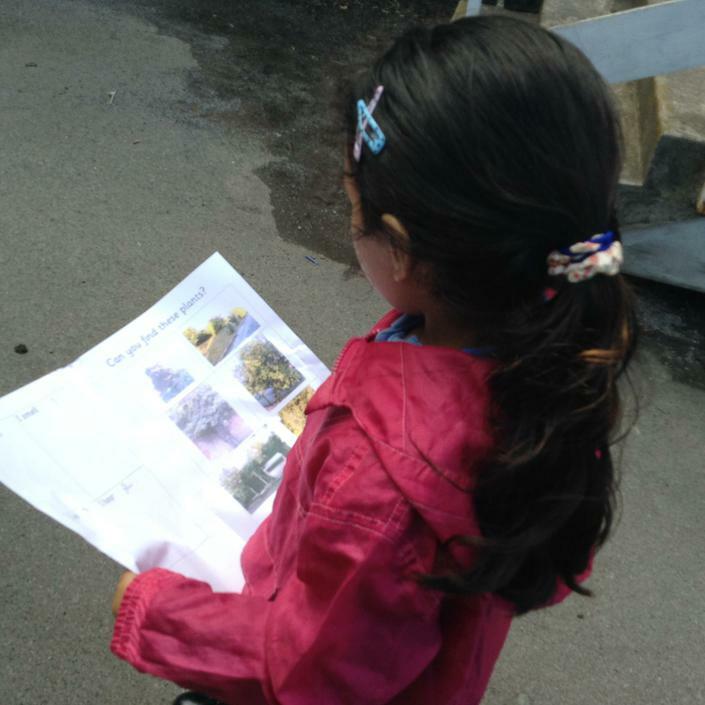 Our topic this term is our class book: The Smartest Giant in Town. 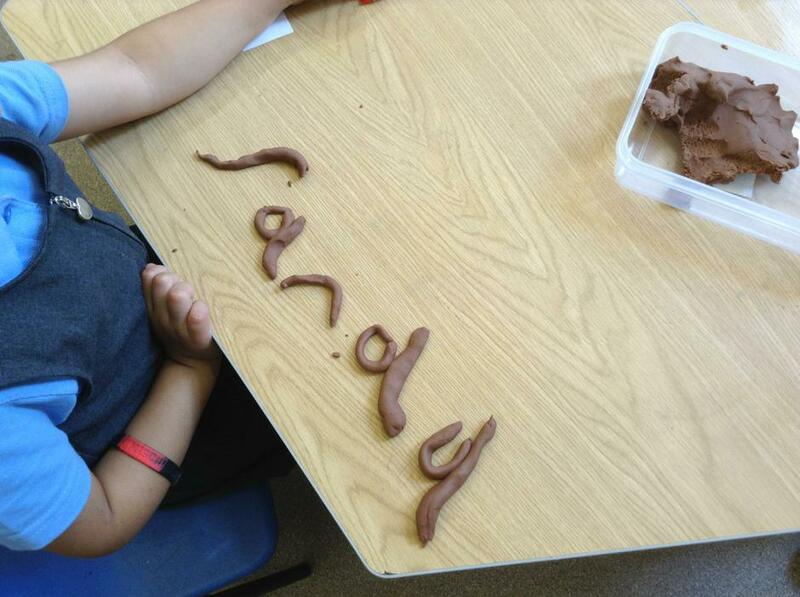 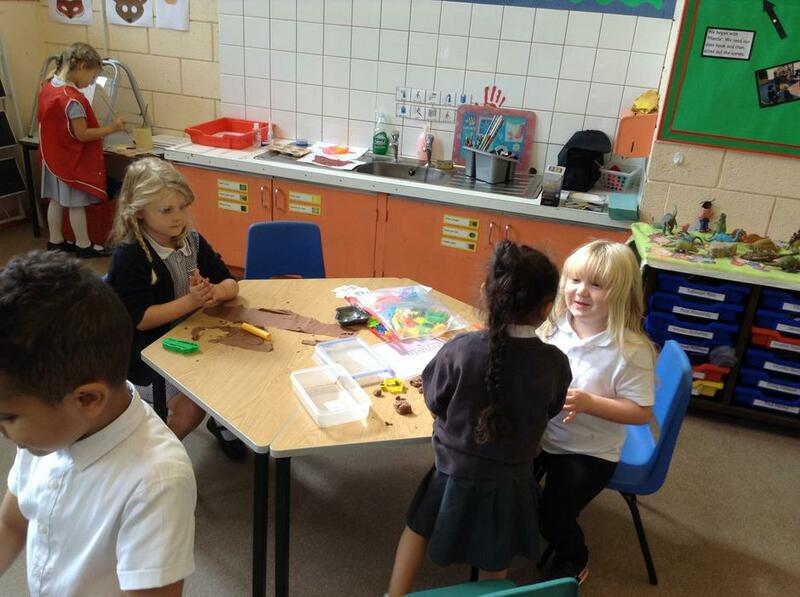 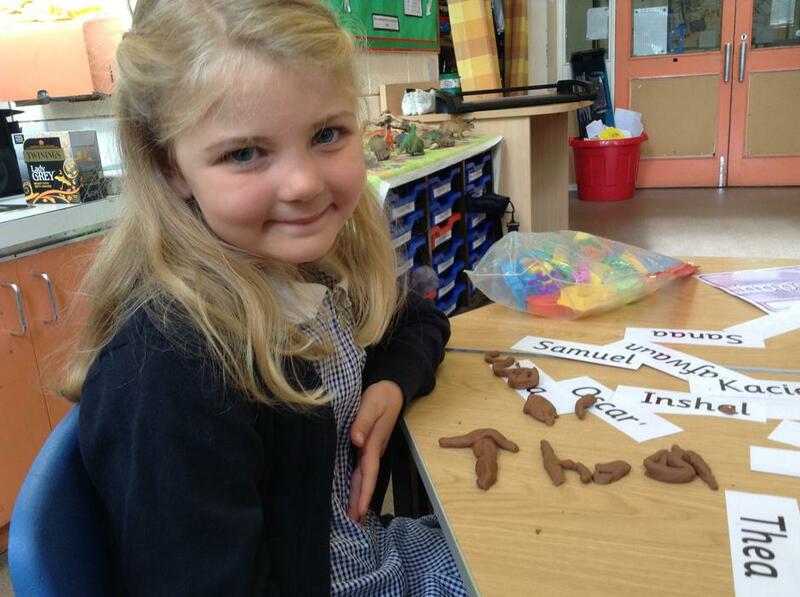 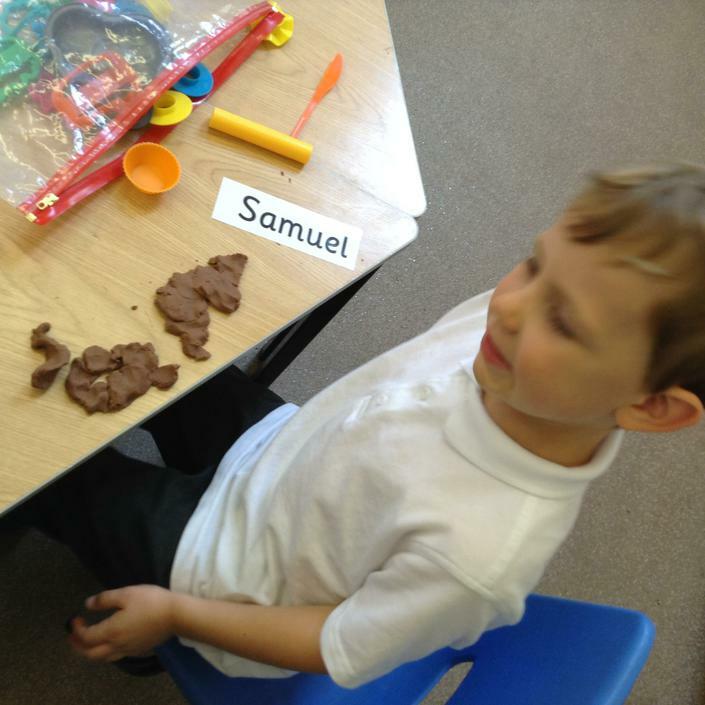 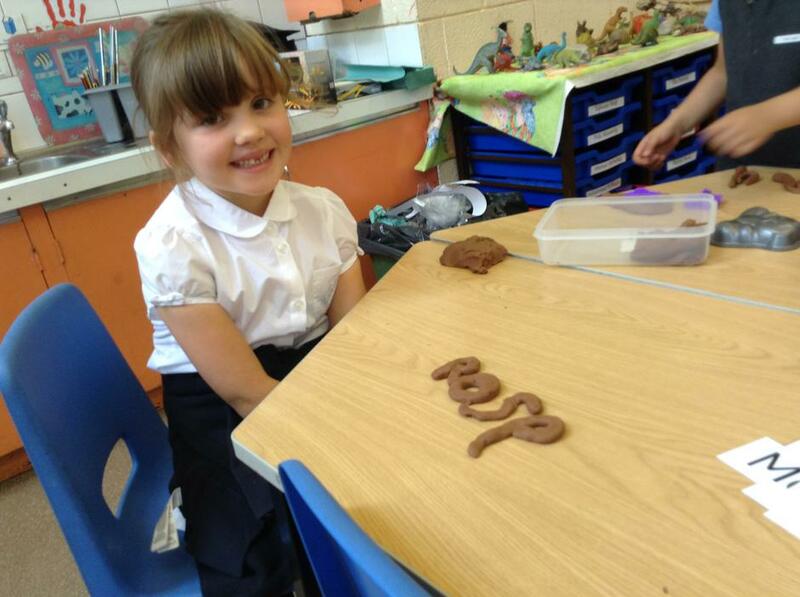 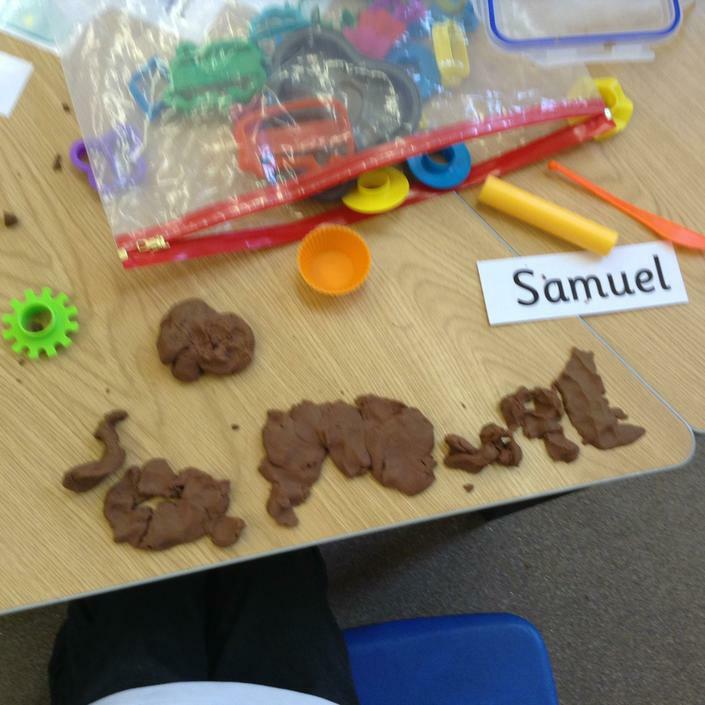 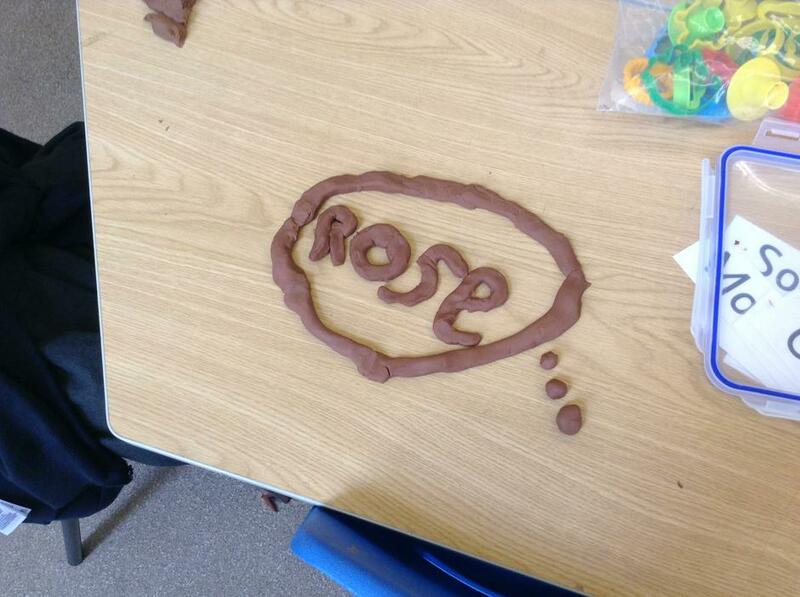 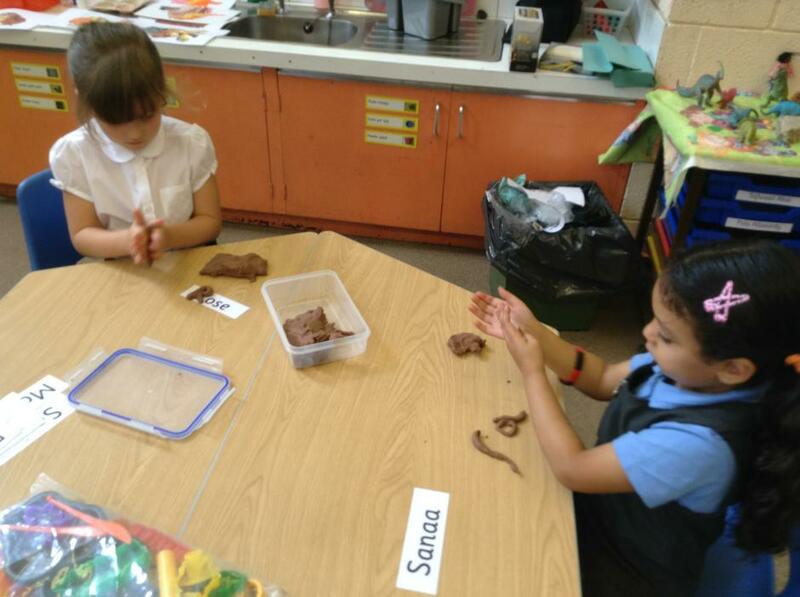 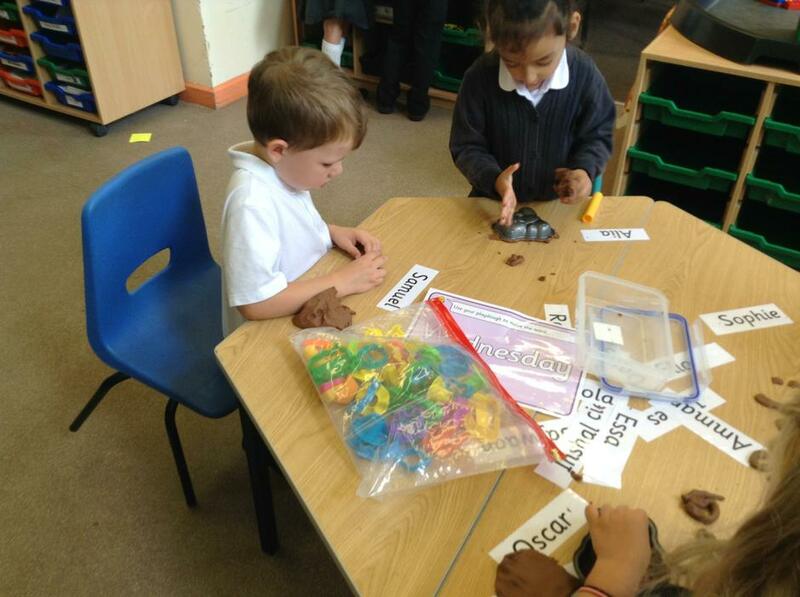 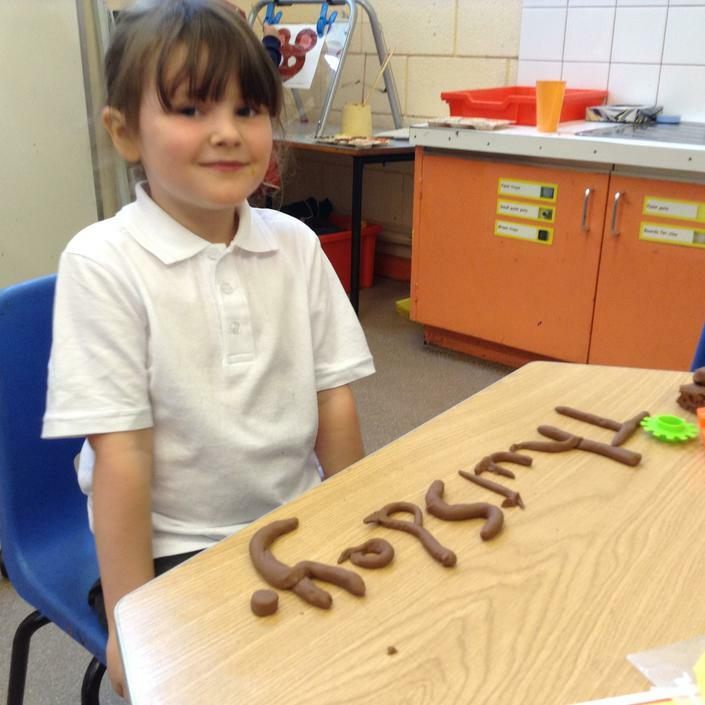 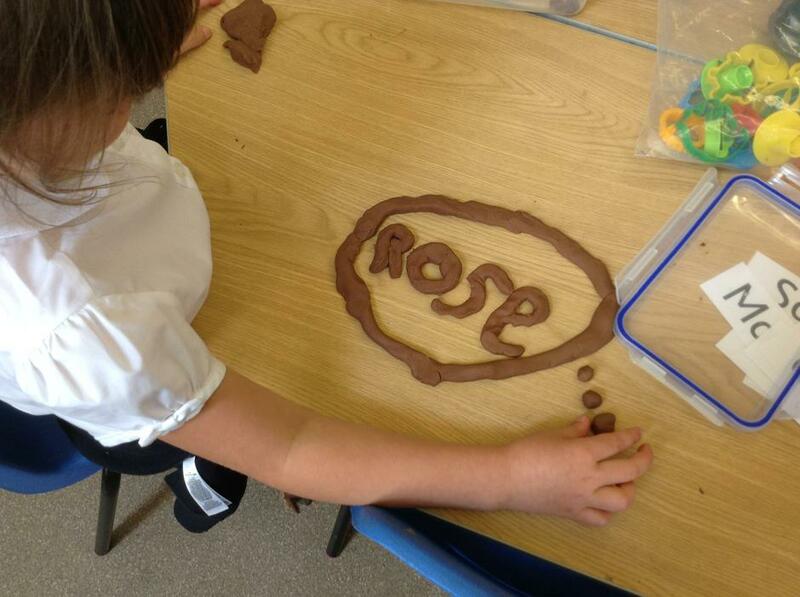 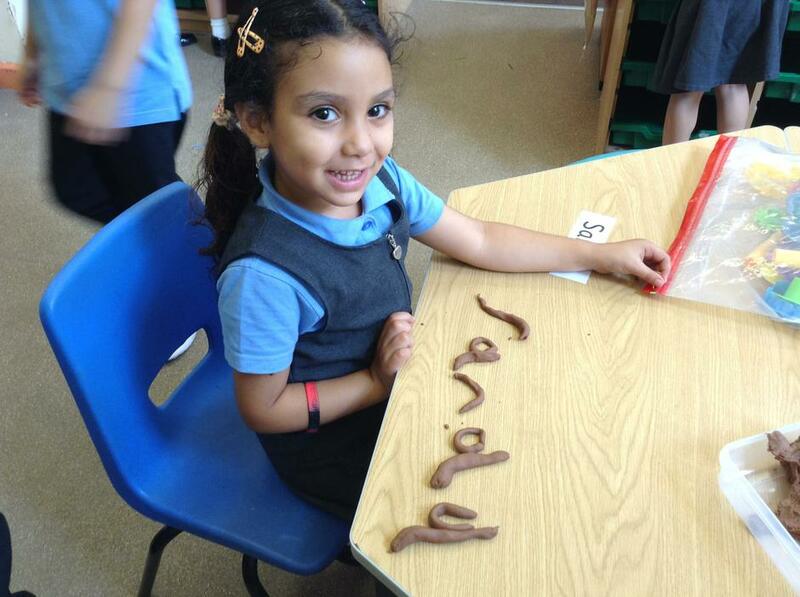 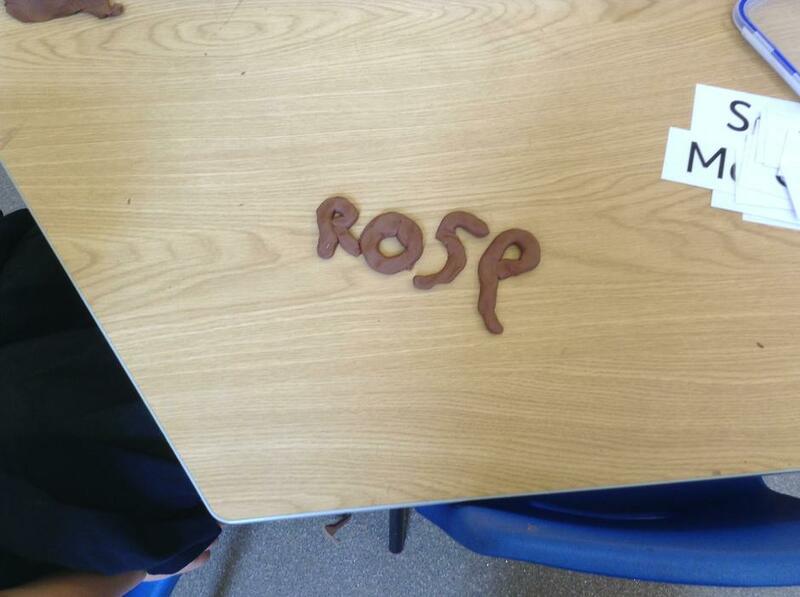 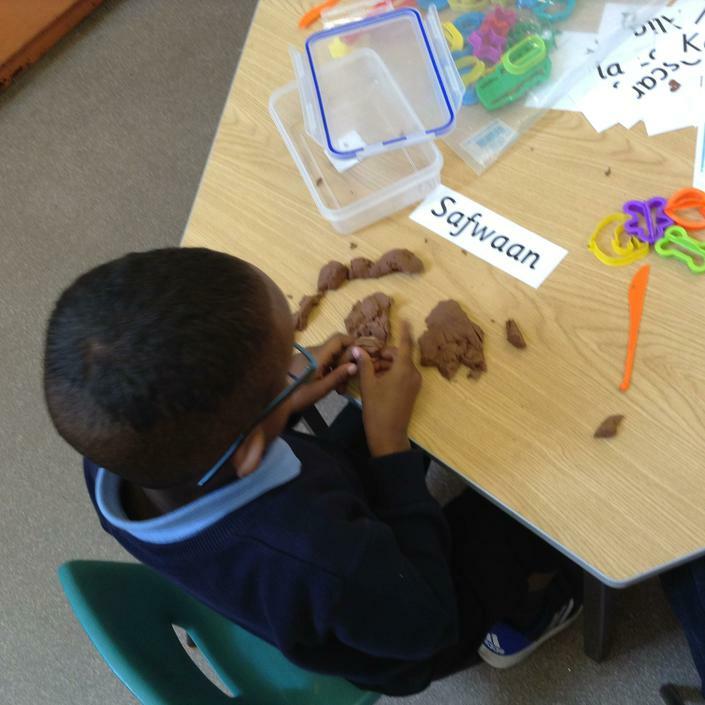 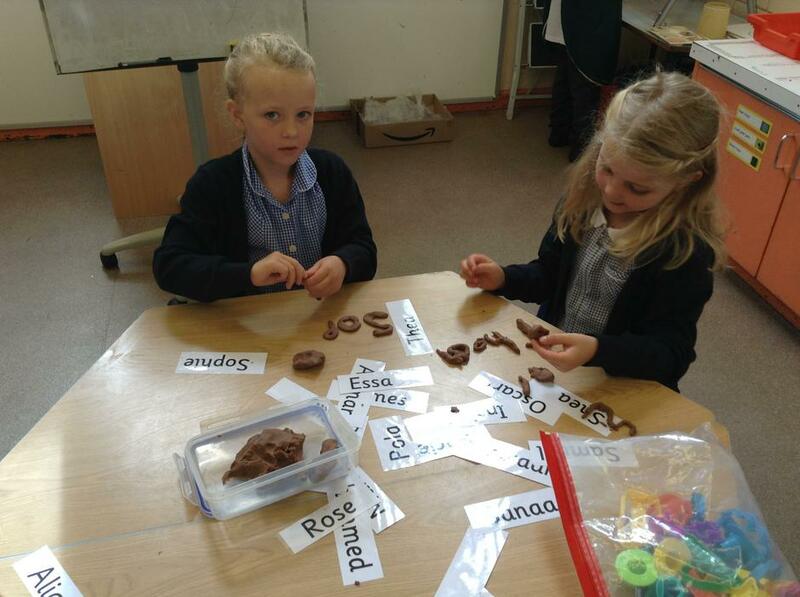 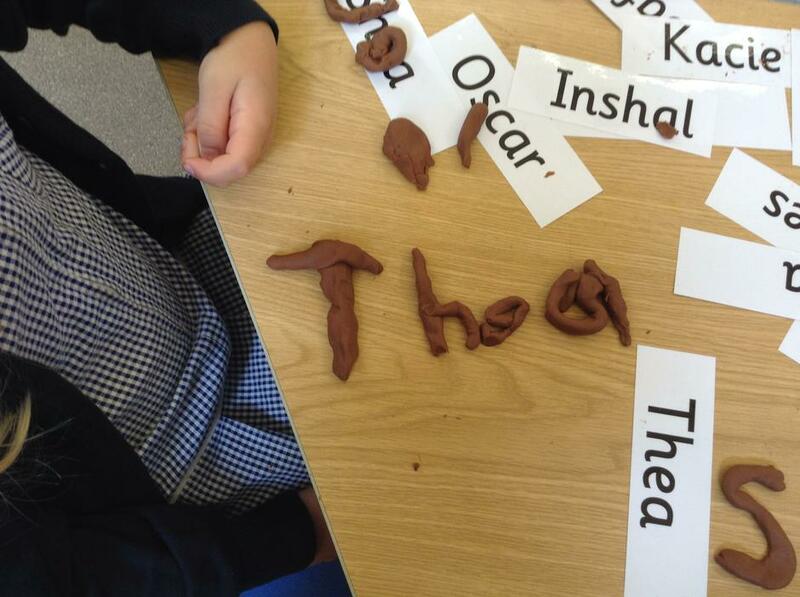 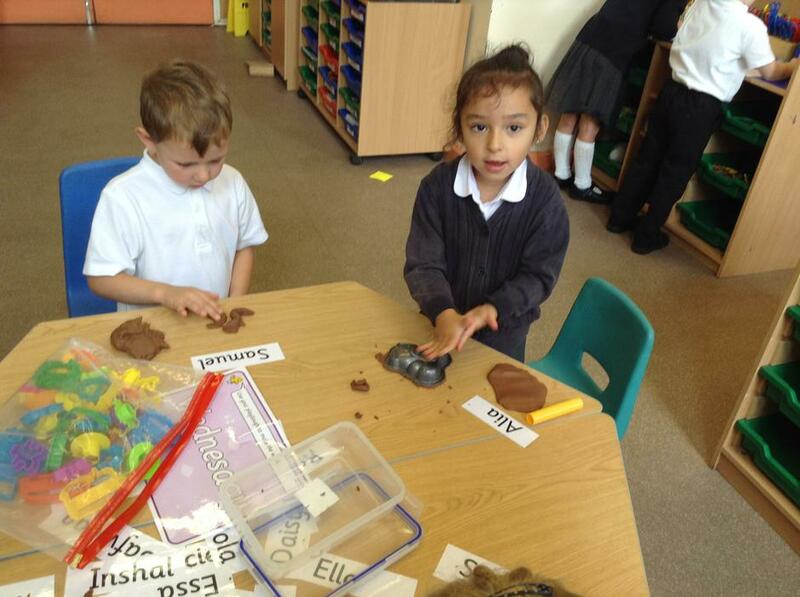 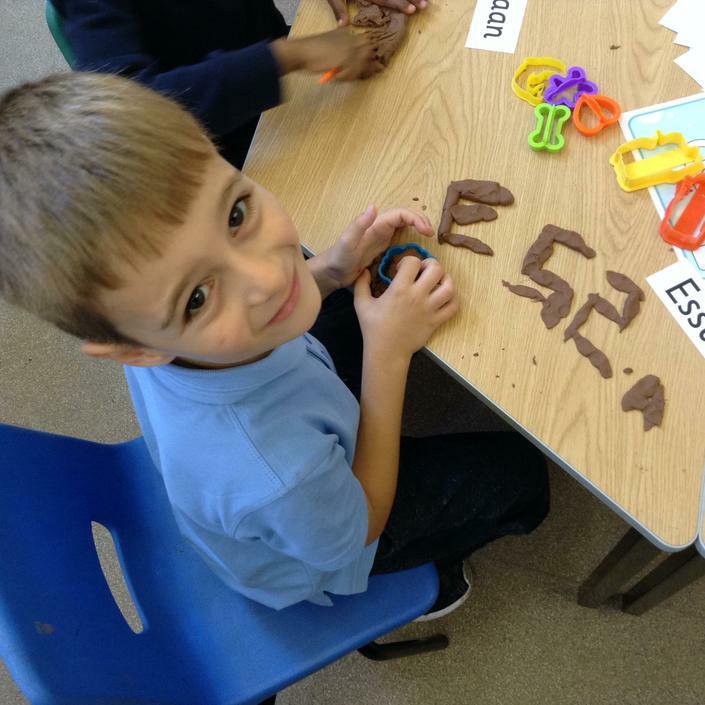 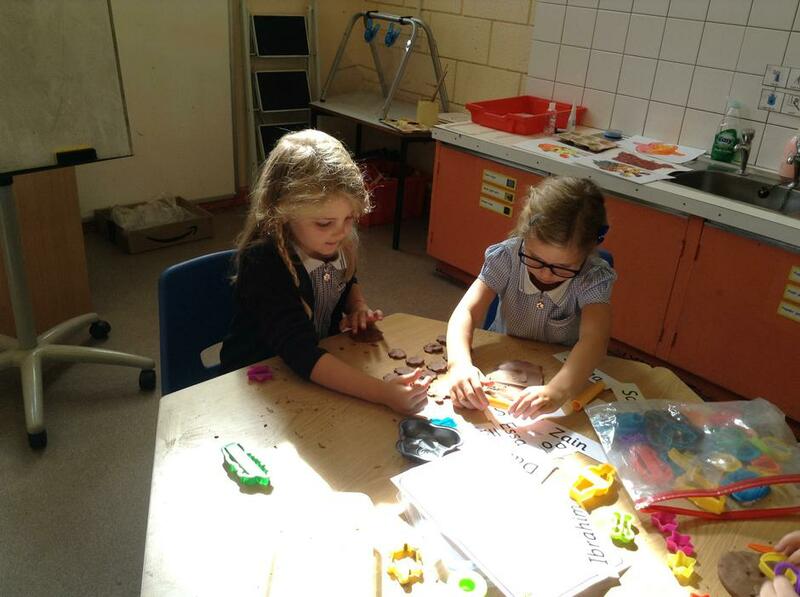 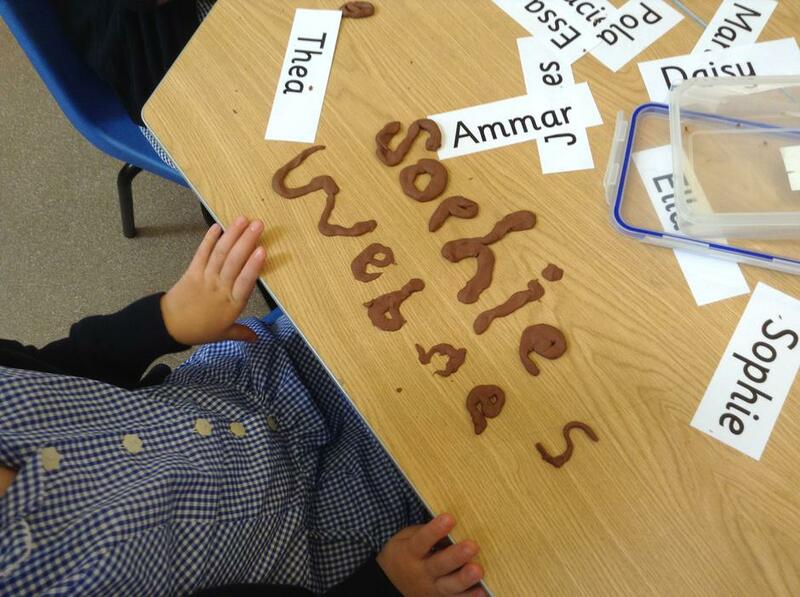 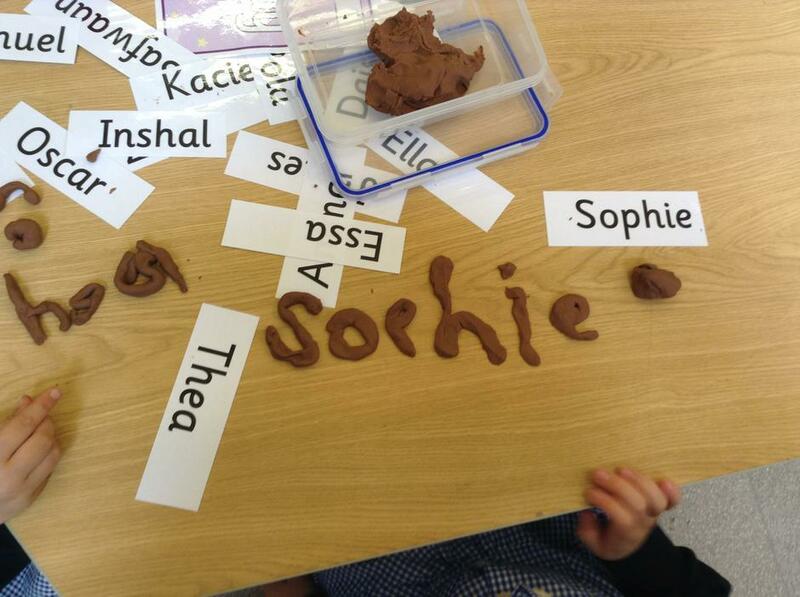 Play dough is available to the children in order to help them with their literacy. 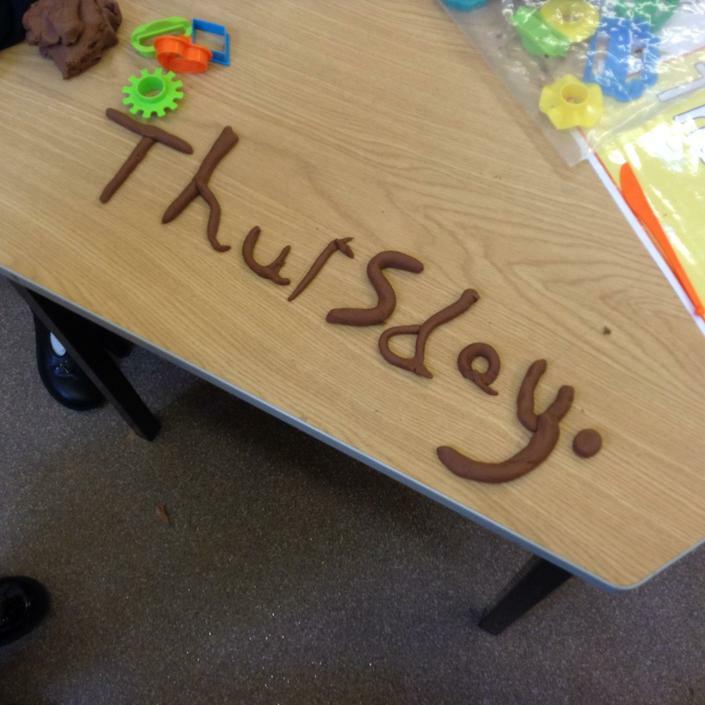 Not only does it improve their fine motor skills, but it also helps them with letter formation. 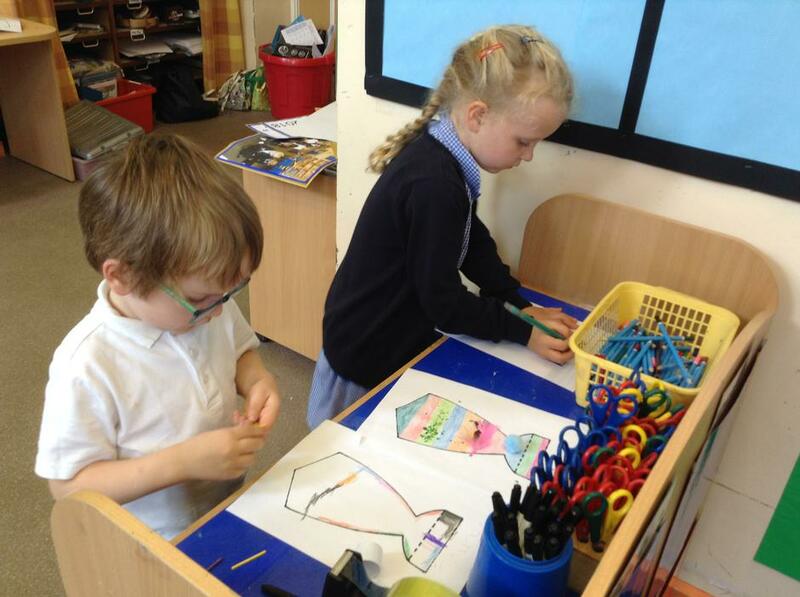 In the design and technology curriculum, children need to develop the ability to plan their projects, choose suitable materials and then make their designs. 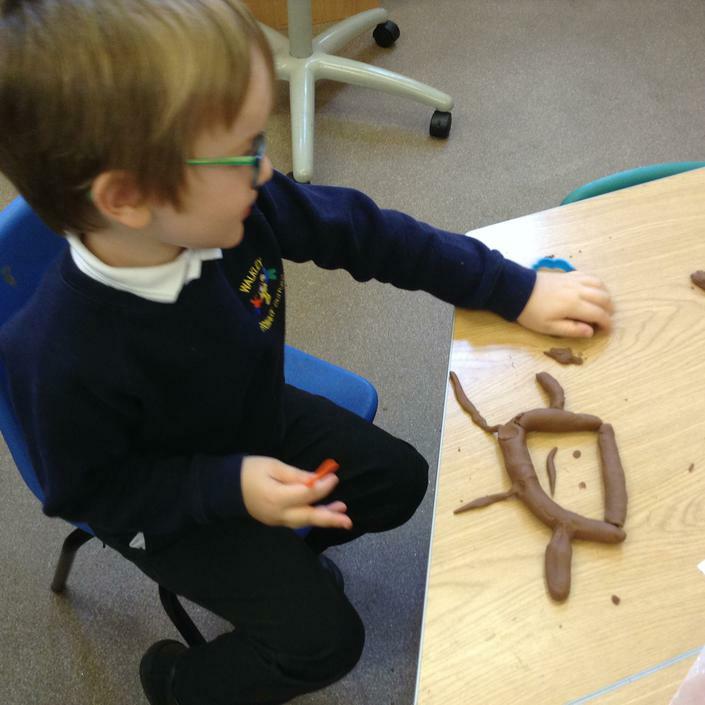 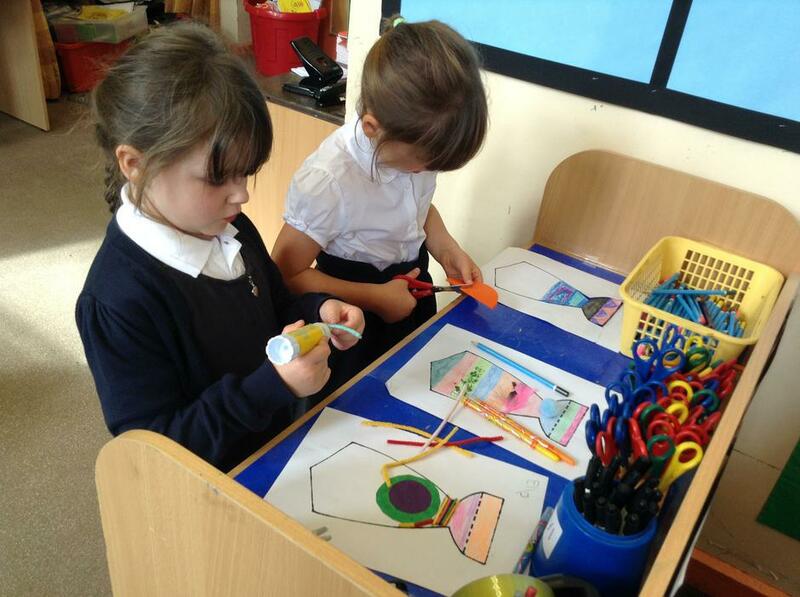 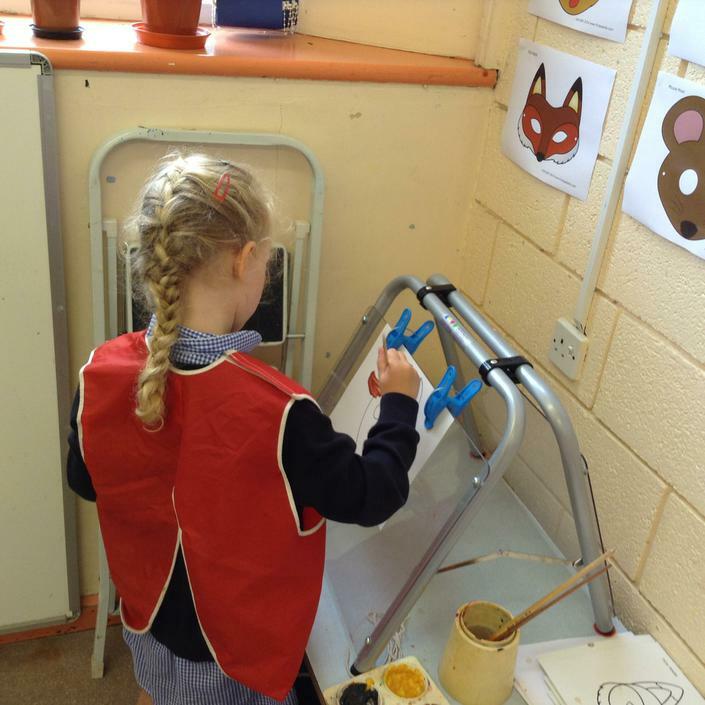 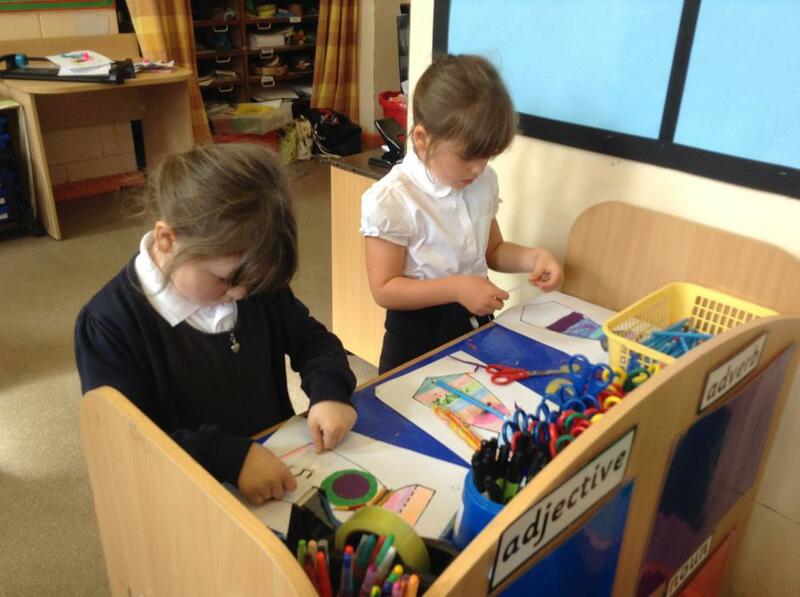 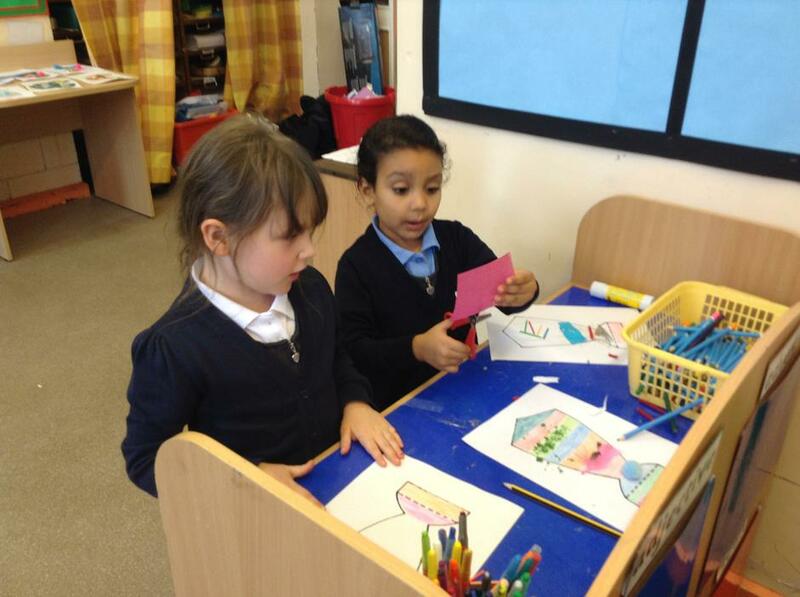 The Giants were making their own smart ties using lots of different materials.